Here is a roadside scene that is typical in this area at this time of year. There are dark and light purple New England asters, white asters which I haven’t identified, and of course plenty of yellow goldenrod. New England asters (Symphyotrichum novae-angliae) are everywhere now and as I’ve said in previous posts, they are our biggest, most showy aster. Some tower up over my head. 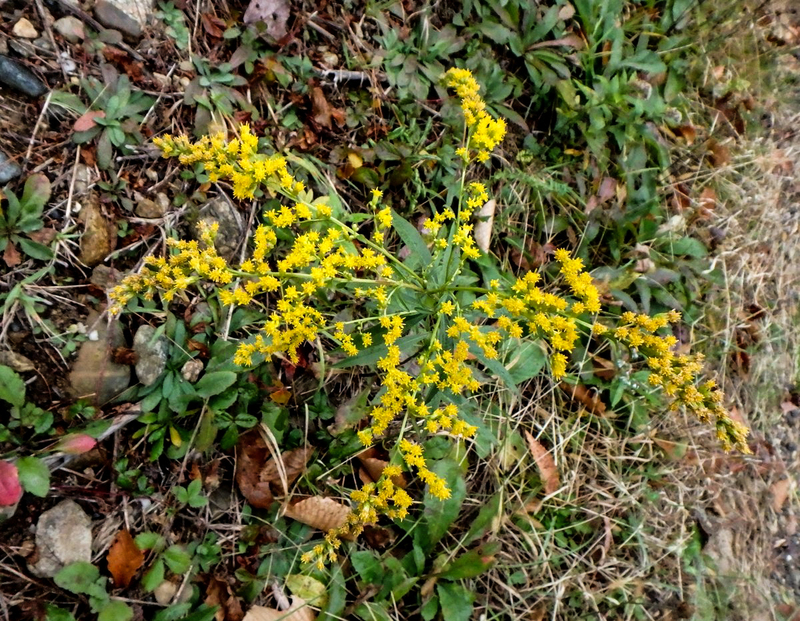 A goldenrod that I see a lot of is downy goldenrod (Solidago puberula.) The leaves have a downy coating and that’s where its common name comes from. They reach about a foot and a half tall on a good day, but some books say they will reach 3 feet. The narrow, stalked flower heads (panicles) grow on plants that live at the edges of forests in dry sandy soil, often in colonies of 15-20 plants. The bright yellow 1/4 inch flowers of downy goldenrod seem big when compared to other goldenrod flowers. 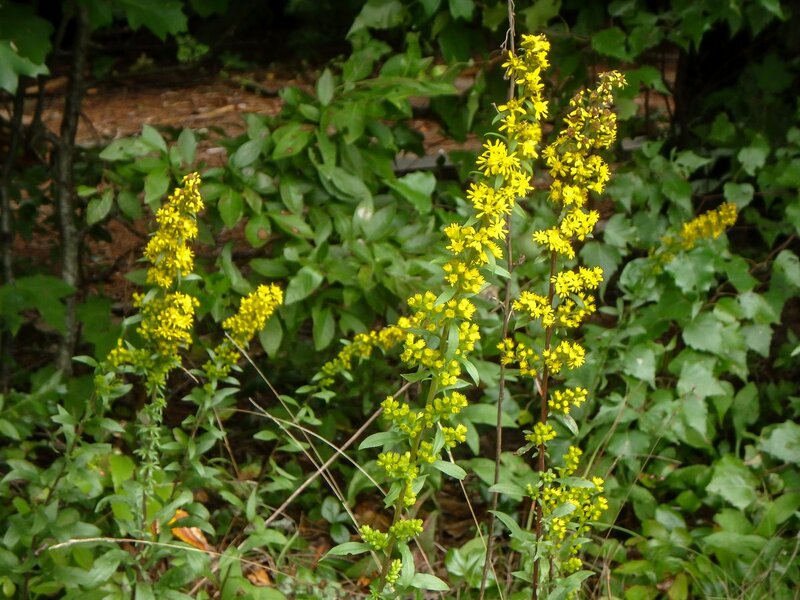 Native Americans used goldenrod for treating colds and toothaches and it has been used for centuries in to treat kidney stones and urinary tract infections. In colonial times goldenrod growing naturally by the cottage door meant good fortune. 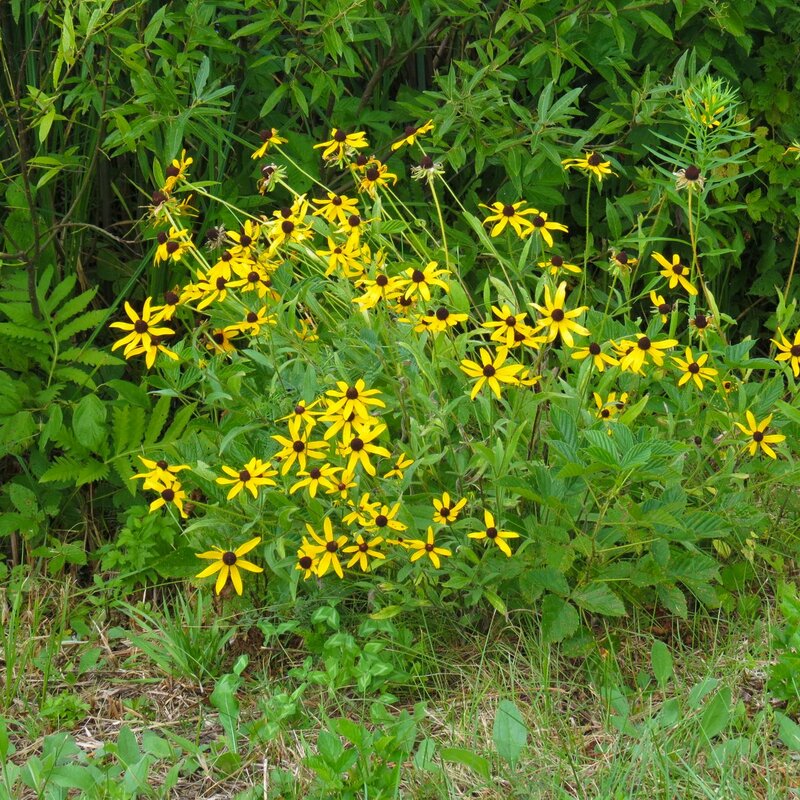 Black eyed Susans (Rudbeckia hirta) are another flower with a long bloom time but they’re getting sparse now and you have to search to find them in this area. Though they start blooming in June I always think of them as a fall flower, so when I see them in June I always have to ask them do you have to remind me so soon? Summer just started! I forgive them for trying to make time pass so quickly though because they’re so cheery, even in June. I wanted to show purple stemmed beggar’s Ticks (Bidens connata) again because the last time I showed it here you couldn’t see the purple stem. This is a plant that teaches patience because it suddenly appears in late July and grows for several weeks before it flowers. There are nearly 200 species in the genus and many of them look nearly identical. 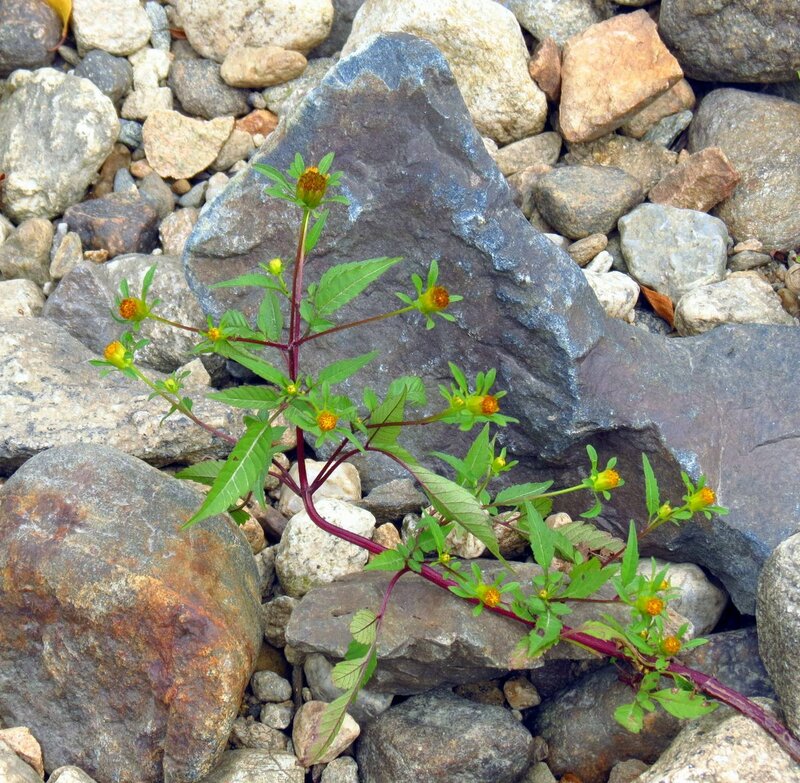 In this part of the state this plant grows side by side with the nodding burr marigold (Bidens Cernua,) which is also called smooth beggar’s ticks and looks very similar. 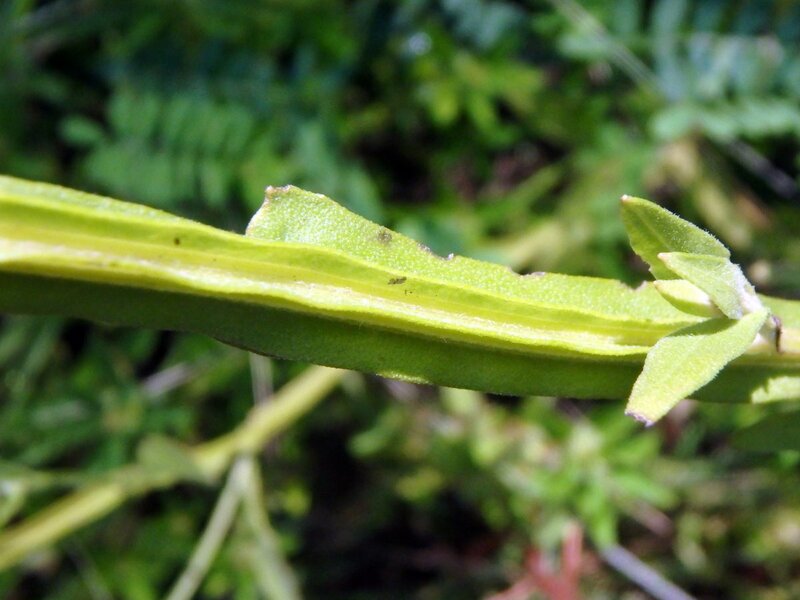 The plant gets its common name from the way its barbed seeds cling to clothing. Books say that it reaches 3 1/2 feet tall but I’ve seen some get close to six feet. The one in the photo is more typical of its often sprawling habit. I’ve also seen these plants growing in water at the edge of ponds. Here is a purple stemmed beggar’s tick blossom fully opened. I think. Beech drops (Epifagus americana) grow in deep shade and can be hard to photograph. This isn’t a good shot but it does show the plant’s growth habit and lack of leaves, which is what I’d like you to see. Beech drops grow near beech trees and are a parasite that fasten onto the roots of the tree using root like structures. They take all of their nutrients from the tree so they don’t need leaves, chlorophyll or sunlight. Beech drops are annuals that die off in cold weather, but they can often be found growing in the same place each year. Tiny pinkish purple flowers with a darker purplish or reddish stripe are the only things found on a beech drop’s leafless stems. 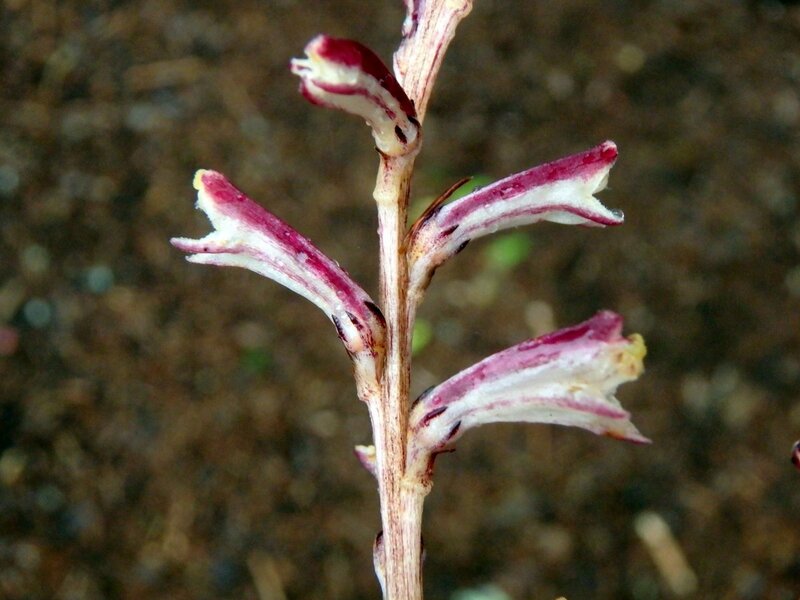 On the lower part of the stem are flowers that never have to open because they self-fertilize. 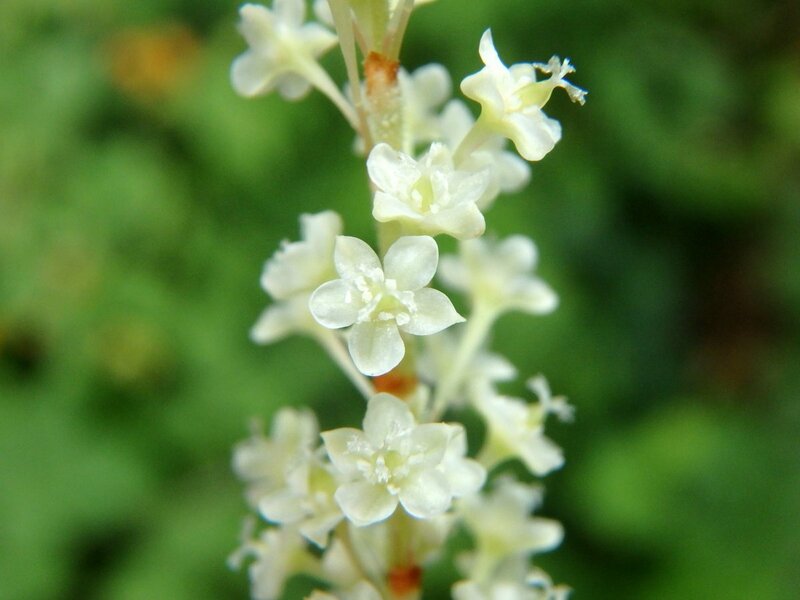 They are known as cleistogamous flowers. On the upper part of the stem are tubular chasmogamous flowers, which open and are pollinated by insects and are shown in the above photo. Though the flowers have reproductive parts science doesn’t know much about which insects pollinate this plant. The pink turtleheads (Chelone lyonii) are blooming in my garden; one of the very last plants to do so. A friend gave me this plant many years ago and I think of her every time I see it bloom. That’s one of the best things about giving and receiving plants; they come with memories. I don’t know the origin of this plant and have never known if it was a native or a cultivar but it does very well and asks for nothing. Pink turtleheads are native to the southeastern U.S. and don’t seem to mind dryness in spite of naturally growing near water. 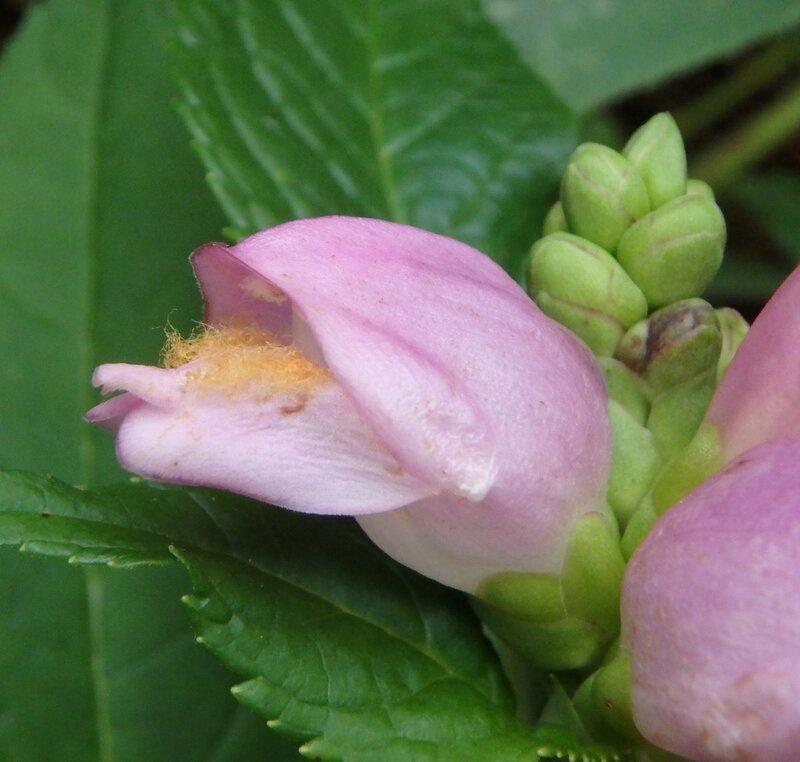 It’s very hairy inside a turtlehead blossom. The hairs remind me of the beard on a bearded iris. Most purple loosestrife (Lythrum salicaria) plants pretty much stopped blooming a couple of weeks ago but I still see them blooming here and there. This is an invasive perennial that came over from Europe in the ballast of a cargo ship in the 1800s. 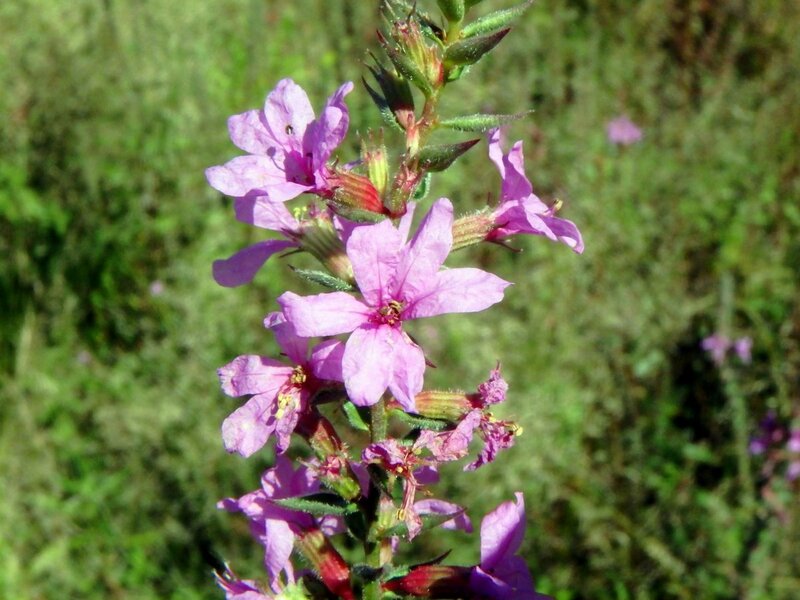 The beach sand ballast, loaded with purple loosestrife seeds, was originally dumped on Long Island, New York. The seeds grew, the plant spread and now it covers most of Canada and all but 5 of the lower Untied States. It likes wet, sunny meadows but will grow just about anywhere. It’s hard to deny its beauty, especially when you see a meadow full of it growing alongside yellow goldenrods, but the plant chokes out natives including goldenrod and creates monocultures. I don’t know if it’s the unusual hot temperatures we’ve had or if there is another reason but I’m seeing a lot of summer flowers that I shouldn’t be seeing now, like this St. Johnswort (Hypericum perforatum.) It usually blooms in June and July and should be long since done by now but I guess it can do whatever it wants. In any event it’s a pretty thing and I was happy to see it. 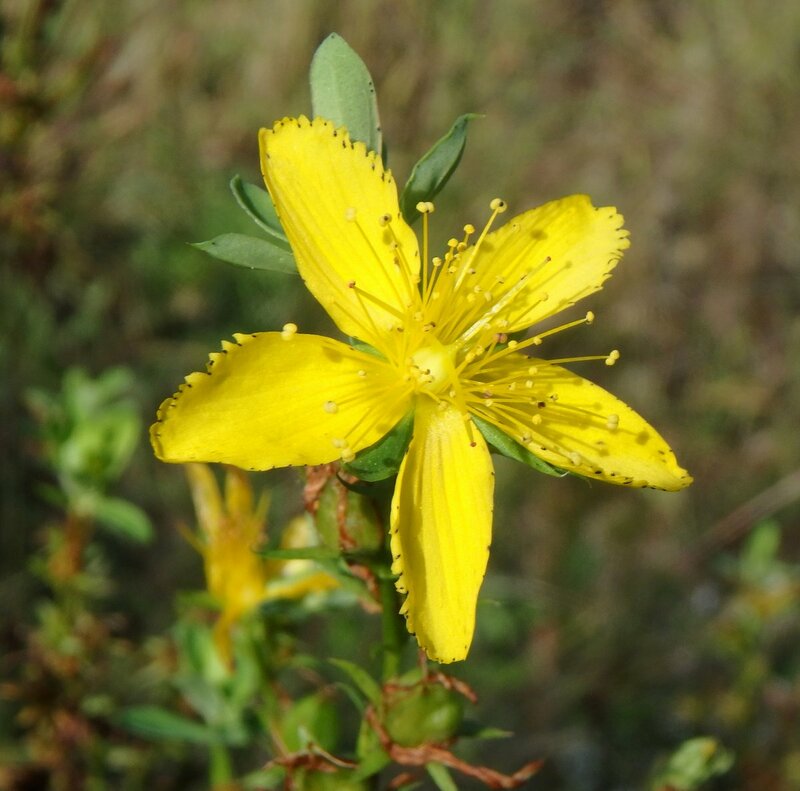 Originally from Europe, St. Johnswort has been used medicinally for thousands of years. It likes to grow in open meadows in full sun. 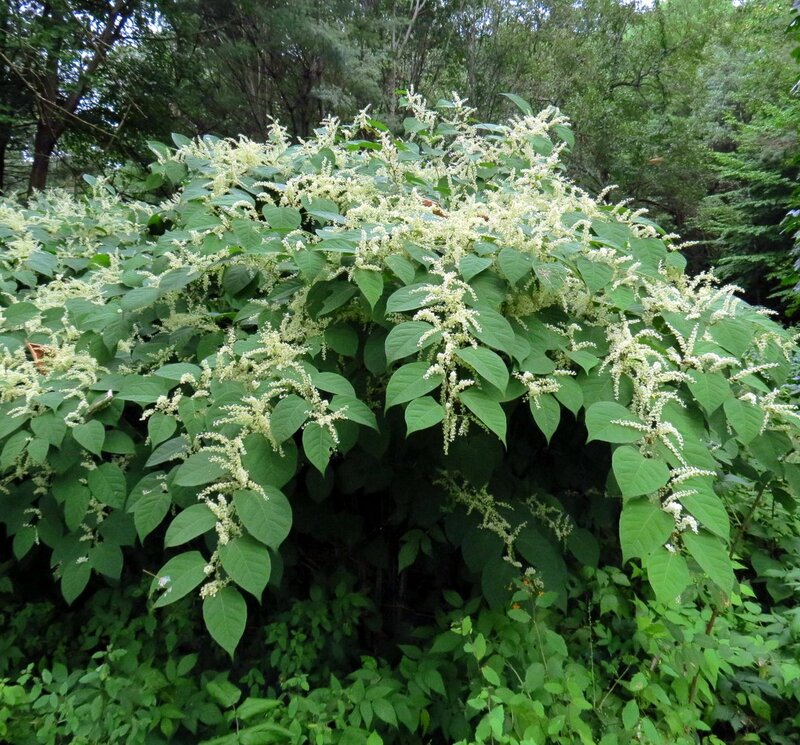 Japanese knotweed (Fallopia japonica) still blooms here and there but it’s pretty well finished for this year. Its final act will be to drop millions of seeds before it dies back completely until spring. This plant was brought to Europe from Japan sometime around 1829. It was taken to Holland and grown in nurseries that sold it as an ornamental. From there it found its way across the Atlantic where we still do battle with it today. 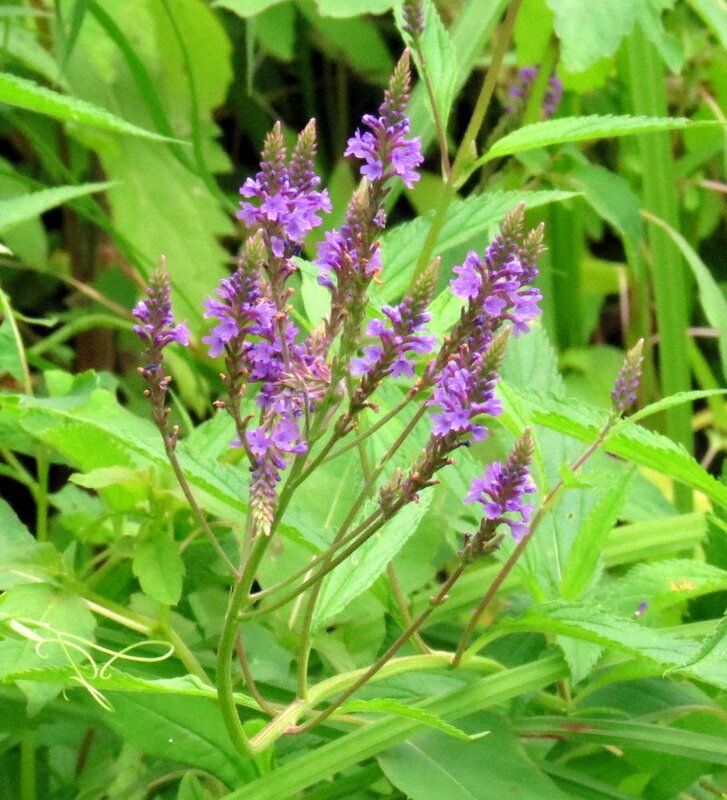 It is one of the most invasive plants known and the only plant I have ever seen overtake it is purple loosestrife, which is also an invasive weed. Japanese knotweed is also a tough plant that is very hard to eradicate once it has become established. Japanese knotweed does have pretty flowers but they aren’t enough to convince people that it’s a plant worth having on their property. It can take over entire yards when left alone. I can count the number of times I’ve found Tansy (Tanacetum vulgare) growing wild on one hand, but this year I’ve found it three times. Tansy is a European native that has been cultivated for centuries. The flat flower heads are made up of many button like disc flowers; almost like a daisy without the white ray flowers that we call petals. Tansy is a natural insect repellent and was used as such in colonial times. Dried tansy added to the straw in mattresses was said to keep bedbugs away. Most tansy plants are seen in gardens but it had naturalized itself in New England by 1785 and can still be occasionally found growing along roadsides. It’s a good plant to use in vegetable gardens for pest control. 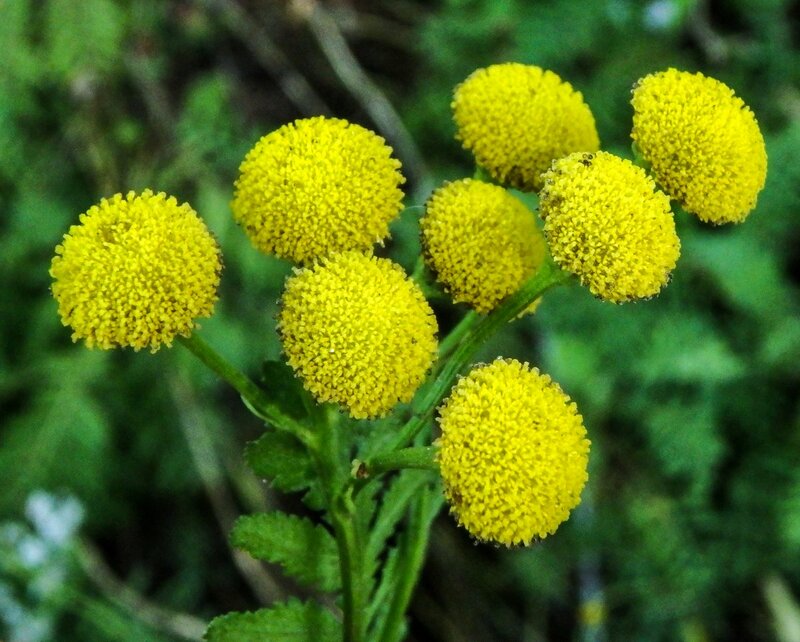 The ancient Greeks grew tansy for medicinal use but modern science has found it to be toxic. 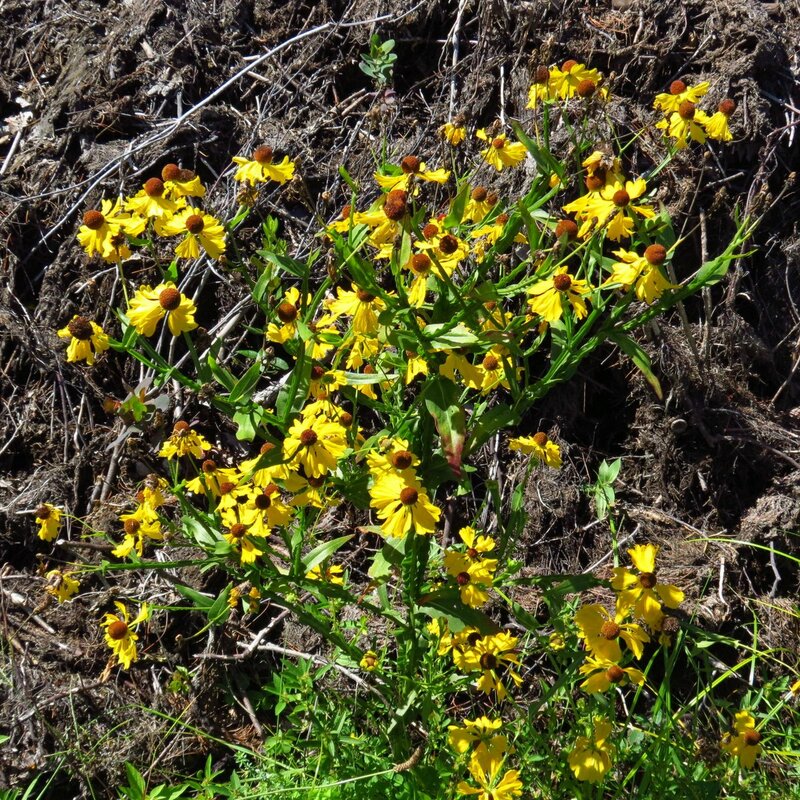 You’ve never seen sneezeweed (Helenium autumnale) on this blog because I’ve never found it in the wild. The odd thing about them appearing now is that I check the place where I found them each year at this time and last year they weren’t there. This year the perennial native grew in 7 or 8 spots. How it got there or when I don’t know, but I was happy to see it. In the past sneezing was thought to rid the body of evil spirits, so both men and women used snuff to make them sneeze. 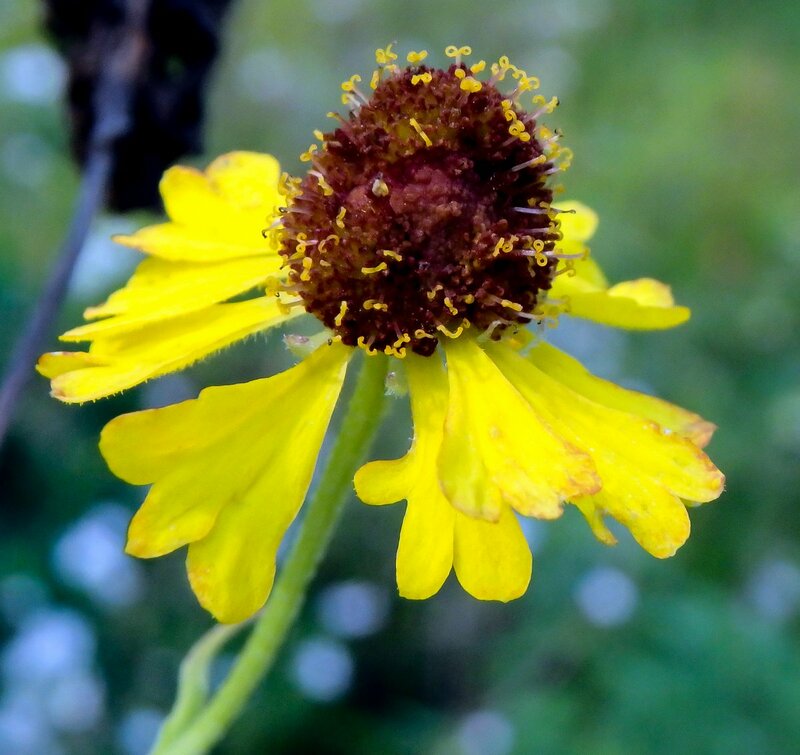 Dried sneezeweed was one of the ingredients in snuff, and that’s how it comes by its common name. The plant wants wet soil and these examples grew on the earthen dam that dammed up a pond. It did not make me sneeze. Sneezeweed has curious winged stems and this is a good way to identify them. It is a poisonous plant and no part of it should be eaten. It also contains compounds that have been shown effective in the treatment of tumors. 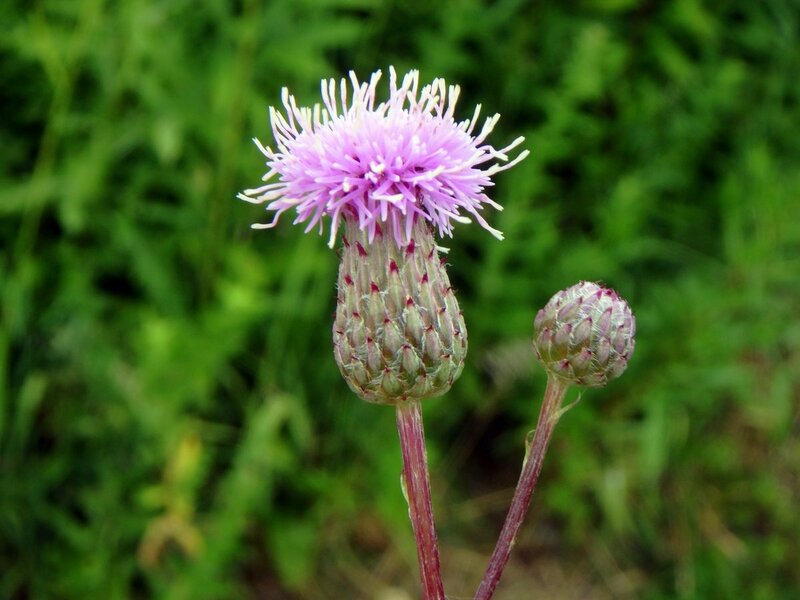 The Native American Cherokee tribe used the plant medicinally to induce sneezing and as an aid in childbirth. 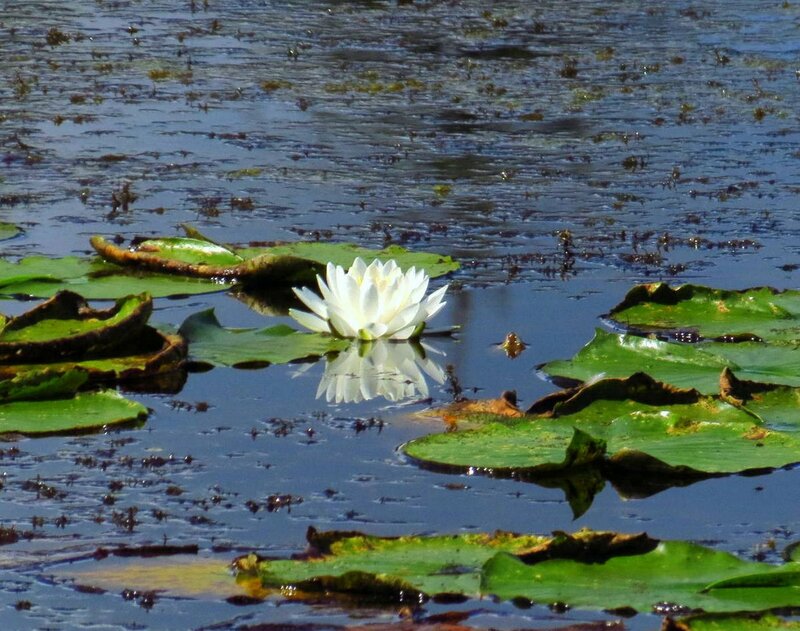 Fragrant white water lilies (Nymphaea odorata) are still in bloom. There are certain flowers that are beautiful enough to make me want to just sit and gaze at them all day, and this is one of them. Some say the scent of fragrant white water lilies reminds them of honeydew melon and others compare the smell to other things, like anise. Each blossom lasts only 3 days before the stems coil and pull them underwater to set seeds, so if you see some and come back a week later and find that they’re gone, you aren’t imagining things. I thought I’d show a roadside scene that I drive by every day on my way to work. Most of the fall flowers are in full bloom right now and seeing them each morning is a beautiful way to start the day. Flowers always make people better, happier, and more helpful; they are sunshine, food and medicine for the soul. ~Luther Burbank. 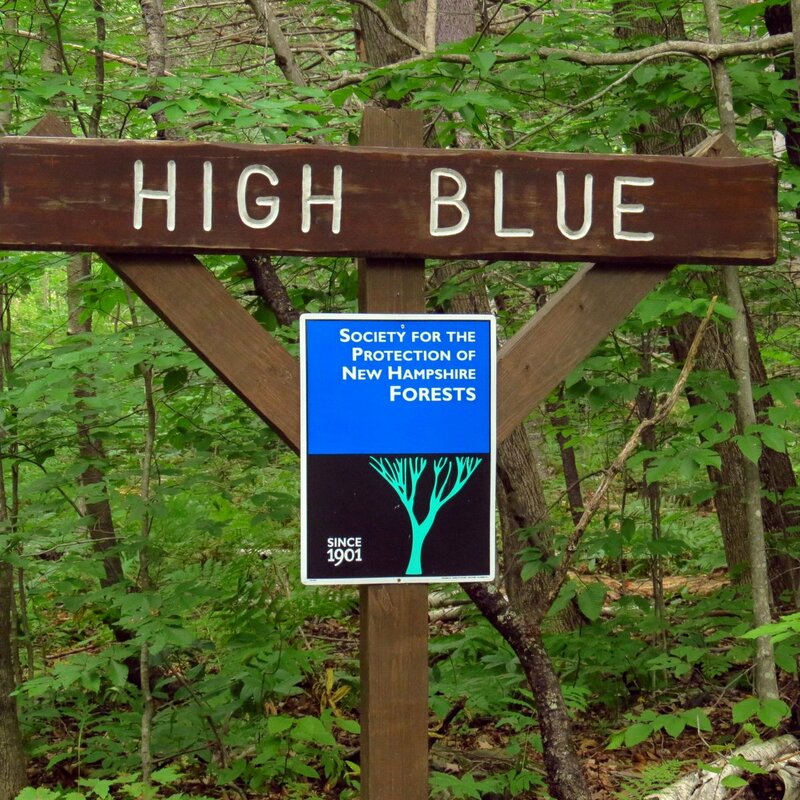 Last Sunday dawned cool and free of the oppressive humidity that we’ve seen so much of this summer, so I thought I’d go for a climb up to the High Blue Trail lookout in Walpole. As I mentioned in last Saturday’s post, I’ve been having some breathing issues so I chose this trail because the climb is easy and gentle. I also chose it because there is usually much to see here and on this day I wasn’t disappointed. 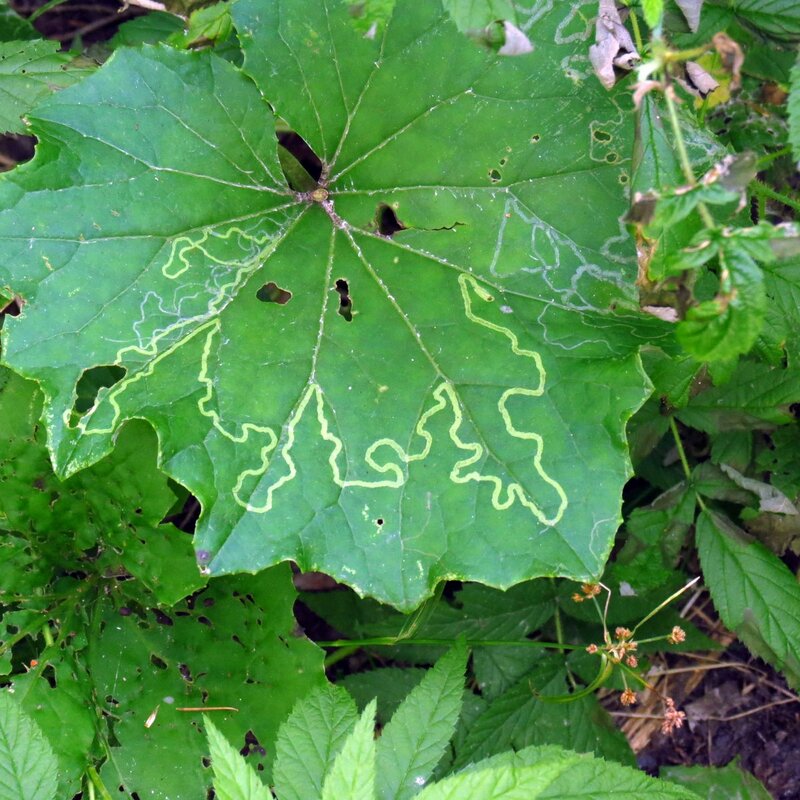 The first things that caught my eye were the map like patterns in this coltsfoot leaf left by leaf miners. How remarkable that anything could be small enough to eat the tissue between the top and bottom surfaces of a leaf. Hobblebush (Viburnum lantanoides) leaves whispered that fall was on the way but I didn’t want to listen. But listen I had to, because everywhere I looked nature was whispering fall. Soon the whisper will become a shout. I saw a young fly agaric (Amanita muscaria v. formosa) just up out of the soil and looking like it had been scrubbed clean even though it hadn’t rained in a week. 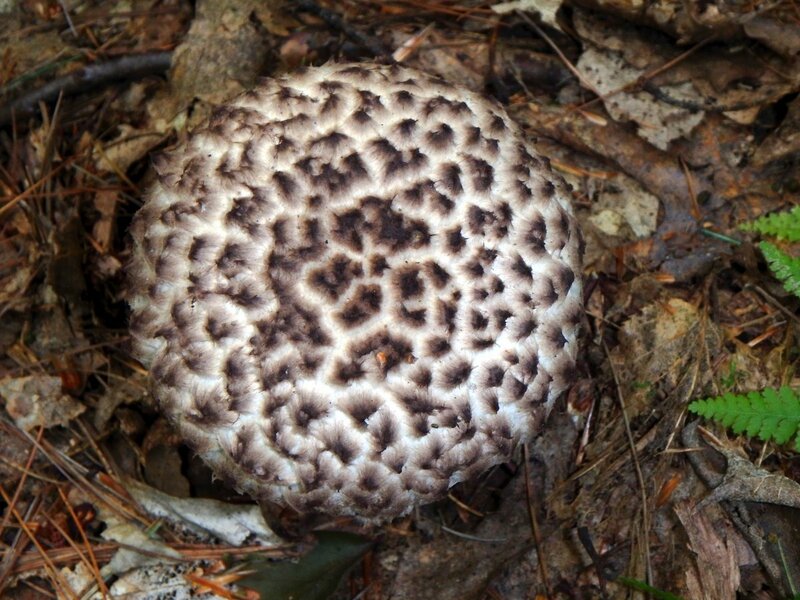 This mushroom is common where pine trees grow. The name fly agaric comes from the practice of putting pieces of the mushroom in a dish of milk. The story says that when flies drank the milk they died, but it’s something I’ve never tried. Fly agaric is said to have the ability to “turn off” fear in humans and is considered toxic. Vikings are said to have used it for that very reason. 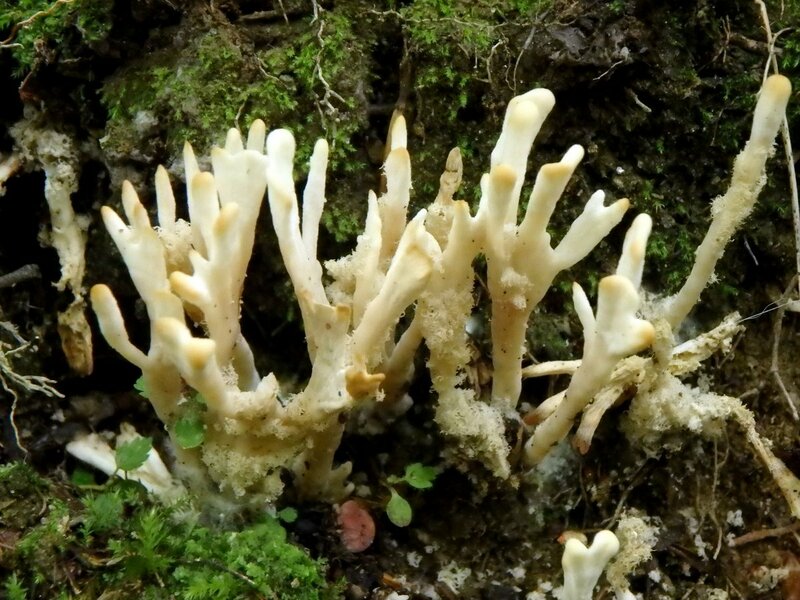 I’ve seen plenty of club coral fungi but I’ve never seen one that was hairy like this one. I think they might be examples of cotton base coral fungi (Lentaria byssieda,) which has “stalks that rise out of a creamy white, felt-like, hairy mycelial patch.” From what I’ve seen online and in guide books this fungi’s appearance can vary greatly as far as shape, with some having branch tips that are sharply pointed and others with blunt branch tips. When I saw this I knew that it didn’t matter what else I saw on this day, because my day was complete. 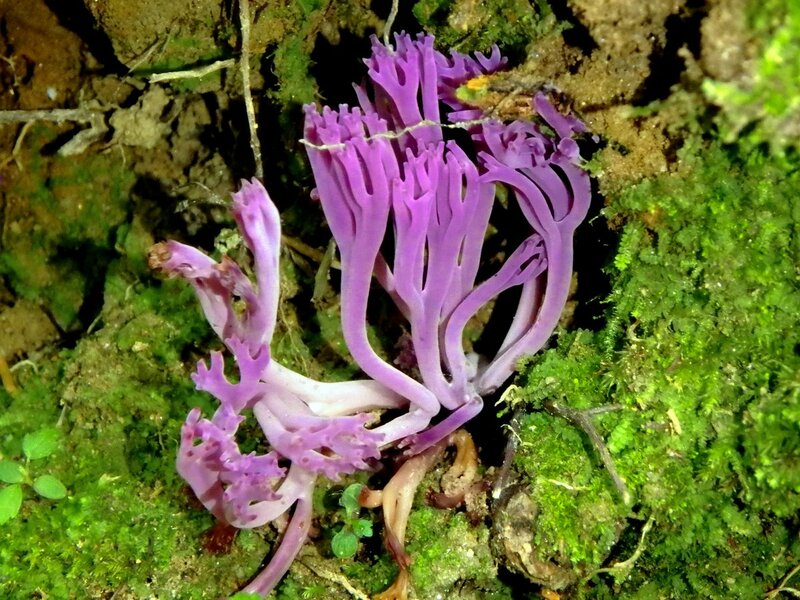 Violet coral fungus (Clavaria zollingeri) is a very rare thing in these parts and this is only the second time I’ve seen one. Both times I’ve seen it on a hillside, growing out of the soil on the side of the trail. Such a rare and beautiful thing can take you outside yourself for a time and I knelt there in the dirt taking photos and admiring it for I don’t know how long. I wish I’d see more of them but who knows what makes them only show themselves so rarely, and who knows why they wear that color? 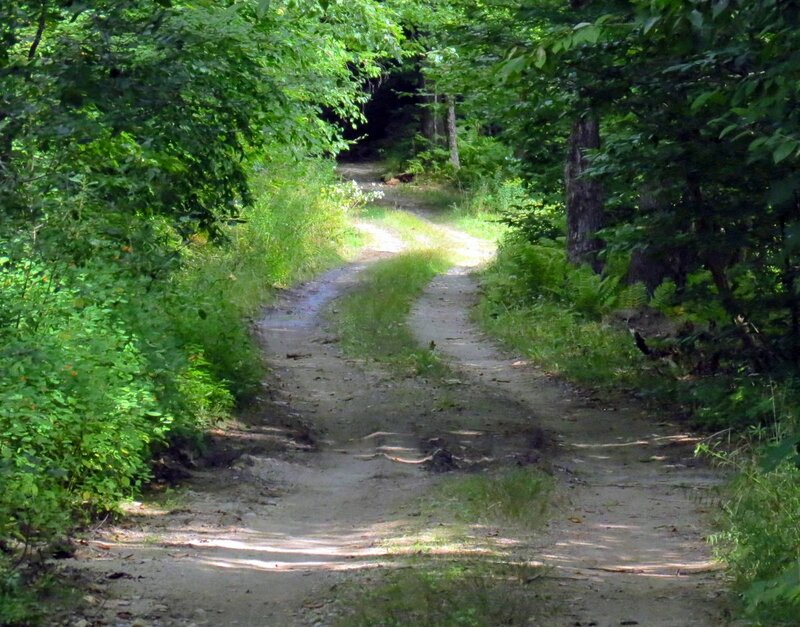 The old road isn’t long but it is winding. Before you know it you’re at the sign on the side road that leads to the lookout. A birch tree had fallen across the old road. 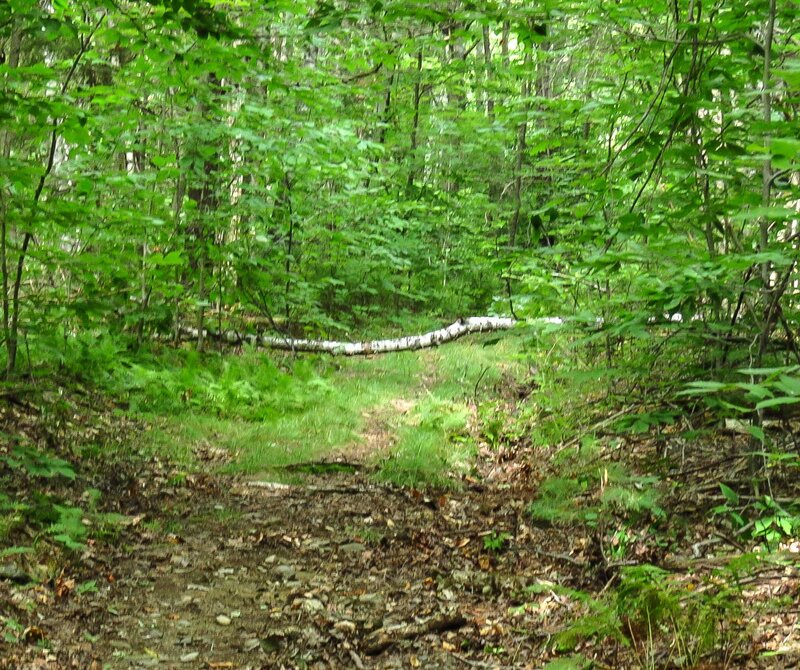 Many trees have fallen this summer and in a way it’s a good thing. 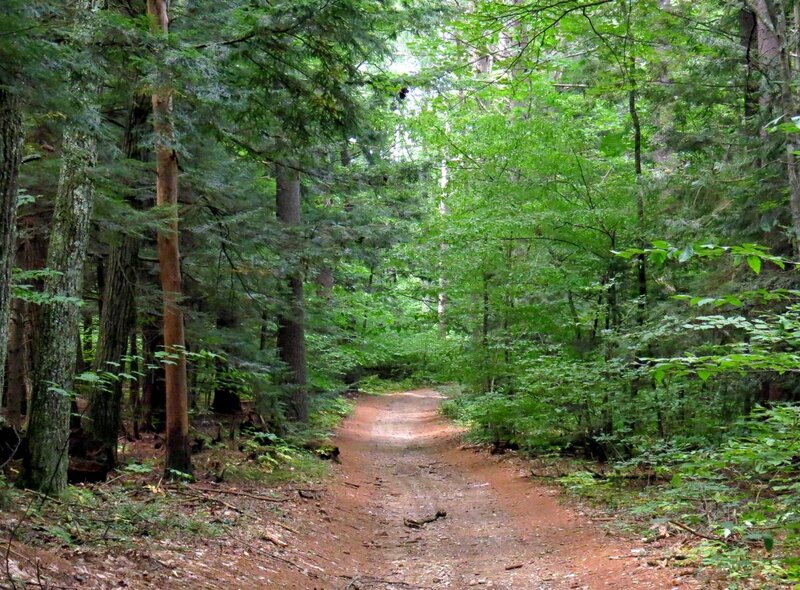 Weak trees standing in a forest could fall without warning at any time so it’s good when the wind removes them. It’s dangerous to have them standing near trails, as this one illustrates. I saw quite a few examples of the old man of the woods mushroom (Strobilomyces floccopus.) This grayish mushroom has black scales on its cap and stem and was very hard to get a good shot of. Both cameras that I carried had trouble focusing on it. 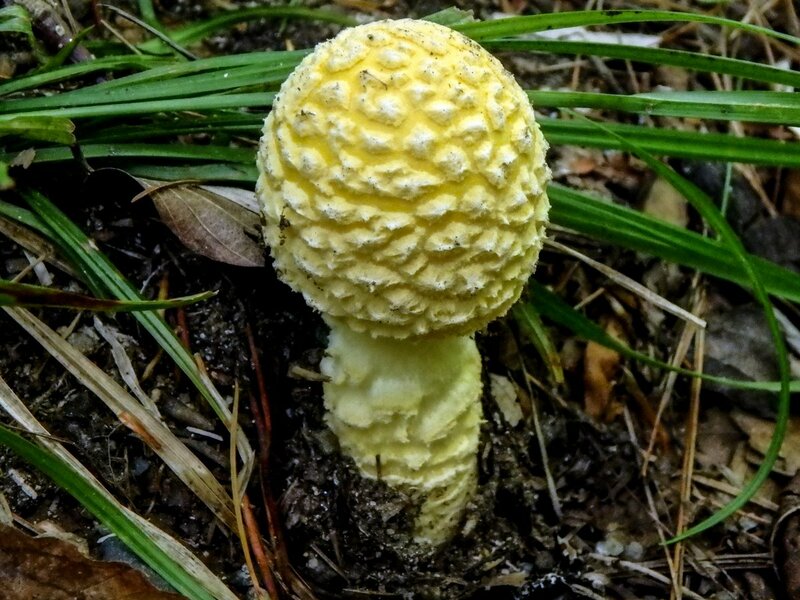 Nobody seems to know how this mushroom came by its common name. The old man’s pore surface starts off white, then turns gray before finally becoming black, so this one had some age. The flesh turns pinkish red when bruised and finally turns black. You can see the shaggy stem in this photo and that helps with identification. 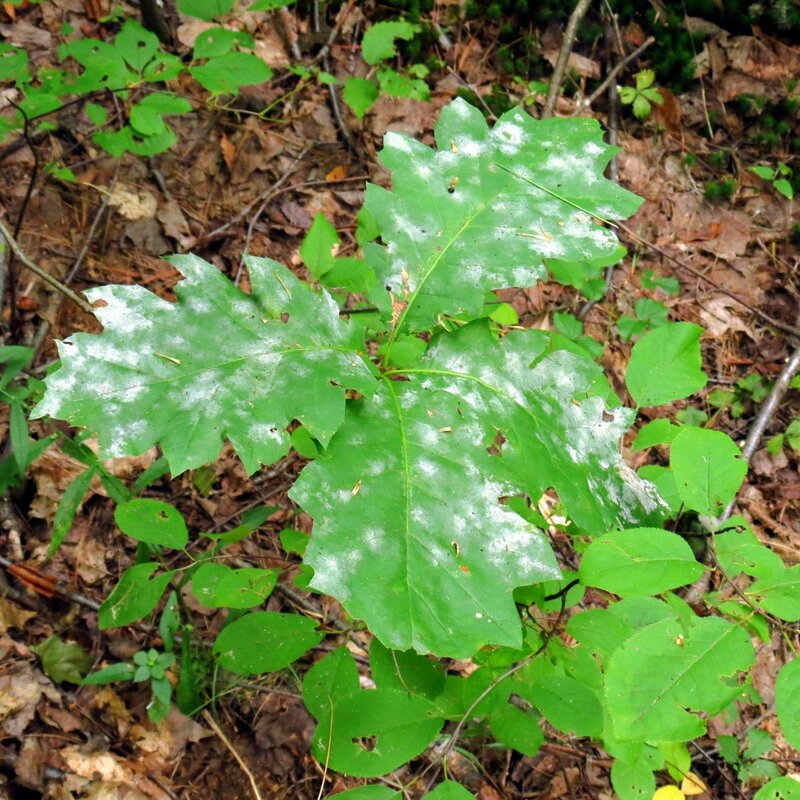 Powdery mildew on an oak showed how very humid and still the air has been lately. Molds and mildews have a hard time developing when there is good air circulation. Soon I was at the cornfield which was once a meadow. All my senses go on high alert here because I know that bears come here regularly to feed on the corn. I carried bear spray but if a bear suddenly burst out of the cornfield I doubt I would have had time to use it, so I stopped and listened for a minute or two. 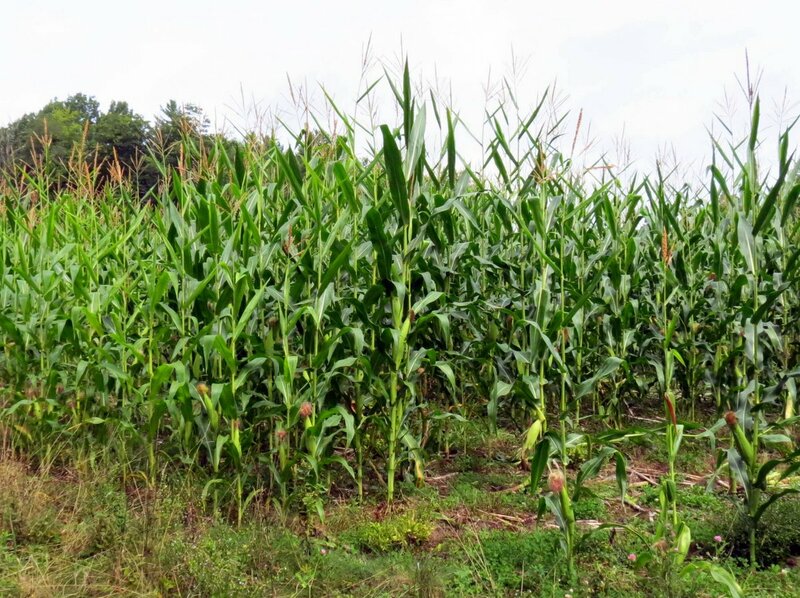 Hearing nothing but the rustling of the corn leaves I moved on. 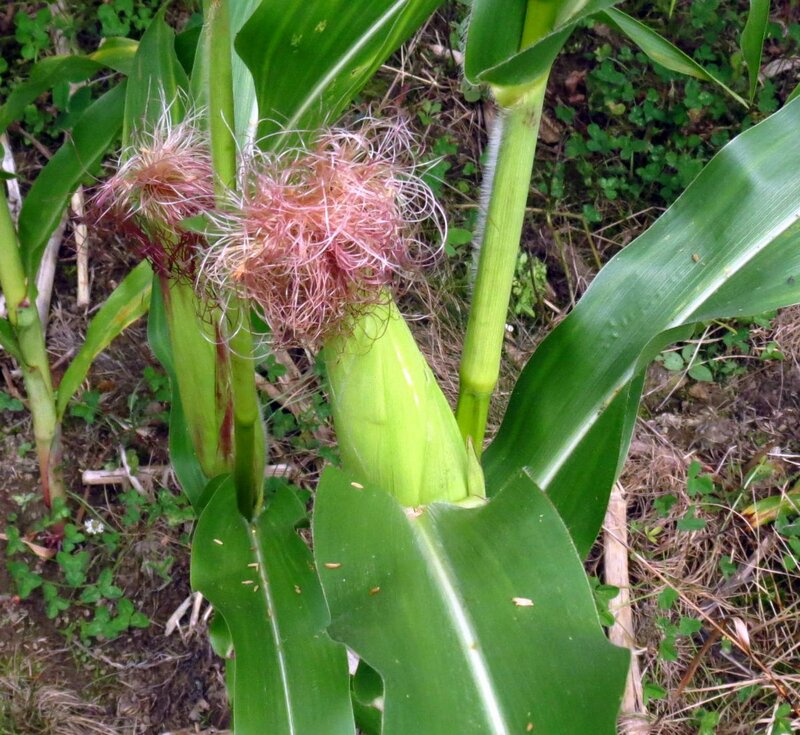 The corn was just about ready to pick but since this is cattle corn the whole plant gets chewed up and becomes silage. It attracts almost every animal in the forest, including deer and raccoons but I was surprised to find very little animal damage among the stalks. Quite often you’ll find broken stalks lying on the ground with the husks torn from the ears, and all the kernels eaten. Maybe the animals are waiting for it to become dead ripe, I don’t know. 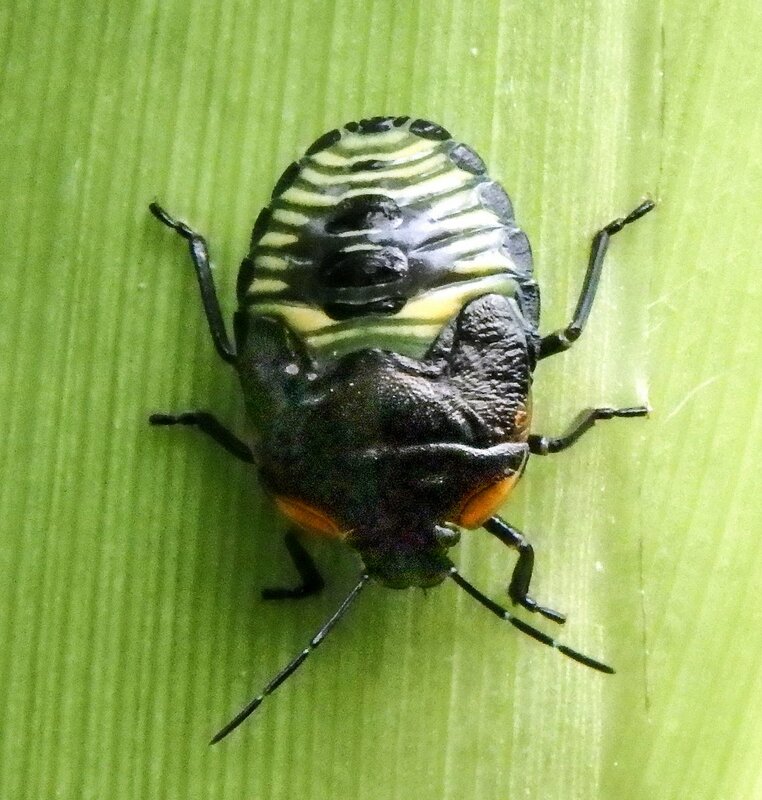 I saw two or three of these odd insects on ears of corn. Some kind of shield bug, I think. Asters bloomed along the edge of the cornfield. 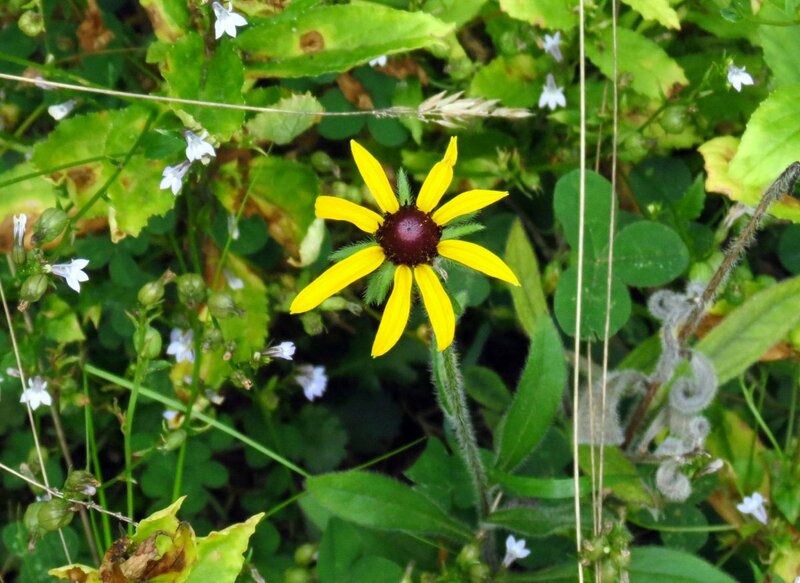 A black eyed Susan bloomed among hundreds of blooming lobelias. 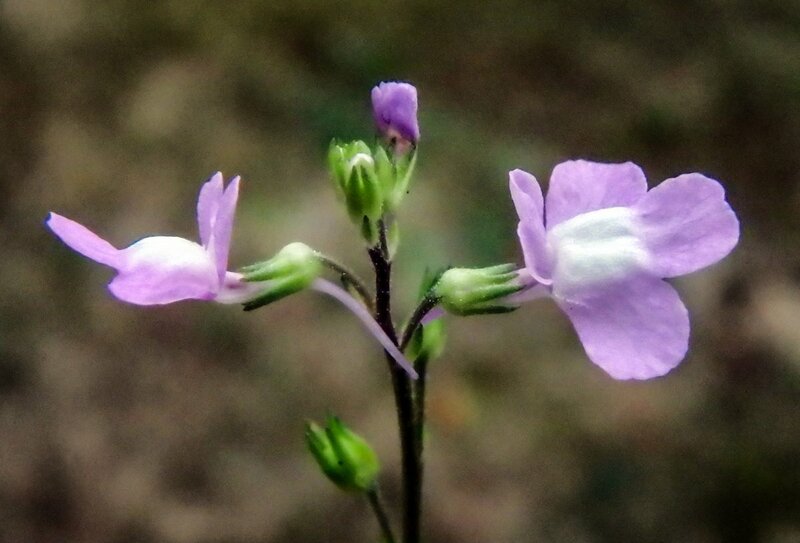 These were the pretty little lobelias called Indian tobacco (Lobelia inflata.) I was surprised to see them because they’re just about finished blooming down in the low country. I was especially glad the lobelias were blooming because there were two monarch butterflies visiting the small flowers. I scared this one away but luckily it landed close enough to get a photo of. 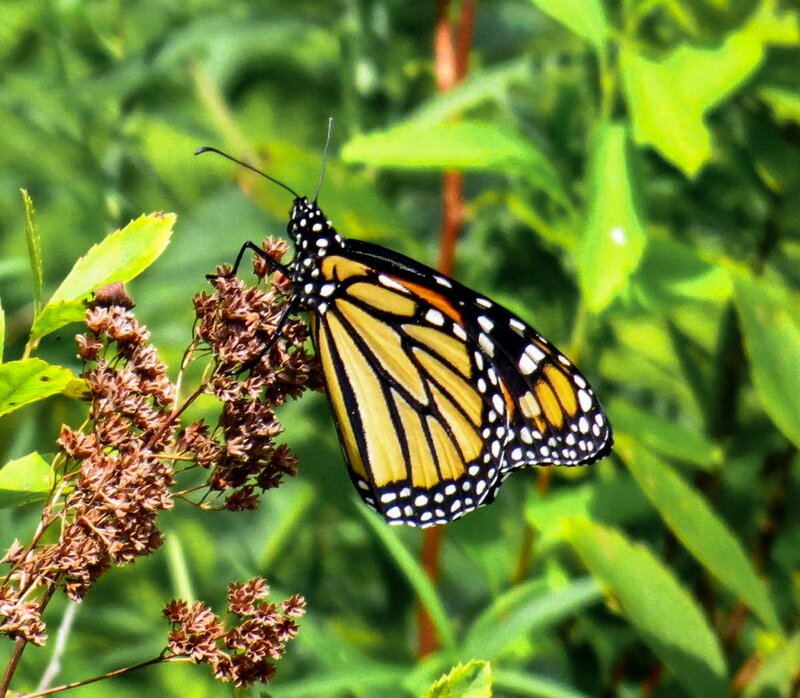 I’ve been seeing lots of monarchs this year I’m happy to say, but this is the only one I’ve been able to get a photo of. Though it was cool, sunny and dry when I left Keene by the time I reached the overlook clouds had rolled in and the air was so thick with humidity you could have cut it with a knife. This didn’t make breathing any easier and I was just about puffed out, as my blogging friend Mr. Tootlepedal says, so all I could think of was getting back to the car and into some air conditioning. After a couple of quick shots of the thick haze I headed back down the hill. 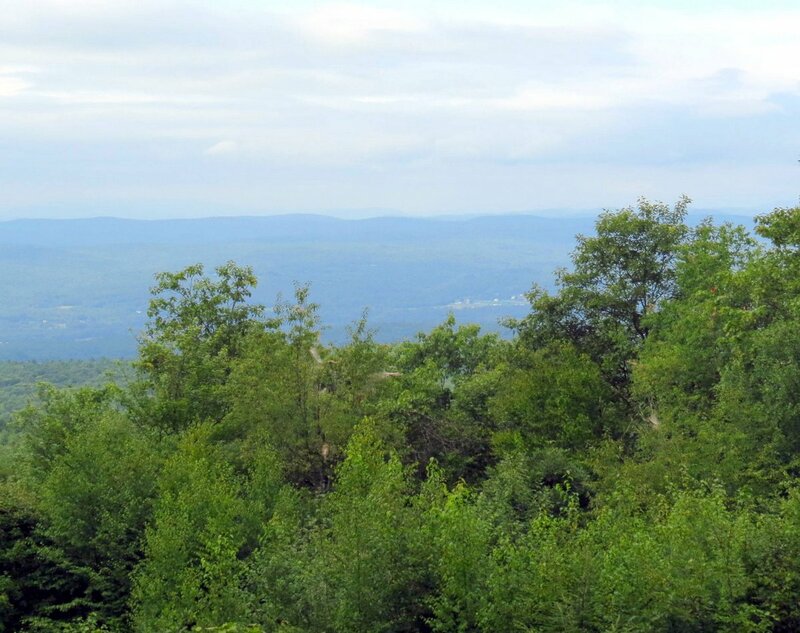 The view wasn’t very good; you couldn’t even see Stratton Mountain over in Vermont. The blue was a little darker where it should have been but I think I see it in this shot only because I know where it is. 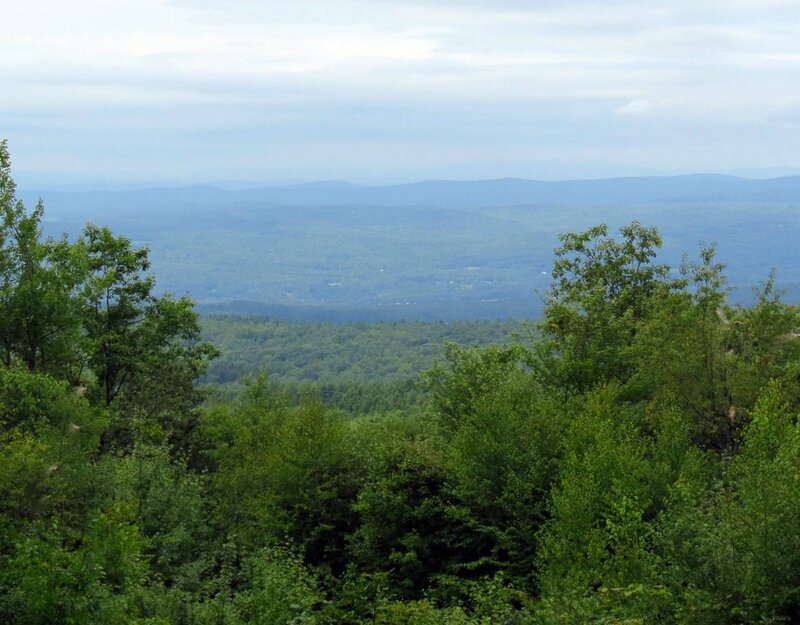 As I’ve said many time before, if I climbed for the view I’d end up disappointed most of the time, so though I enjoy seeing across the Connecticut River Valley into Vermont I could hardly be disappointed after seeing all of the beautiful things I saw on the way up here. It isn’t about the end of the trail or how fast you can climb a hill; it really is about what you see along the way. Despite the heat and dryness many flowers continue to appear. Daisy fleabane (Erigeron annuus) started blooming a while ago. This plant has a very long blooming period; I see them in early June blooming profusely and then sporadically through the following months, even into November. I usually find more of them in waste places but I see them just about everywhere I go. It is considered a pioneer species, meaning it is one of the first plants to grow in unused pastures, or cleared or burned areas. Woodchucks and rabbits will eat the leaves and stems. Native Americans made a tea from the plant which was used as medicine for digestive ailments. Fleabanes get their name from the way the dried plants repel fleas. 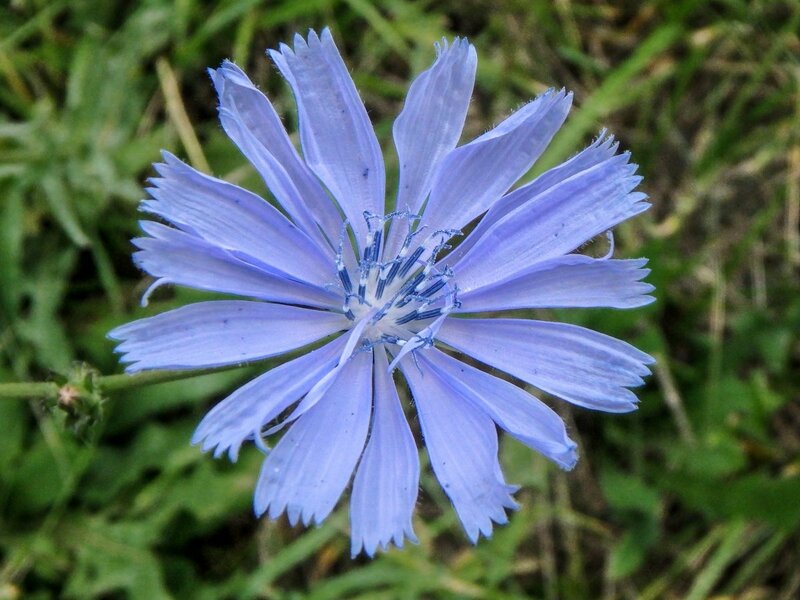 Chicory (Cichorium intybus) is one of my favorite summer flowers because of its large, easy to see flowers and beautiful blue color. It also comes with a message of summer’s passing because summer is just about half over when it blooms, and it is a reunion that is both happy and wistful for me each year. 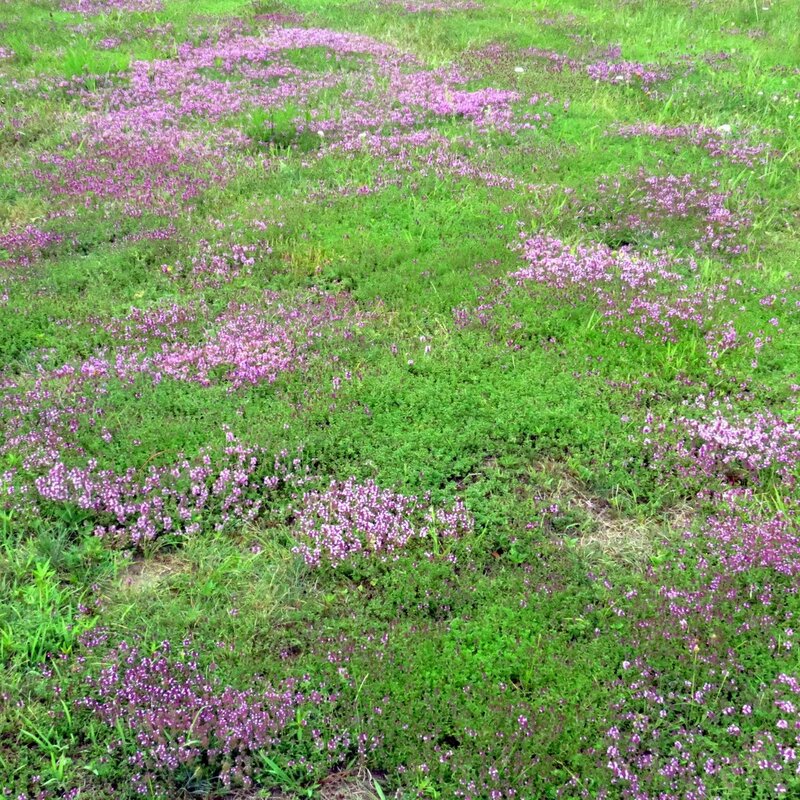 Unfortunately it likes to grow in places that get mowed regularly, like along our roadsides. I’m always dismayed when I see such beautiful flowers being cut down but I have seen normal size flowers blooming on a plant no more than three inches tall, so though the plants may get mowed they aren’t being killed. 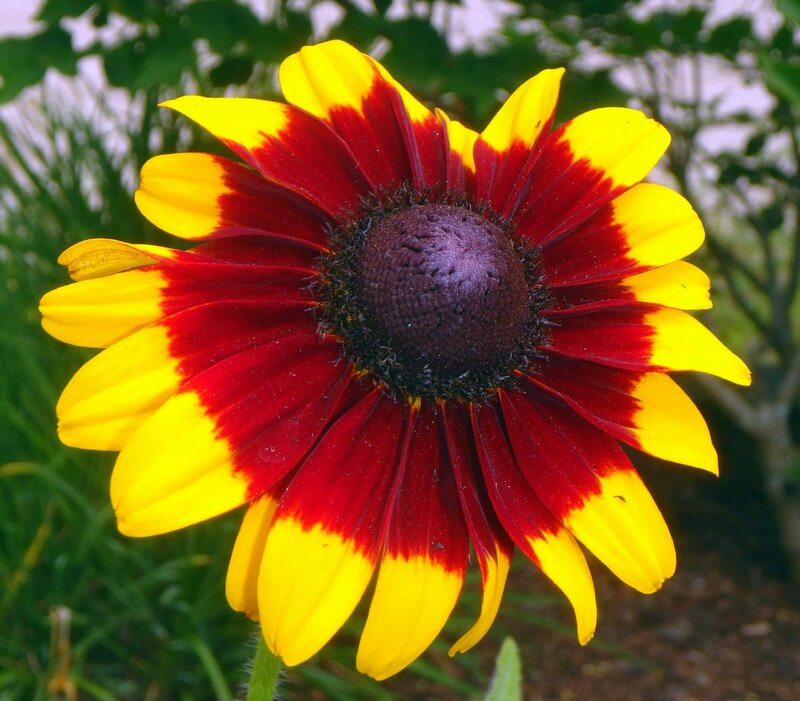 Another plant that comes with a message of summer’s passing is the black eyed Susan (Rudbeckia hirta,) and that message came earlier each year for a while. I think I saw it blooming in early June last year but this year it waited until July, and that’s more to my liking because I have always thought of it as a fall flower. It has a very long blooming period; often well into November, so I guess that’s why it says fall to me. I have trouble seeing red against green due to colorblindness and that’s why you don’t see much red in these posts, but bee balm blossoms always stand high enough above the surrounding foliage to be clearly visible. The name bee balm comes from the way the juice from its crushed leaves will soothe a bee sting. 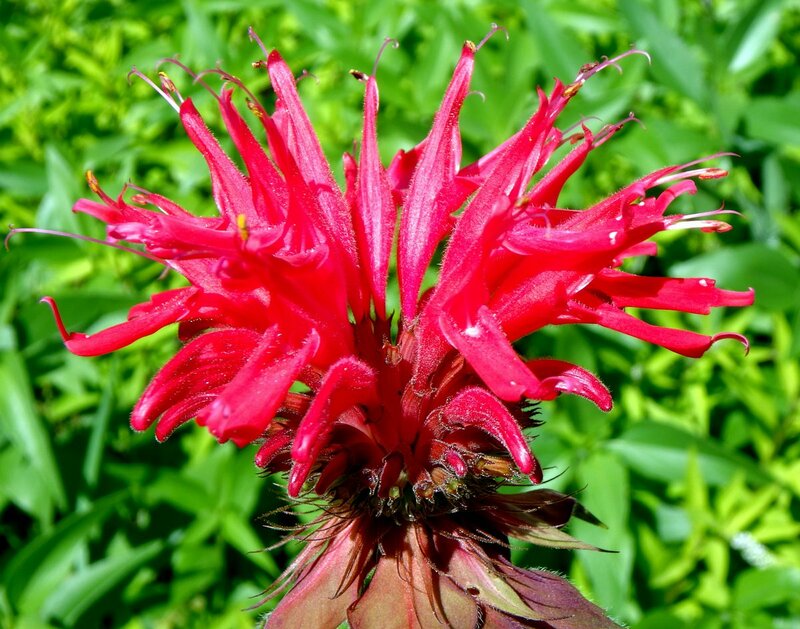 Our native scarlet bee balm (Monarda didyma) is also called Oswego tea, because the leaves were used to make tea by the Native American Oswego tribe of New York. Early settlers also used the plant for tea when they ran out of the real thing. It’s a beautiful flower that I’m always happy to see. Hummingbirds and butterflies love it too and will come from all over to sip its nectar. 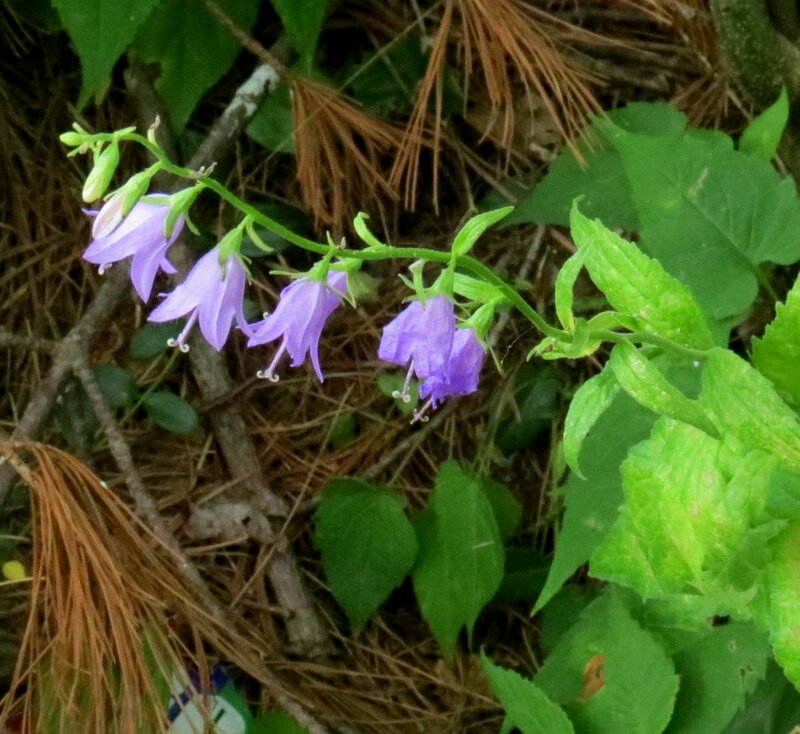 Blue, bell shaped flowers all on one side of the stem can mean only one thing; creeping bellflower (Campanula rapunculoides.) The pretty flowered plant was introduced as an ornamental from Europe and has escaped gardens to live in dry places that get full sun. It is a late bloomer but is usually finished by the time the goldenrods have their biggest flush of bloom. 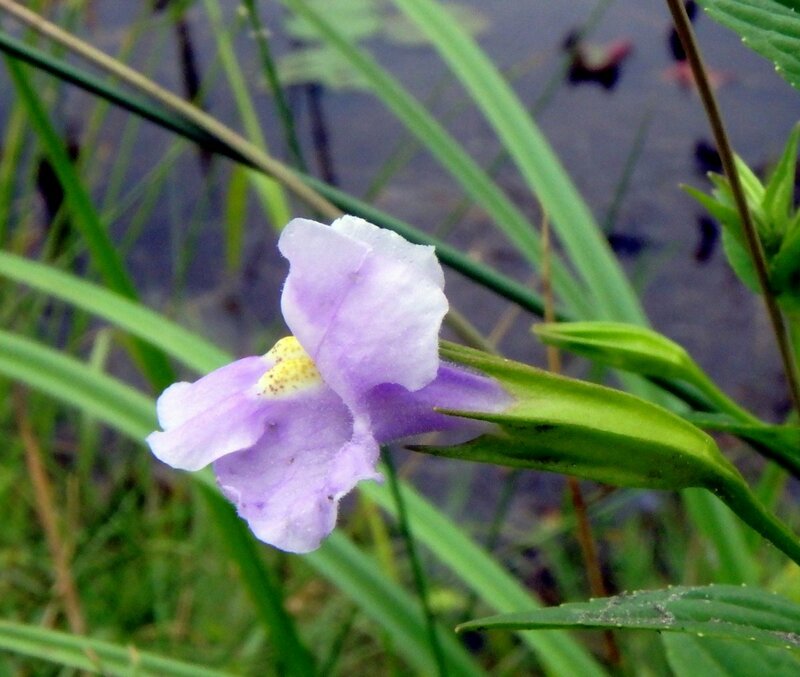 It is considered an invasive plant in some places because it is hard to get rid of once it has become established. 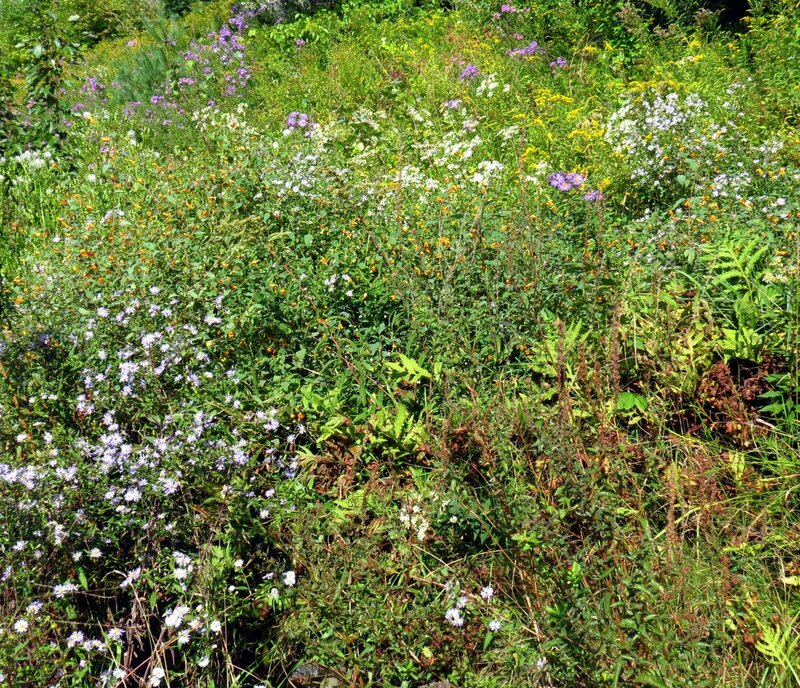 It can choke out weaker native plants if it is left alone. It isn’t considered invasive here in New Hampshire though, and in fact I usually have to look for quite a while to find it. When I do it is usually growing on forest edges. 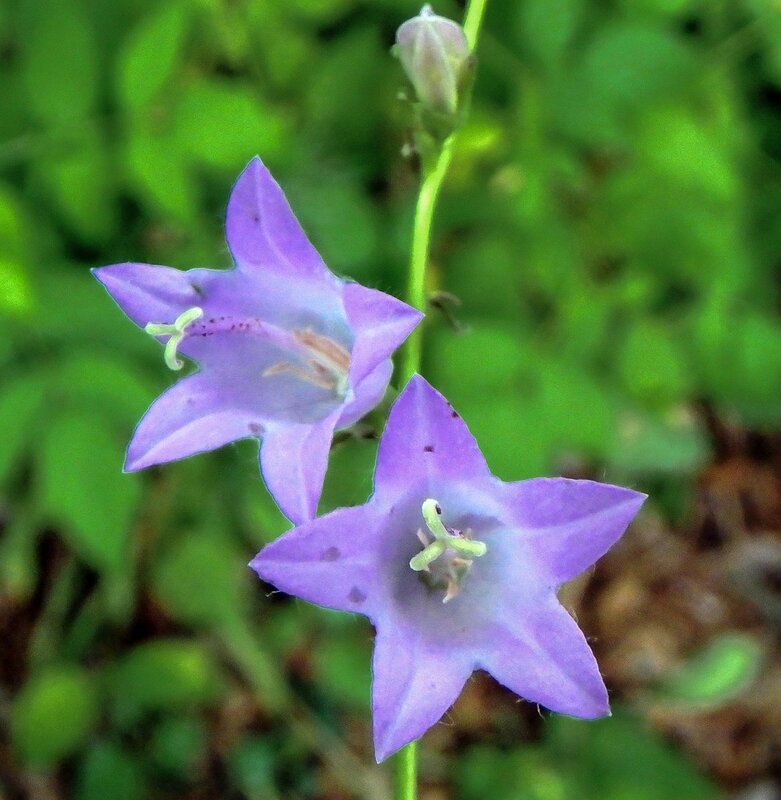 The flowers of creeping bellflower are obviously in the campanula family, if you’re familiar with that family of plants. Canada thistle (Cirsium arvense) blooms in the tall grass of unmown meadows, and this one was blooming in what is a large colony near a pond. This plant isn’t covered with sharp spines like the larger bull thistle but it does have small spines along the leaf margins and stem. Despite its common name the plant is actually a native of Europe but has spread to virtually every country in the northern hemisphere. 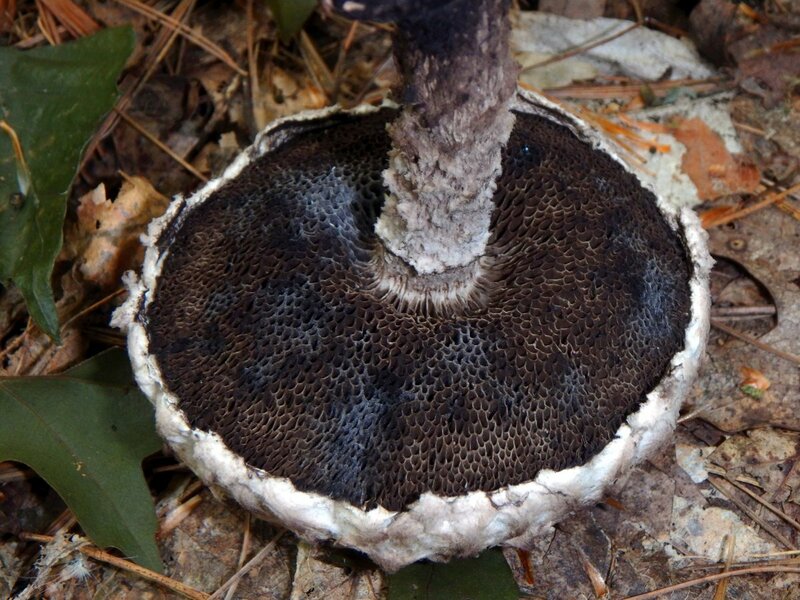 It has a deep and extensive creeping root system and is nearly impossible to eradicate once it gains a foothold. For that reason it is considered a noxious weed in many states. 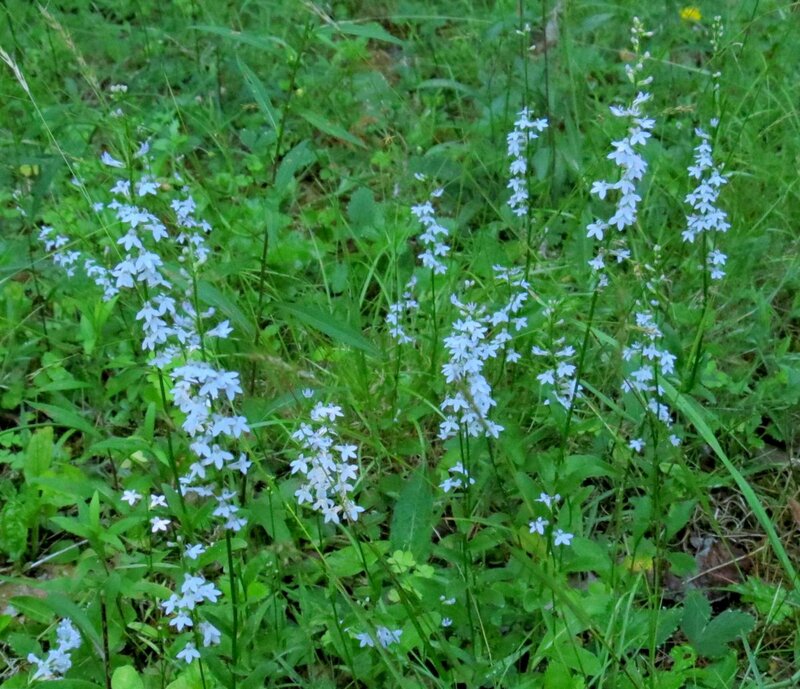 I’m seeing a lot of pale spike lobelia (Lobelia spicata) this year. The plant gets its common name from its small flowers, which are usually a pale blue to almost white, but I’ve seen many that are darker like these examples. There is also a purple variant but I’ve never seen it. 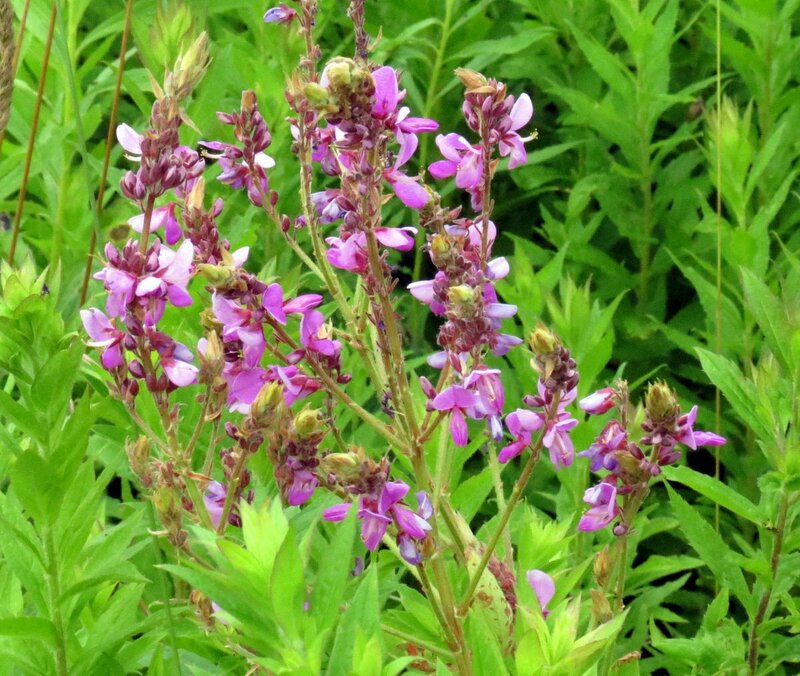 Native Americans had many medicinal uses for lobelia and one of them was as a treatment for asthma. The plant must have worked well because early explorers took it back across the Atlantic where it is still used medicinally today. It has to be used with great care by those who know how to use it though, because too much of it can kill. 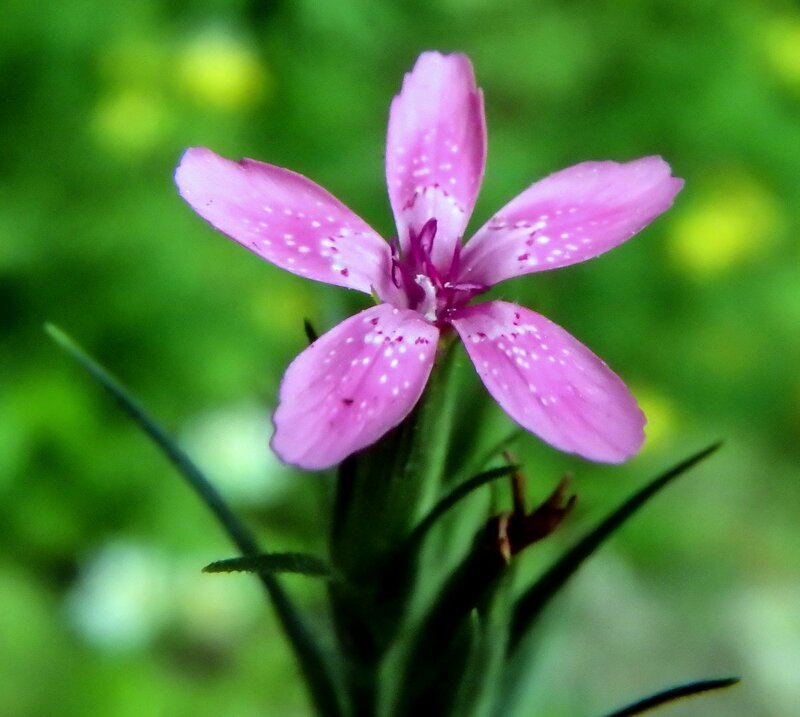 This shy little Deptford pink (Dianthus armeria) peeked out of the tall grass from under a tree. They don’t always grow in the same large clumps as their cousins the maiden pinks (Dianthus deltoids) do, but I saw a few this day. They also don’t have the same bold, jagged, deep maroon ring near their center as maiden pinks do, and that’s a good means of identification. Both plants are originally from Europe and have escaped cultivation. Maiden pinks seem to prefer open lawns and meadows while Deptford pinks hide their beautiful little faces in the sunny edges of the forest. 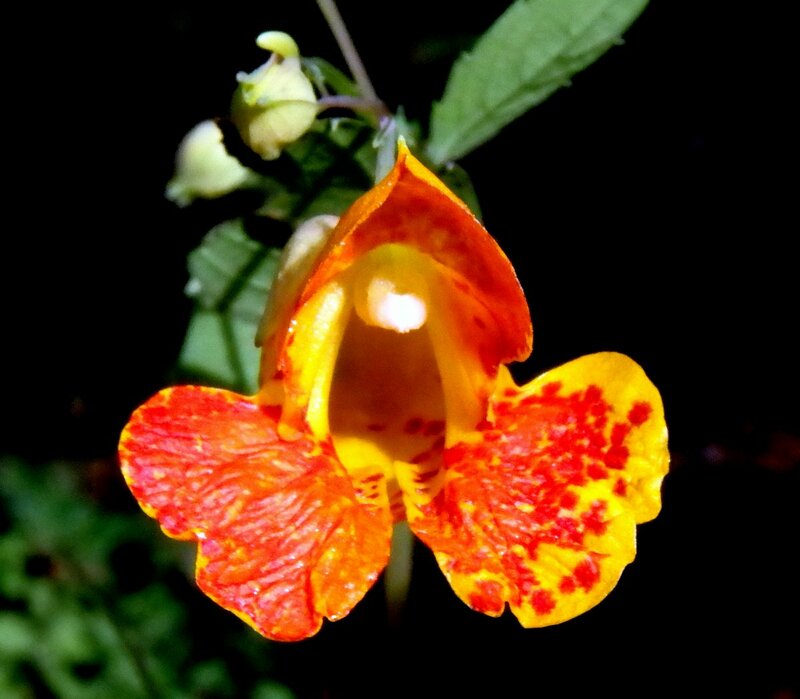 No matter how many times I see the Allegheny monkey flower (Mimulus ringens) I don’t see a monkey, but whoever named it obviously did. This plant gets about knee high and likes to grow in wet, sunny places, and isn’t all that common. I usually have a hard time finding it. This year I’ve seen exactly one plant and I hope nobody picks it so it will get pollinated and go to seed. 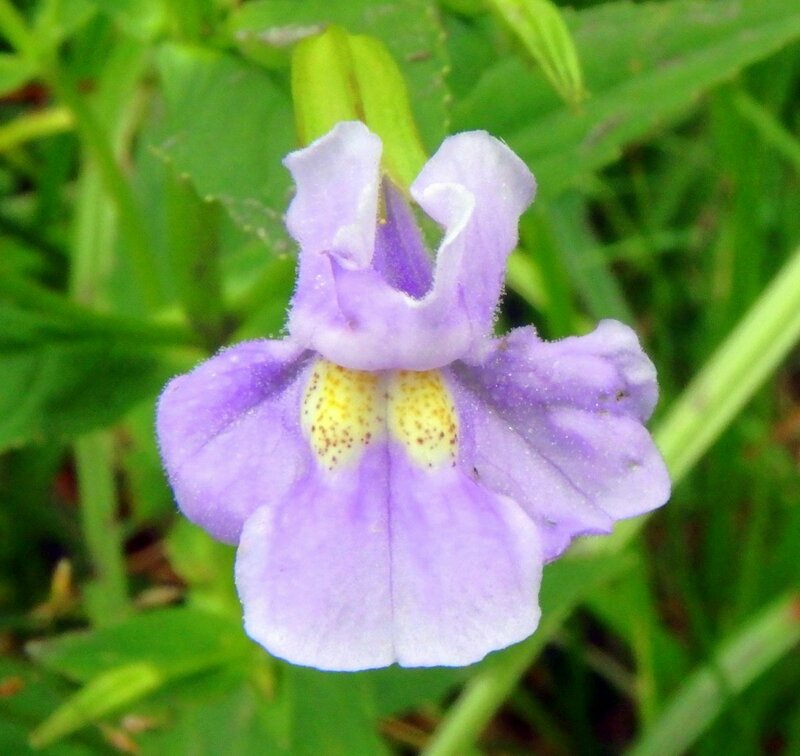 Allegheny monkey flowers have square stems and are also called square stemmed monkey flowers. The throat of this flower is partially closed and bumblebees are one of the few insects strong enough to pry it open to get at the nectar. 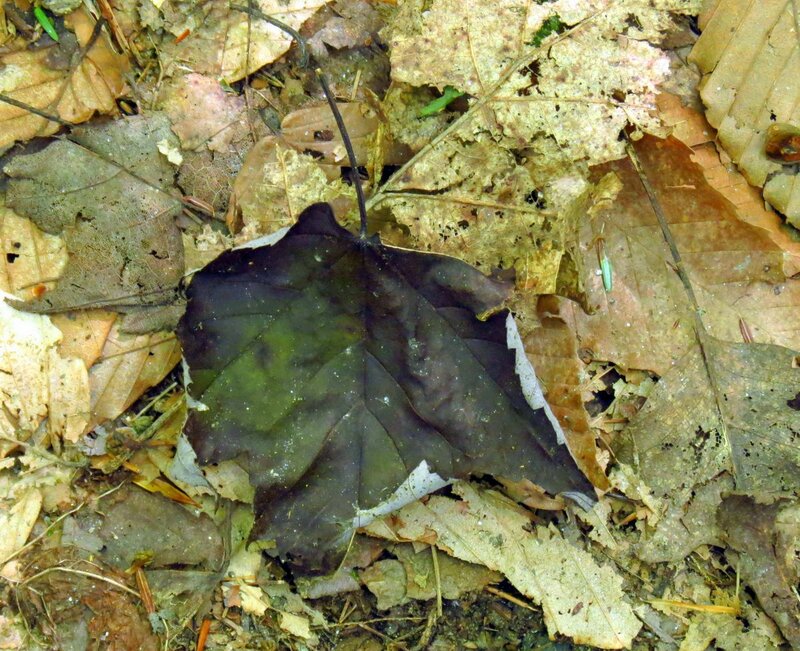 Native Americans and early settlers sometimes used the leaves as an edible green. 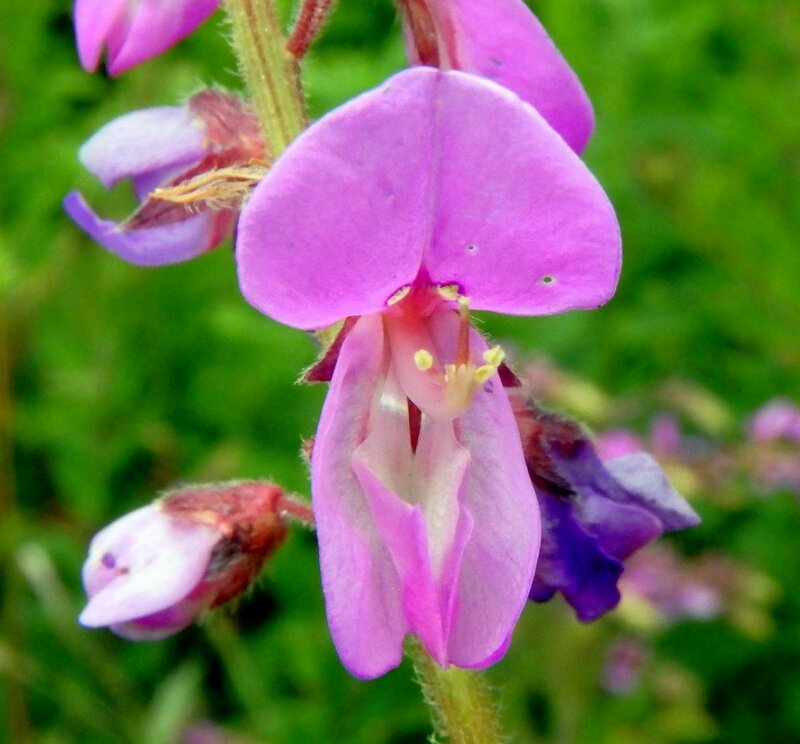 Showy tick trefoil (Desmodium canadense) is a legume in the bean family. This plant gets part of its common name from the little barbed hairs that cover the seed pods and make them stick to clothing like ticks, much like enchanter’s nightshade. 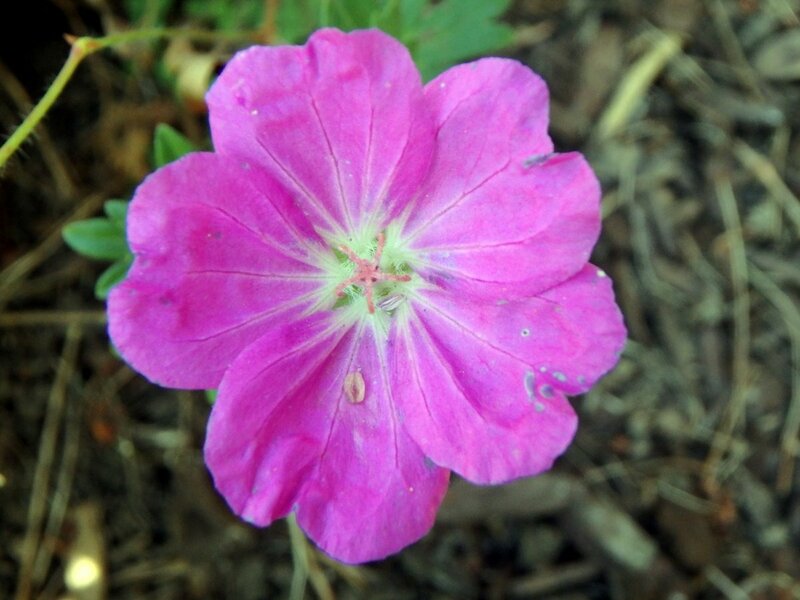 The “showy” part of its common name comes from the way that so many of its small pink flowers bloom at once. As the plant sets seeds its erect stems bend lower to the ground so the barbed seed pods can catch in the fur of passing animals. I saw these examples in an unmown meadow. Showy tick trefoil has pretty flowers that are obviously in the pea / bean family. It is also called Canada trefoil. One odd fact about this plant is that there are no known uses of it by Native Americans or colonials. From my experience that’s rare among native plants in this area. Maybe they just picked the beautiful flowers and used them to decorate their homes. I know a place where the wild thyme grows sounds like something out of Shakespeare but I do know such a place and the thyme is blooming. Bees love thyme so I’m sure they are just ecstatic. If you want to drive yourself crazy for a while try getting a shot of a single thyme blossom. Ancient Egyptians used thyme for embalming and the ancient Greeks used it in their baths and burnt it as incense in their temples, believing it was a source of courage, so it has been with us for a very long time. Vervain (Verbena hastata) is described as having reddish blue or violet flowers but I see a beautiful blue color. 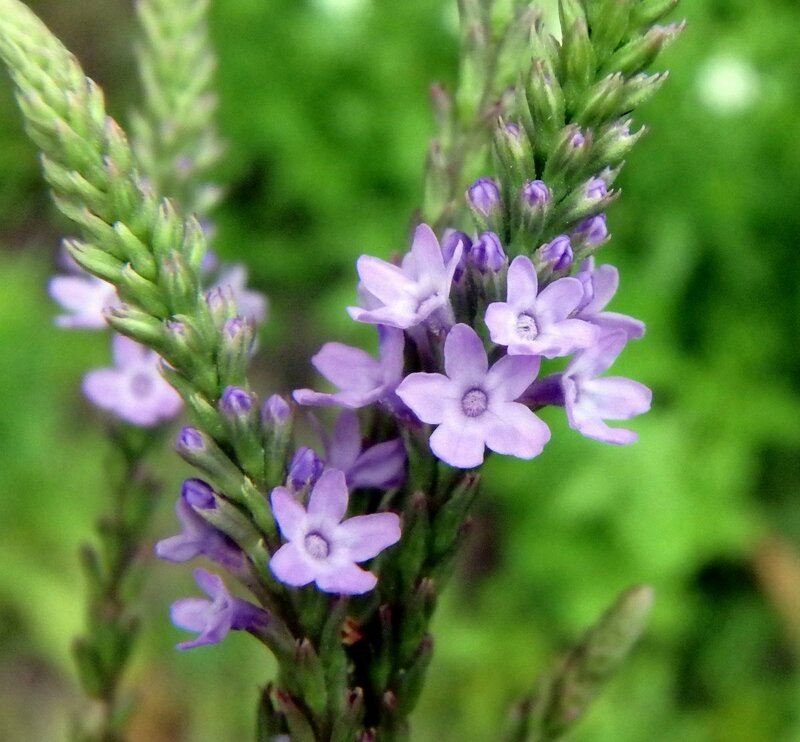 Somebody else must have seen the same thing, because they named the plant blue vervain. Vervain can get quite tall and has erect, terminal flower clusters. The plant likes wet places and I find it near ponds and ditches. 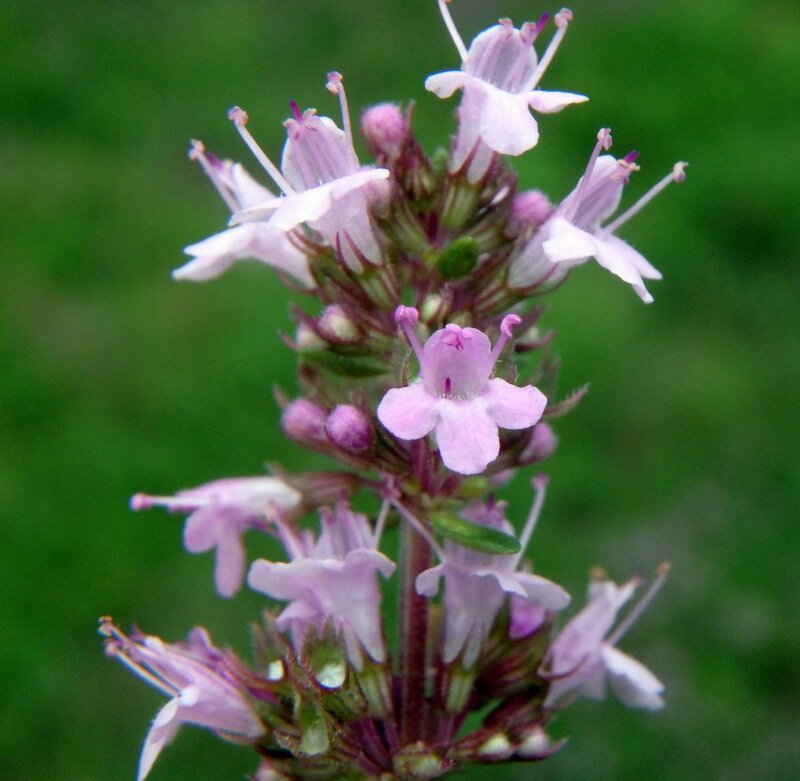 Vervain flowers are quite small but there are usually so many blooming that they’re easy to spot. 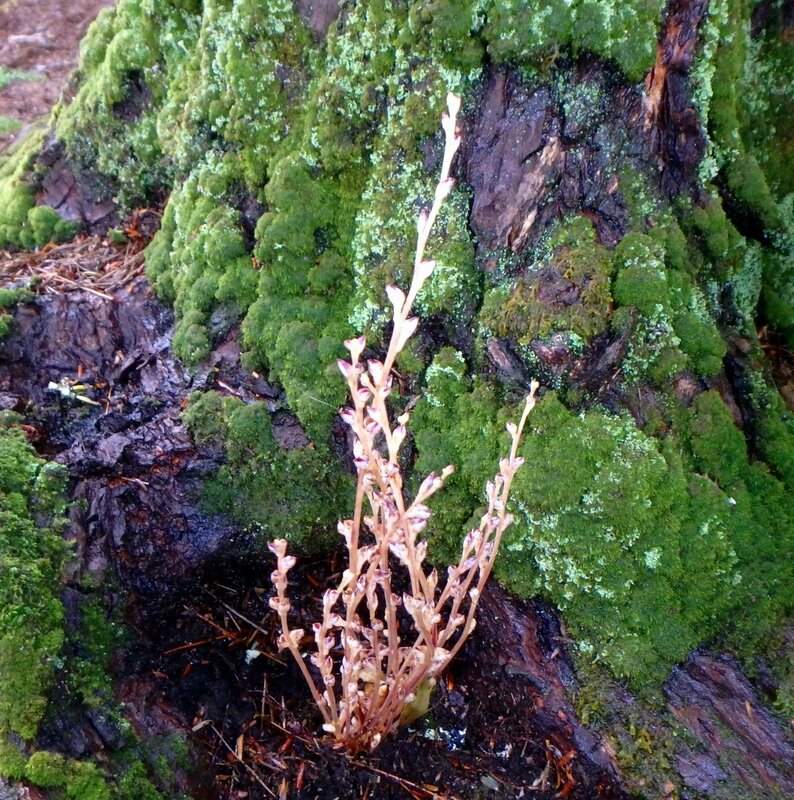 The bitter roots of this plant were used medicinally by Native Americans to relieve gastric irritation, as an expectorant, and to induce sweating. The seeds were roasted and ground into a flour or meal by some tribes, and the flowers were dried and used as snuff to treat nose bleeds. Natives introduced the plant to the European settlers and they used it in much the same ways. There are enough goldenrods (over 100) that look enough alike to make me absolutely sure that I don’t want to invest much time in trying to identify them all, but some are easy. Gray goldenrod (Solidago nemoralis) is one of those. It’s one of the earliest to bloom and always looks as if a strong wind has blown all of the flowers over to one side of the stem. Even though it is one of the earliest to bloom this year it’s blooming even earlier than usual. 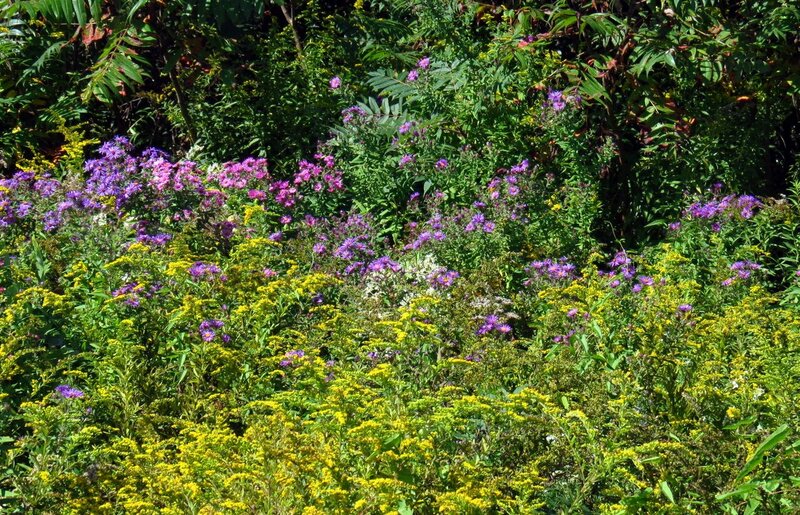 Goldenrod blooming alongside purple loosestrife is a beautiful scene that I look forward to seeing all summer. 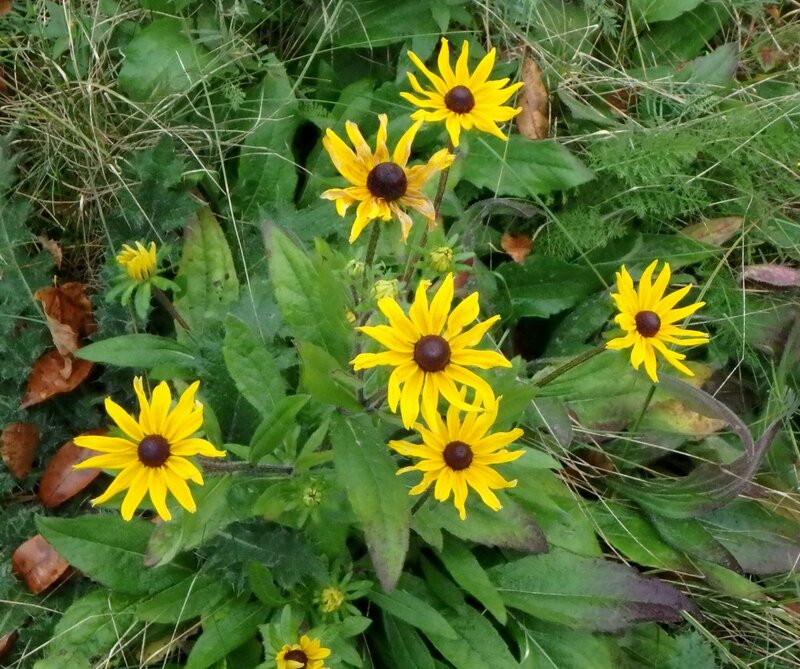 The record breaking warmth of October continued into the first week of November and that means, for the first time in nearly 8 years of this blog, that I can use “Early November Flowers” for the title. But by the second week of the month it was back to reality and as I write this on the 11th we saw record breaking cold temperatures this morning. Instead of flowers I was photographing ice and snow, so there’s a good chance that you won’t find another rose like this one here until next summer. After record warmth for the last three months and now record cold, it seems as if the weather doesn’t know if it’s coming or going. At this time of year any flower is welcome. If it were a normal year asters and just about every other flower would be long finished blooming by now, but I found several examples of this aster growing in a group. The roadside grasses had been mowed all around them but they were left untouched. 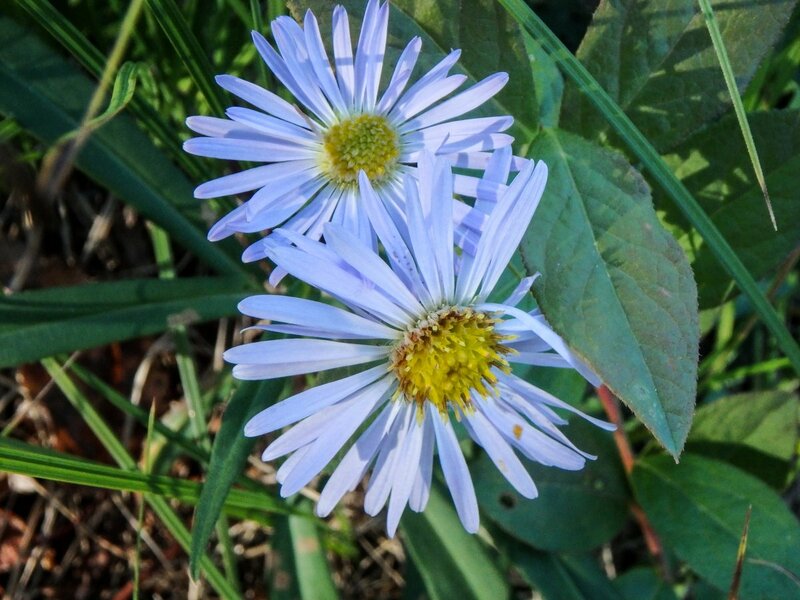 I’m not sure which aster the small blue ones in the roadside colony were, but it was nice to see them. They might have been the sky blue aster (Symphyotrichum oolentangiense.) The flowers were about a half inch across and the plant about two feet tall. 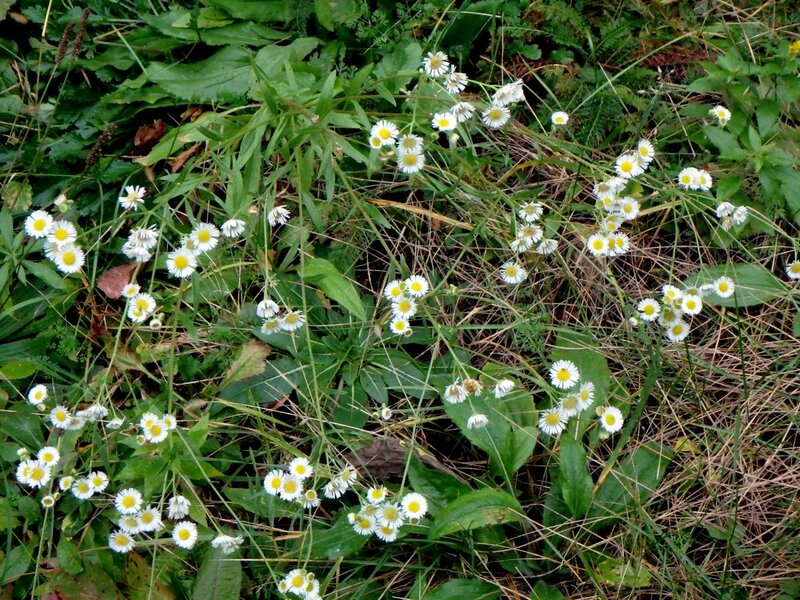 Daisy fleabane (Erigeron annuus) has a very long blooming period. I see them in early June blooming profusely and then sporadically through the following months, but I never expected to see them in November. 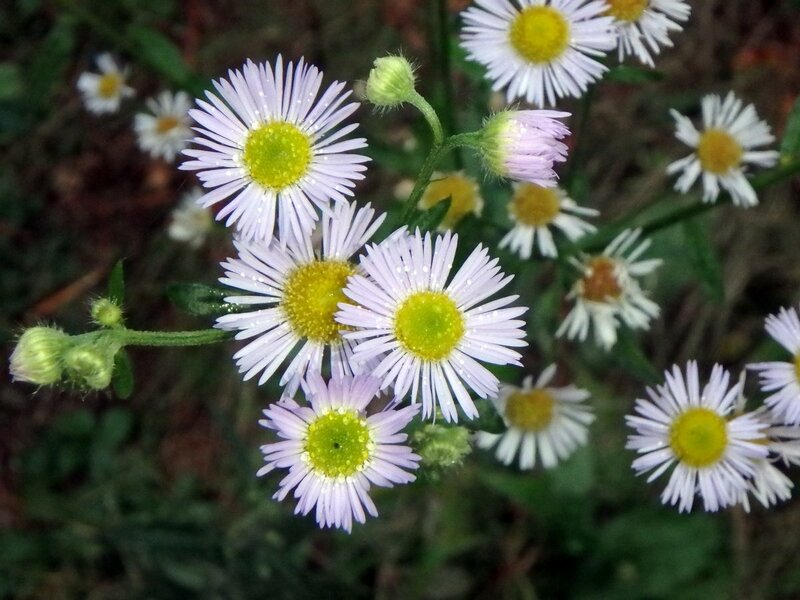 I’ve noticed that when it gets cold the small, normally white daisy fleabane blossoms take on a hint of purple. I’ve seen other white flowers do the same, so it isn’t unusual. Many white chrysanthemums for example will turn purple when it gets cold. Fleabanes get their name from the way the dried plants repel fleas. 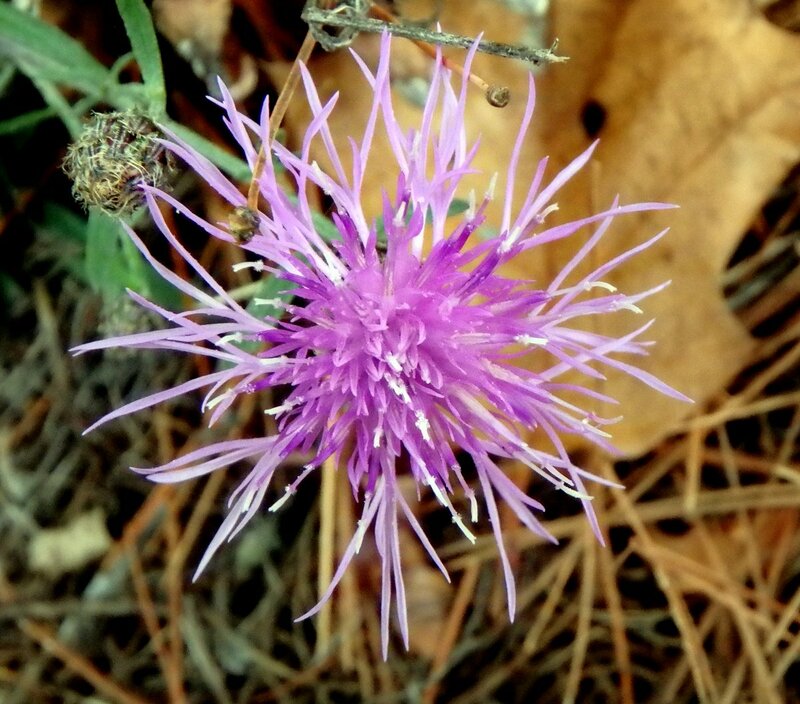 I knew knapweed (Centaurea jacea) was a tough plant but I was a little surprised to see it still blooming. Many of the plants in the colony I visit are simply exhausted I think, and have stopped blooming. Knapweed is very invasive in some areas but we don’t seem to have much of a problem with it here. 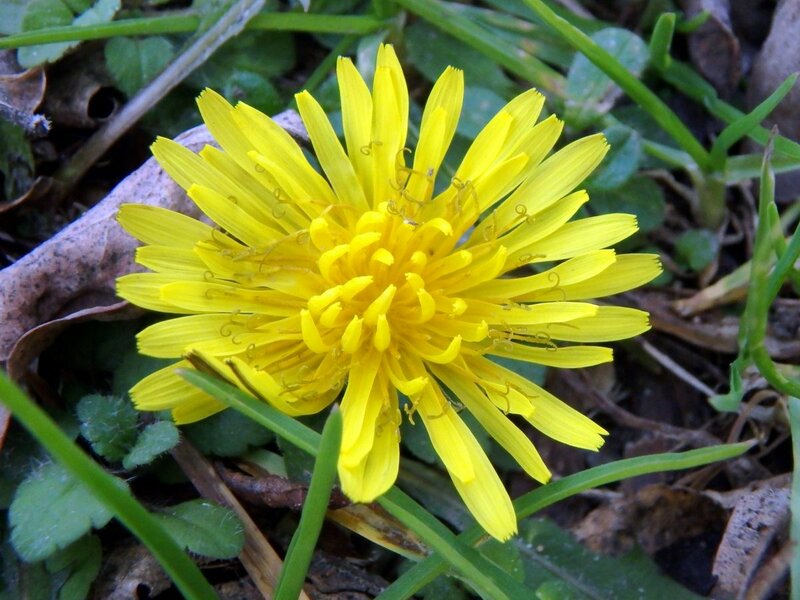 I’ve seen dandelions (Taraxacum officinale) bloom in January but that was a winter when we saw extended 55-65 degree temperatures in that month. It’s still a bit startling to see them so late, but I’m always happy when I do. 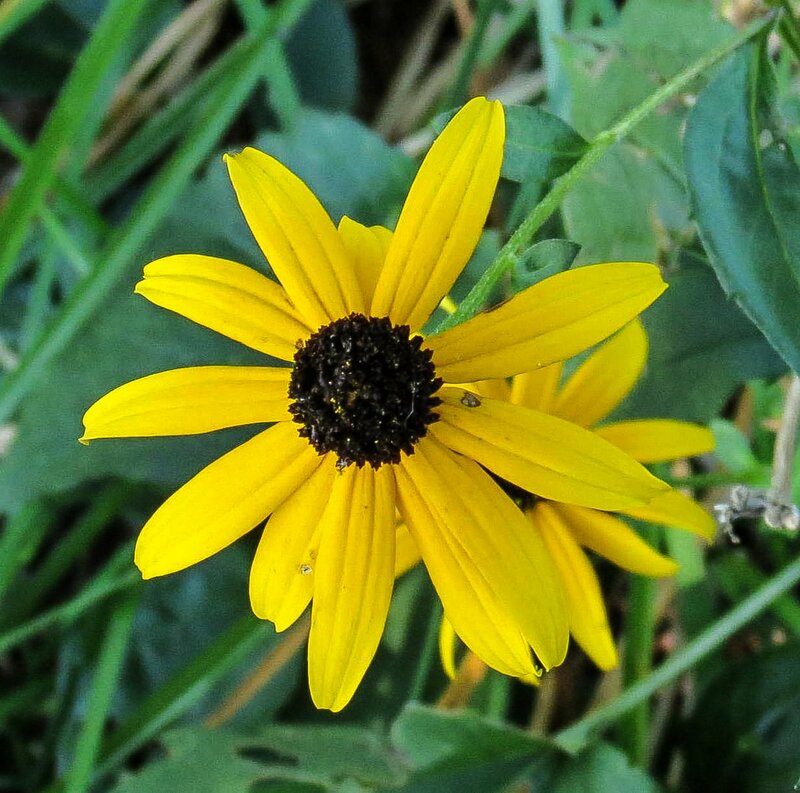 Until they started bothering me by reminding me of fall in June when they start blooming, I never paid a lot of attention to black eyed Susans (Rudbeckia hirta.) They were a flower that I enjoyed seeing along with all of the other summer flowers and that was all, but now I know what a tough plant this is because I saw this very same plant still blooming today after a freezing cold night of 7 only degrees F. There aren’t many of our flowering plants that could take that kind of cold and I never knew this one could until today. Chrysanthemums are plants that I would expect to be able to withstand some cold but I doubt even they could stand 7 degrees. I saw these blooming when it was a relatively balmy 50 degrees. 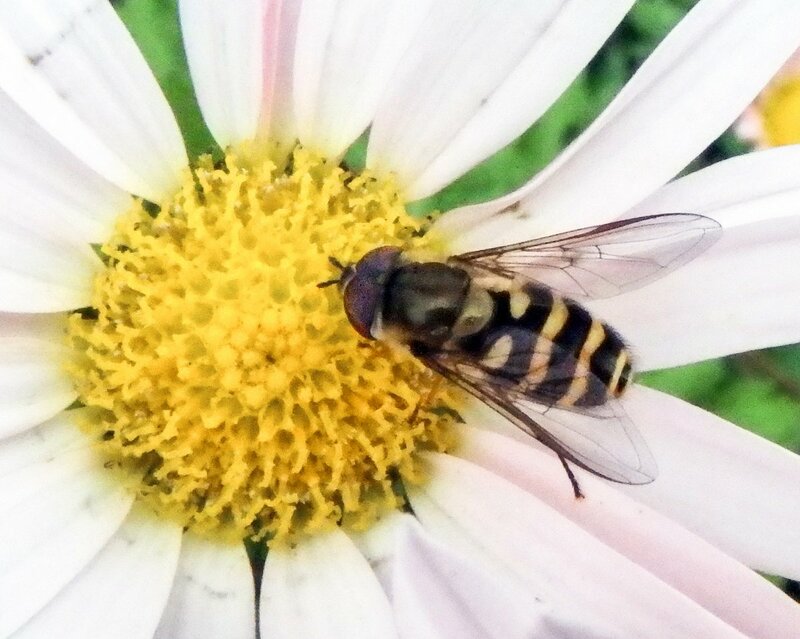 There were hoverflies all over the mums, and I was as surprised to see them as I was the flowers. They were moving over the flowers very slowly, but they were also flying. Several of what I think were hairy white asters (Symphyotrichum pilosum) grew on a roadside and still blossomed heavily. 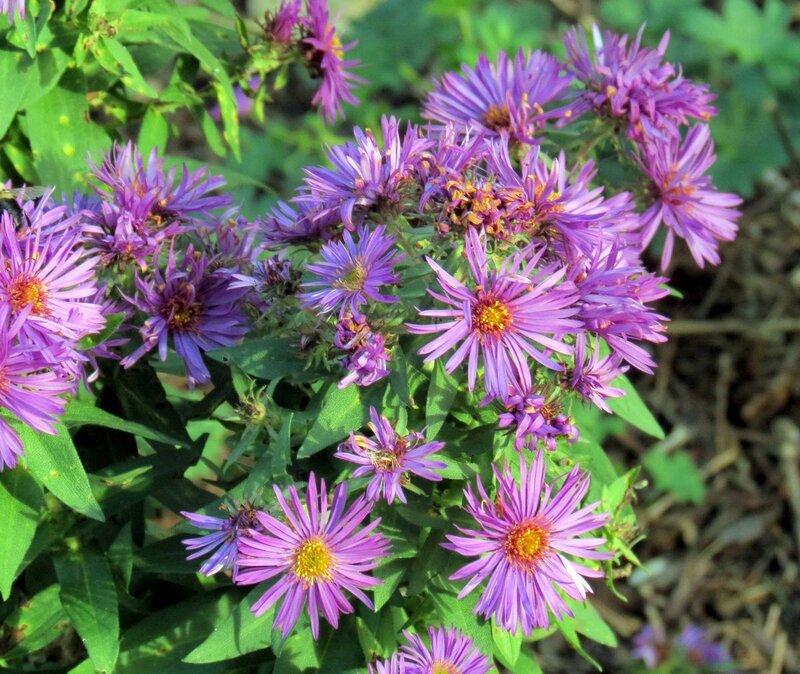 One of the complaints that I used to hear about asters in the garden was their short bloom time and that might be true for cultivated varieties, but our native plants seem to go on and on. 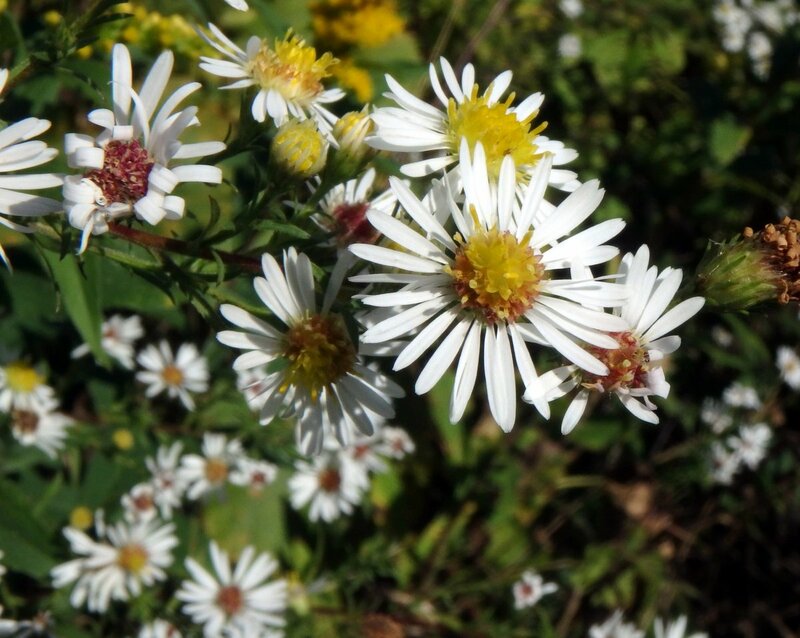 Hairy white asters get their name from their hairy stems and leaves. The pilosum part of the scientific name comes from the Latin pilus, which means hair. 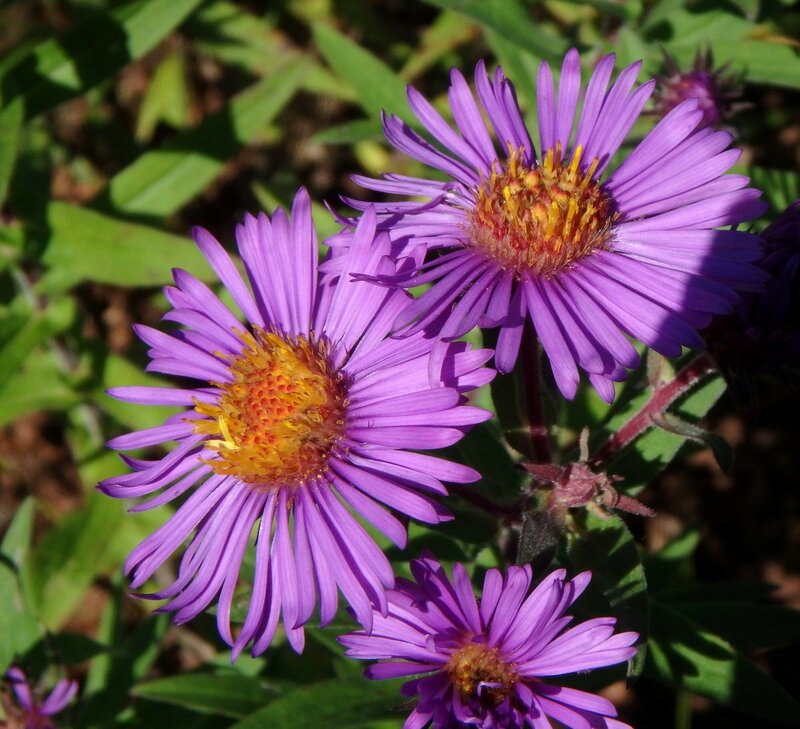 They are also called old field and frost asters. They like to grow in weedy, gravelly waste areas like roadsides. 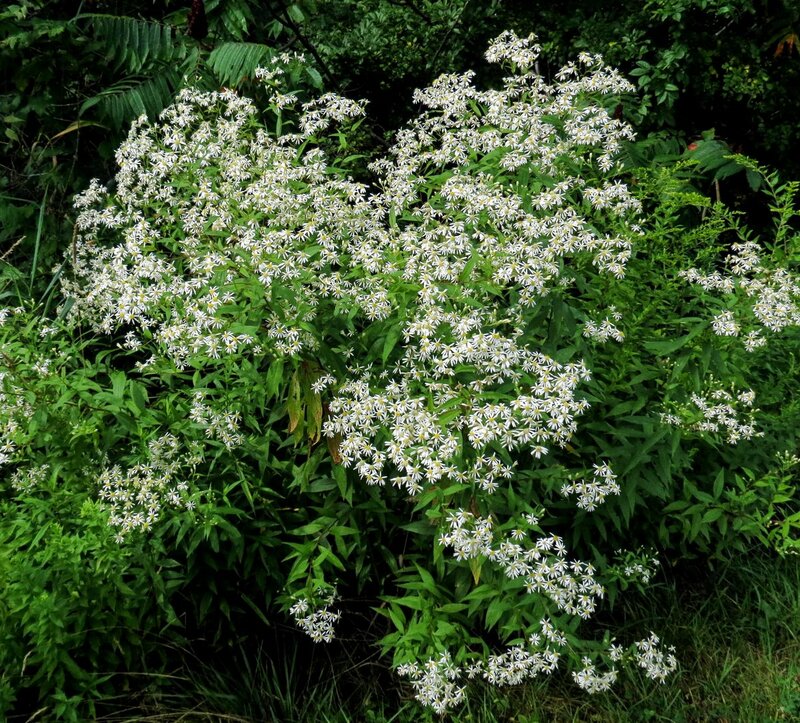 As is true with many asters the white ray flowers look like they were glued on by a chubby fisted toddler with no regard for symmetry. 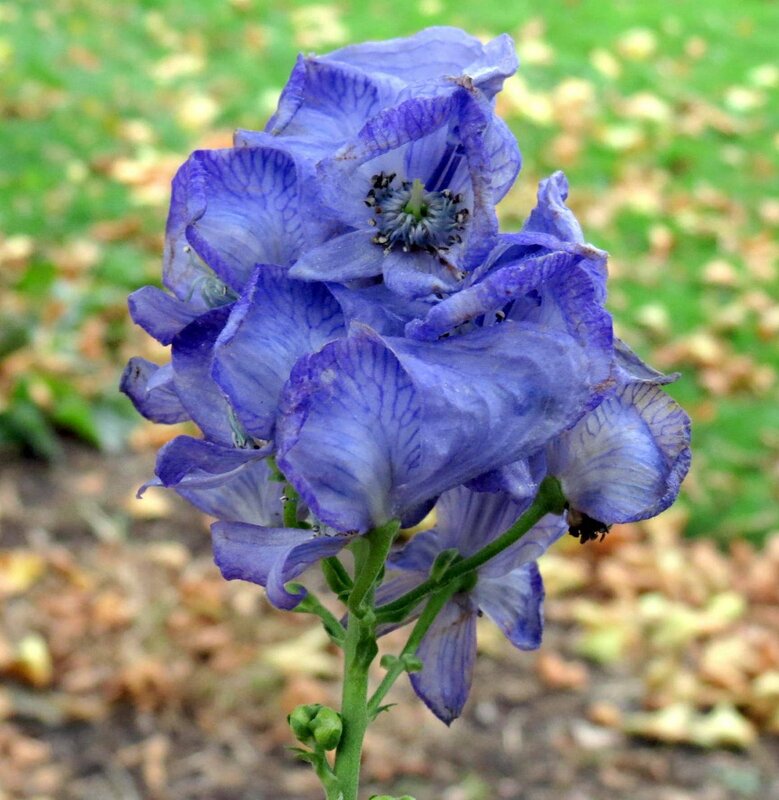 The monkshood (Aconitum napellus) in a local children’s garden still stood tall, even though all of the other plants had been cut down. This could be because the gardener knew of the plant’s extreme toxicity. People have died from the sap being absorbed through their skin so this is a very dangerous plant indeed, and though I have touched it several times I would never cut it or pick it without good stout gloves on. Another name for it is winter aconite, so it wasn’t a surprise to see it still blooming. Though many goldenrods went to seed a month or more ago you can still spot them blooming here and there, and this one was still going strong. 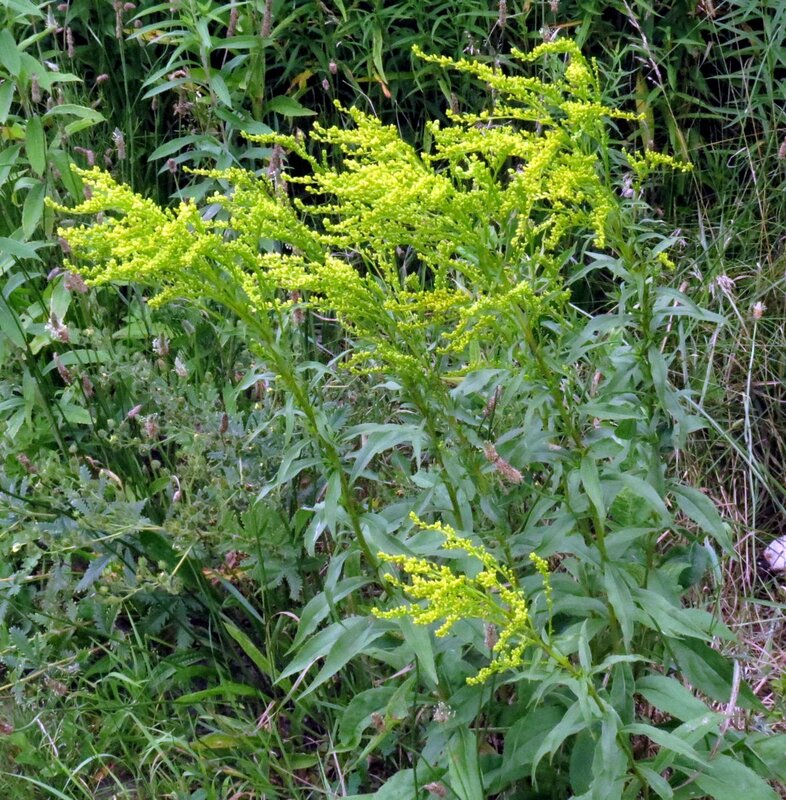 I think it might be tall goldenrod (Solidago canadensis,) but goldenrods are tough to identify correctly. In any event it was quite tall and branched at the top of the plant. Yarrow (Achillea millefolium) flower heads have gotten smaller and smaller into fall, and this one was no bigger than a hen’s egg. Man’s relationship with this plant goes back thousands of years and predates recorded history. It has been found in Neanderthal graves and is mentioned in the Chinese I Ching. It is one of the nine “holy herbs” and was traded throughout the world, and that is thought to be the reason it is found in nearly every country on earth today. It has more common names than any other plant I know of. 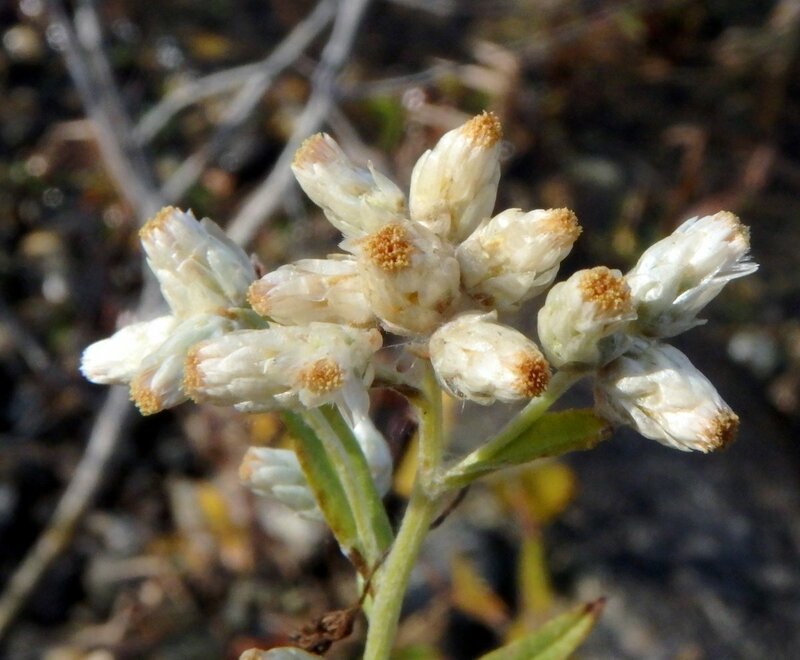 It’s hard to find an open blossom on sweet everlasting (Pseudognaphalium obtusifolium) but they still smell faintly like maple syrup, even when closed. Native Americans added this plant to the smoking mixture they used to communicate with the Creator. 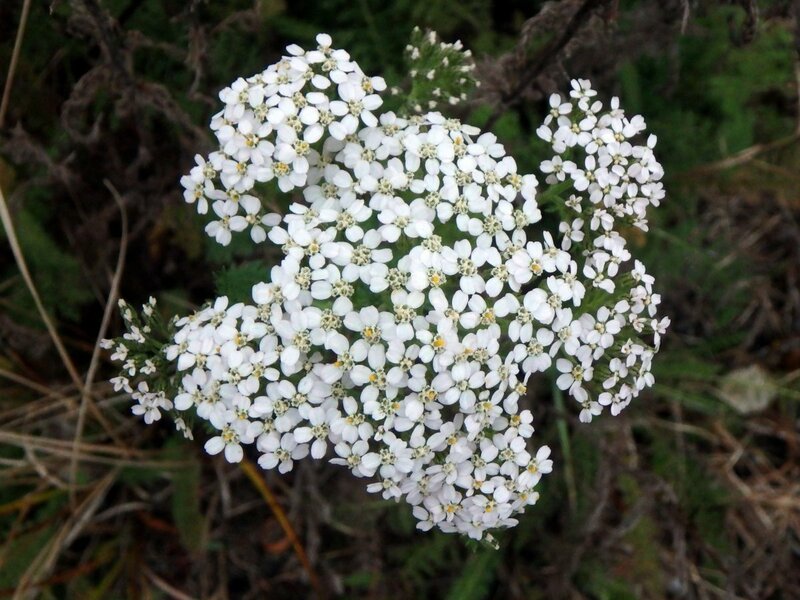 It was and is also used medicinally by herbalists to treat asthma and other breathing difficulties. 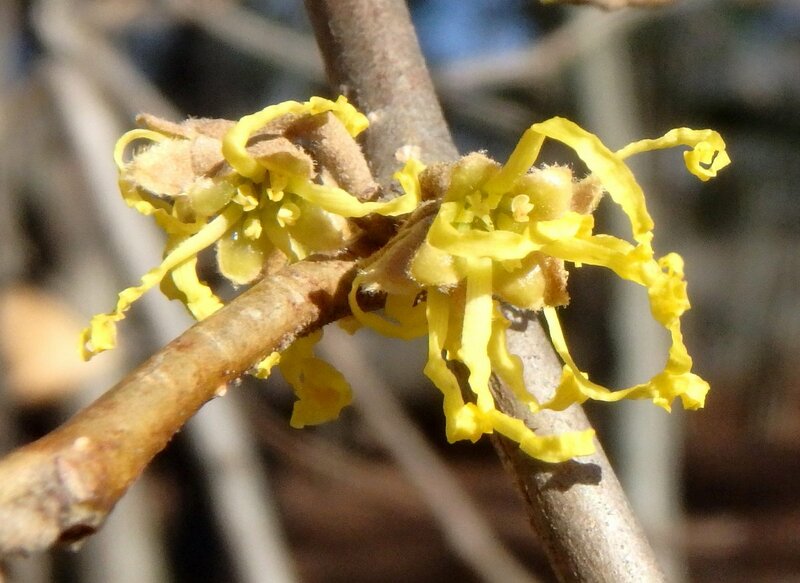 I’ve had a lot of trouble finding witch hazel flowers (Hamamelis virginiana) this year but then on the coldest day so far; a blustery 15 degree wind chill day, there was a plant loaded with blossoms. Now I wonder if the cold is what actually makes them bloom. They are called winter bloom after all. 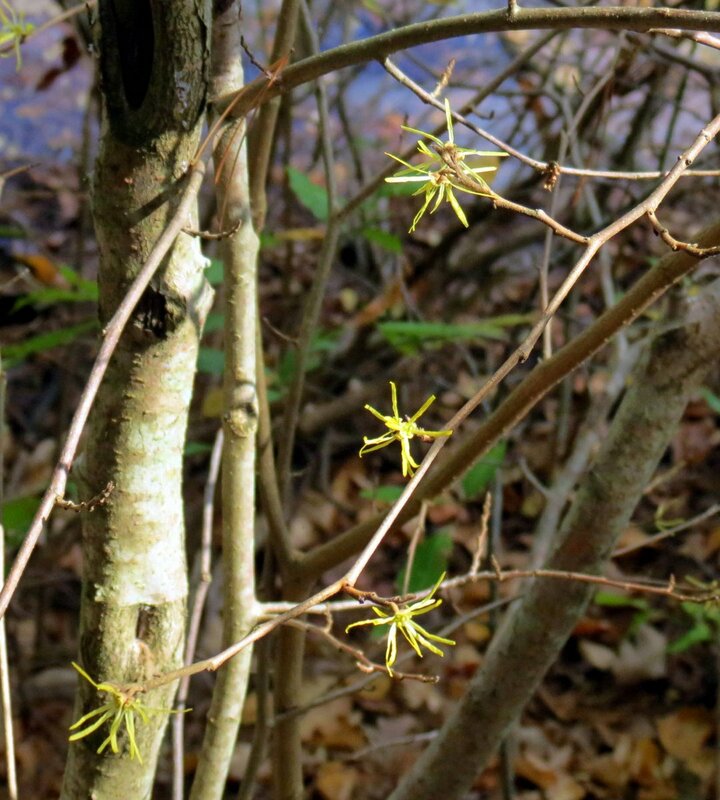 There is little that is more cheering than finding these fragrant yellow blossoms on a warm January day. 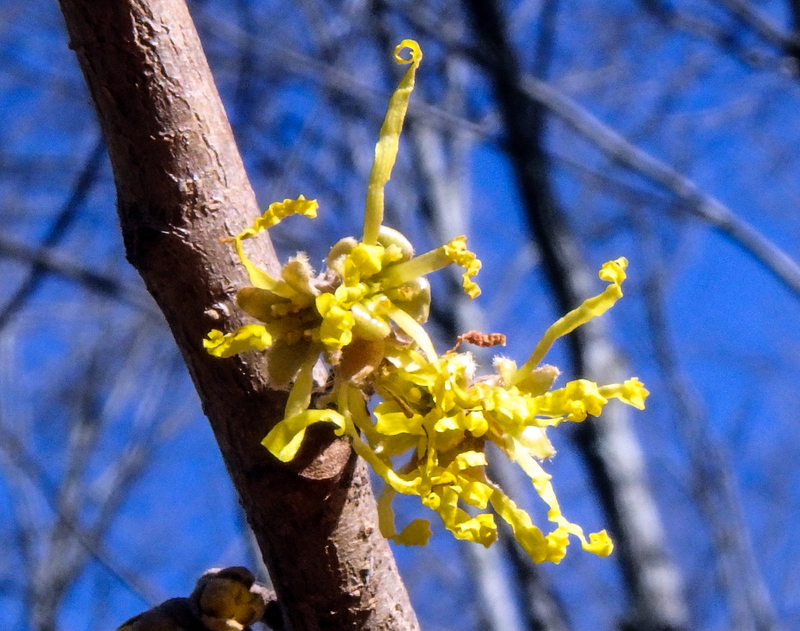 Witch hazel blossoms are pollinated by owlet moths, which are active in winter and are called winter moths, but this year the moths may have help from several other insects I’ve seen still flying. It wasn’t a week ago that I was still seeing dragonflies. I think, in the seven years that I’ve been doing this blog, that this is only the second time I’ve been able to do two full flower posts in October. Though we’ve had a couple of morning frosts it is still very warm here, and some days could even be called hot. 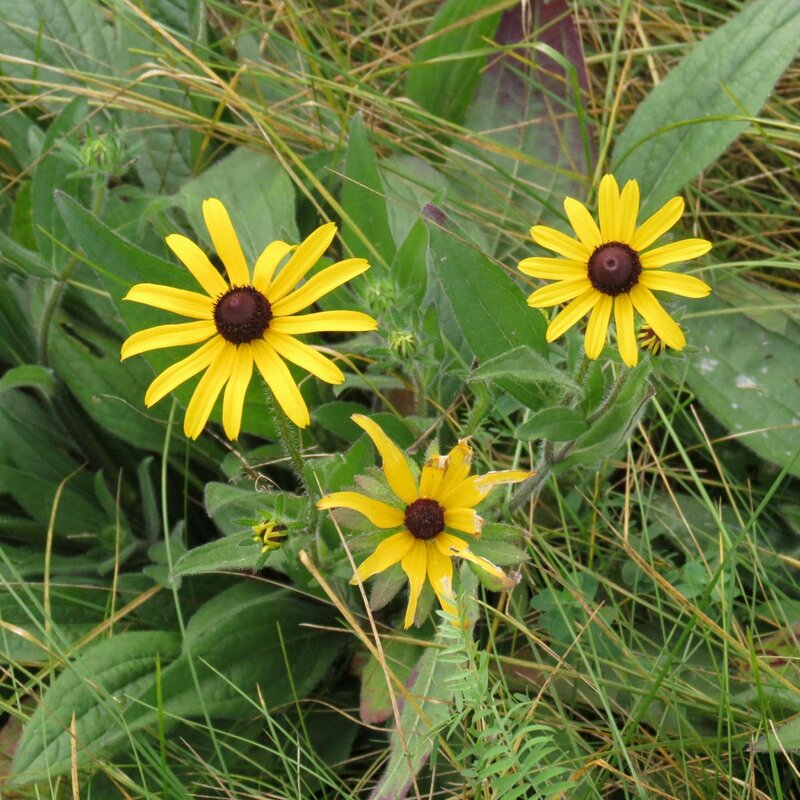 Black eyed Susans (Rudbeckia hirta) aren’t just blooming right now; they’re thriving, and I’m seeing them everywhere. Is there any wonder I always think of them as fall flowers? When they appear in June it always seems to me that they’re trying to rush things along a bit, but life would be a little less cheery without them so I don’t begrudge their early arrival too much. I think they must hold the record for our longest blooming flower; almost a full 5 months this year. 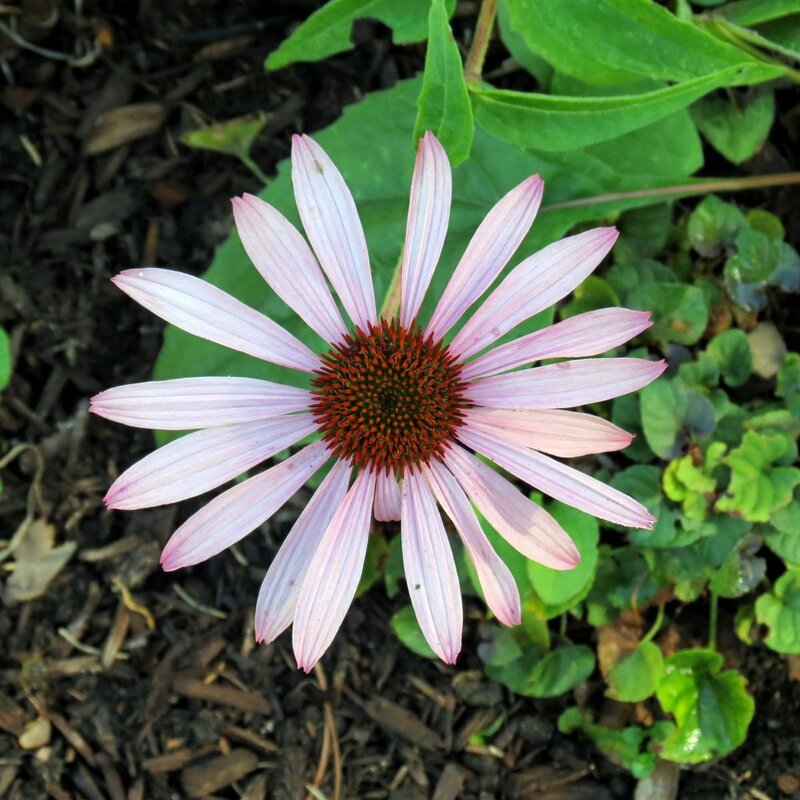 This purple coneflower (Echinacea purpurea) looked like it had been through the wash. Its color had faded to a kind of pinky brown and its dry petals felt like paper, but the camera saw what it wanted to see and voila; a new flower was born! Now if only I could learn how to make the camera do those kinds of things when I wanted it to. Most jewelweed (Impatiens capensis) plants are finished for the season but I found a small colony of plants blooming away under some trees at the edge of the woods. Apparently they didn’t get the message that their time was up because they looked as fresh as they do in July. There are still plenty of pollinators about too, and I’m sure they’re happy to see more flowers blooming. Most knapweed plants (Centaurea jacea) in this colony dried up from the heat and then were mowed down, but they’ve come back with renewed vigor and several were blooming, much to the delight of all the bees and butterflies that were swarming around them. Brown knapweed is very invasive in some states but we don’t seem to have much of a problem with them here. This is an established colony that has been here for years but it doesn’t seem to get any bigger. When I need to visit with knapweed this is where I come. 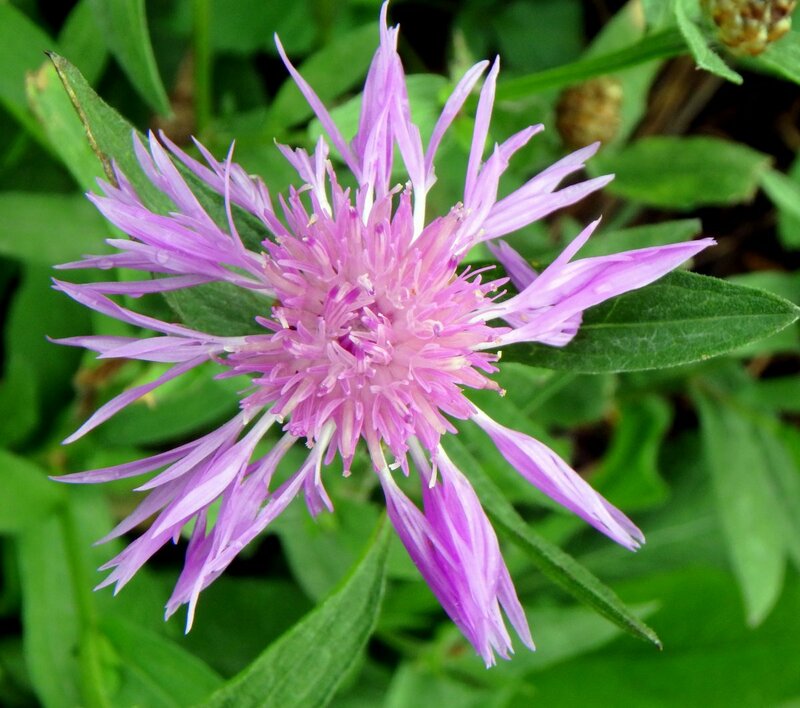 Perennial bachelor’s button (Centaurea) is in the same family as knapweed, so it’s no wonder they look so much alike. I found this one growing in a local park. This plant self-seeds readily and can take over a garden corner if its seedlings aren’t pulled. There are a few things about the Stella D’ Oro daylily (Hemerocallis) that don’t appeal to me. 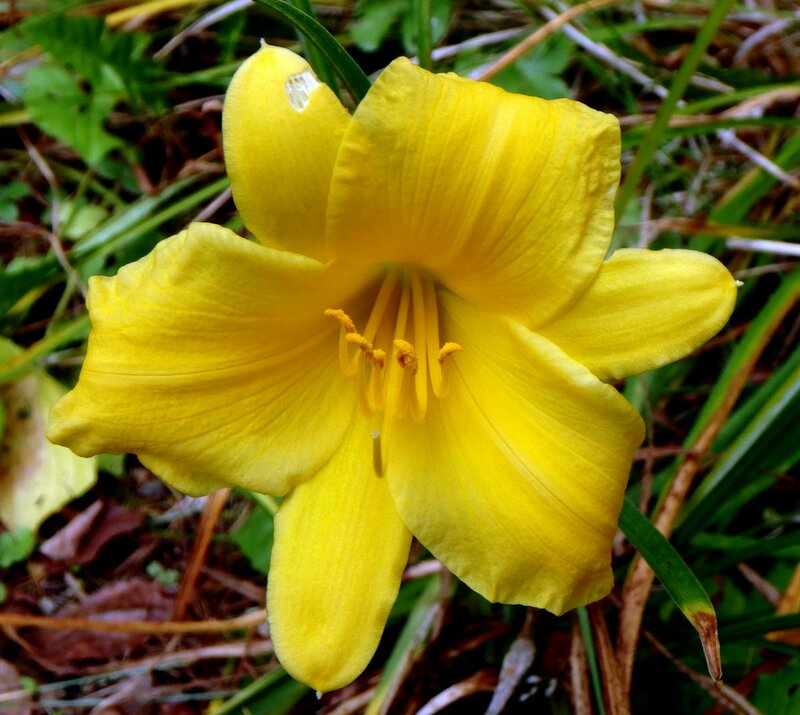 Though it’s supposed to be a “re-blooming daylily” after its initial flush of bloom in late spring it blooms only sporadically throughout the rest of summer. It is also very short, which isn’t a problem in a bed full of daylilies but it always seems to look out of place in the front of a bed of mixed perennials. The third thing that doesn’t appeal to me is its over use. I see it everywhere I go; banks, gas stations, malls, and anywhere else that someone wants flowers but doesn’t want to have to fuss with them. But I can easily forgive all of that at this time of year because quite often they are the only flower still blooming. It’s a tough plant; I’ll say that for it. Native wild geraniums (Geranium maculatum) are still blooming but instead of in the woods this one bloomed in a local park. 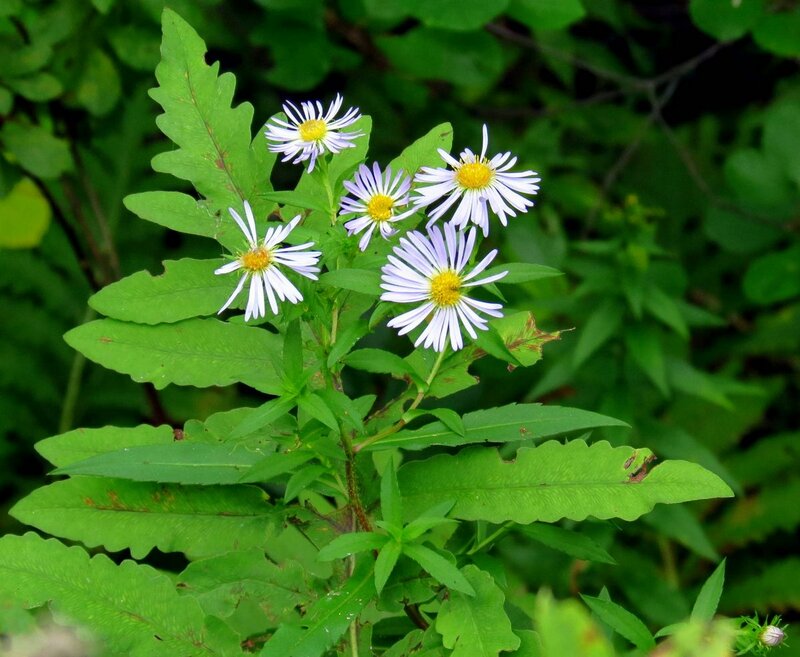 Native Americans used these plants medicinally in a tea to treat toothaches and as a nerve tonic. The seed pods have long beaks and for that reason the plant is also called crane’s bill. It has quite a long blooming period and is very hardy. 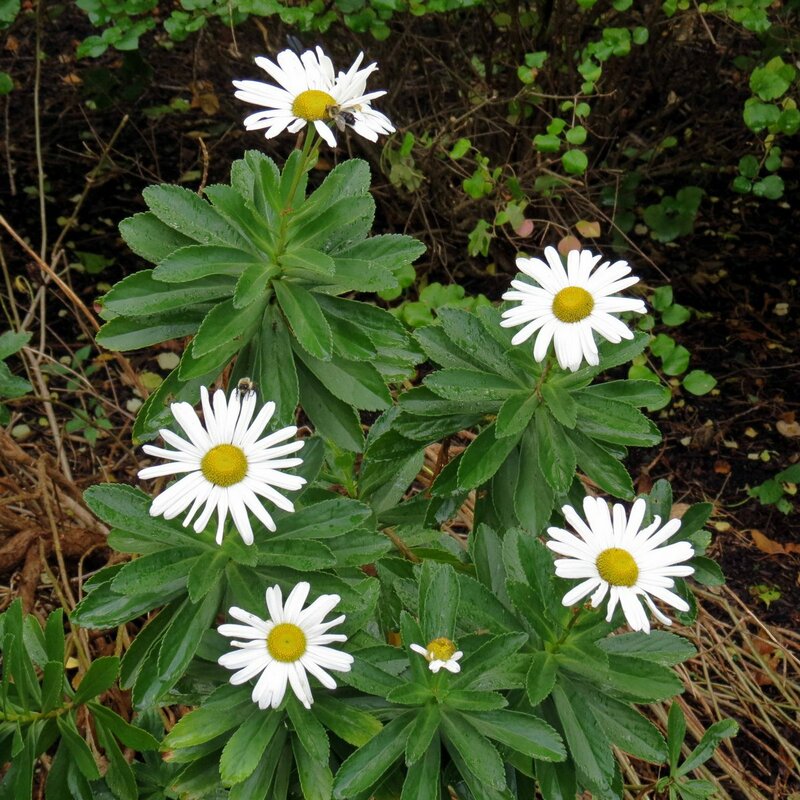 When I first saw this plant blooming while snow was falling a few years ago I thought it was a Shasta daisy on steroids, but it turned out to be the Montauk daisy (Nipponanthemum nipponicum) which is a Japanese creation also called the Nippon daisy. It is extremely hardy; I’ve seen it bloom after a 28 degree F. night and it is also a very late bloomer. It would be an excellent choice for a fall garden. 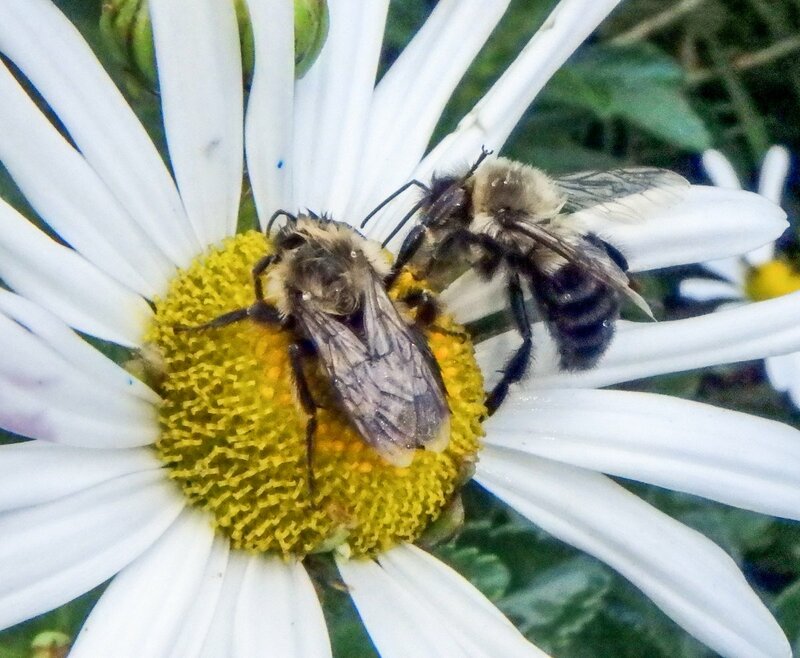 The bumblebees were certainly happy to see the Montauk daisies blooming. The warmth has kept the bees going but it hasn’t kept many flowers blooming so now when I see a plant in bloom it is almost always covered with bees. Polyantha roses still bloomed in another park. 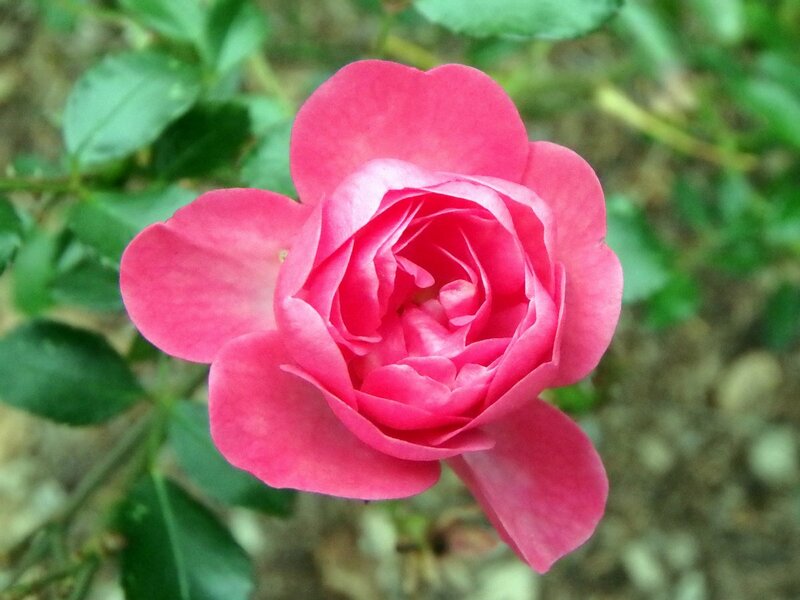 This small flowered rose usually blooms from spring through fall, often covered in flowers. 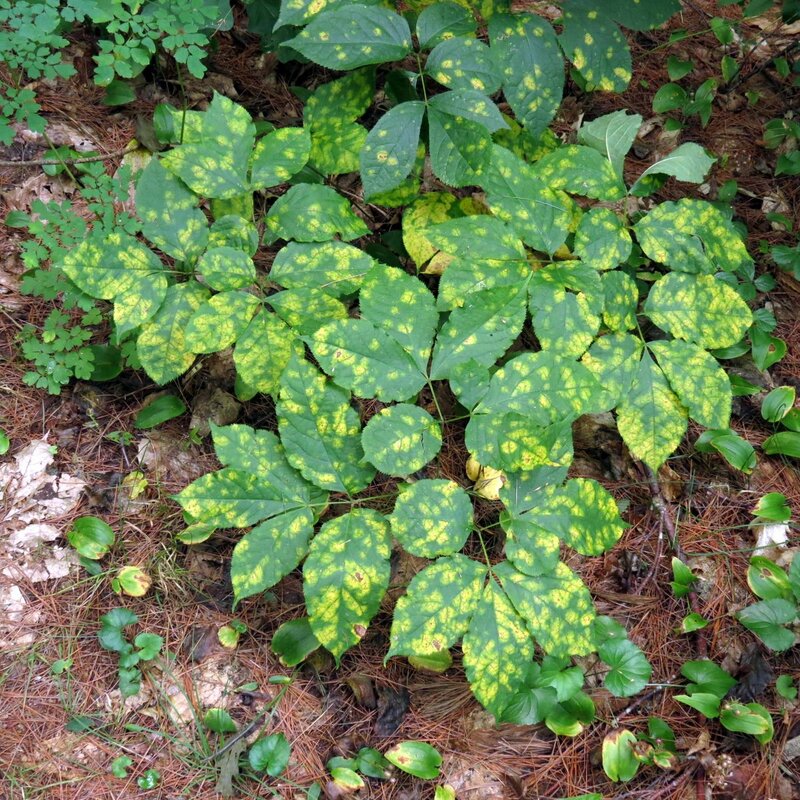 It is usually disease resistant but this example’s leaves were covered in black spot, which is a fungus, and were tired looking. 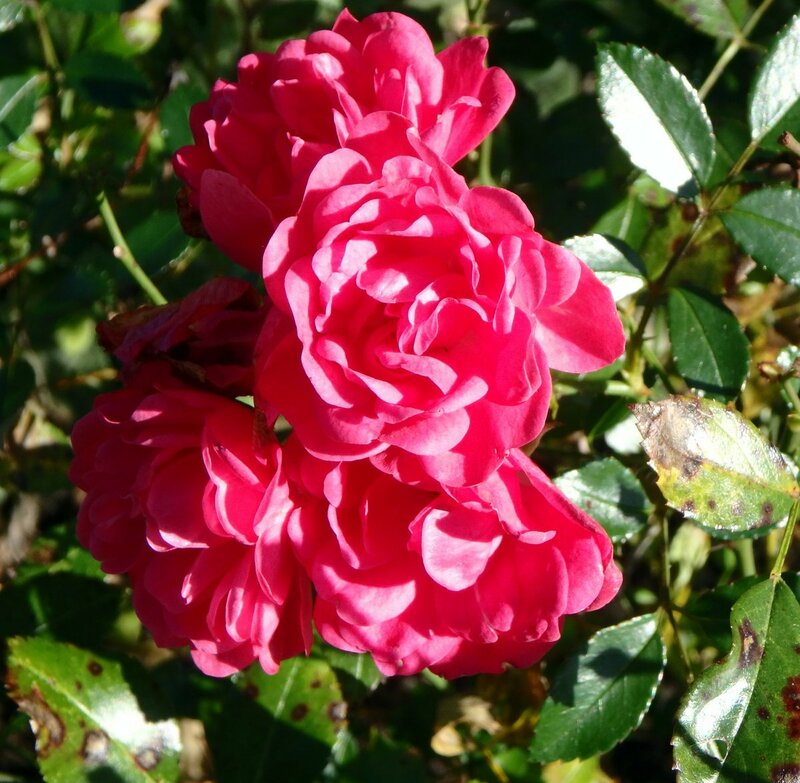 In general they’re good low maintenance roses that are small enough to be used in just about any size garden. A good fungicide would take care of the black spot on this one, but the leaves should also be raked up in the fall and destroyed. We do love our asters here in New Hampshire, enough to grow them in our gardens even though the meadows are full of them. 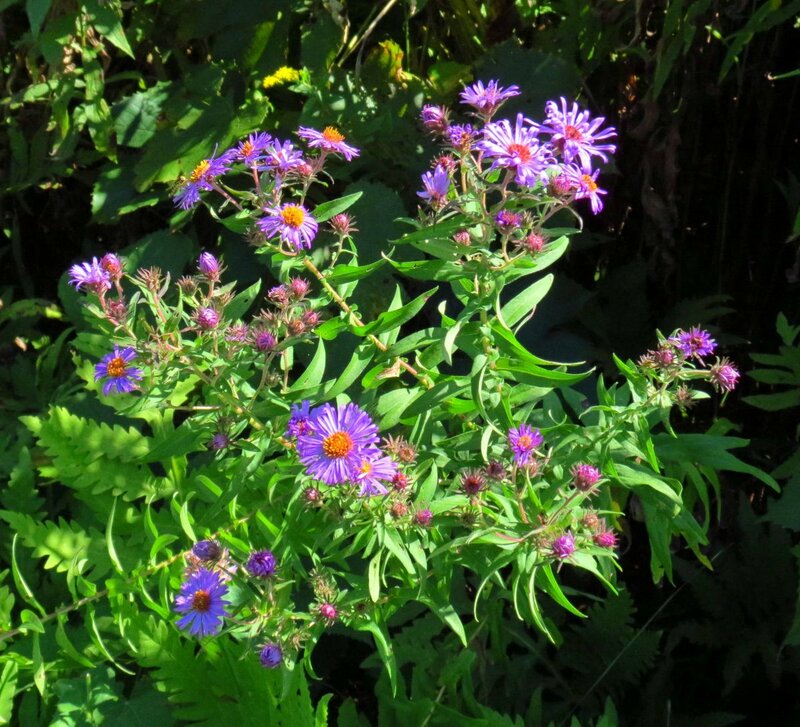 This hybrid version of a dark purple New England aster grew in a local park. I found this New England aster (Symphyotrichum novae-angliae) blooming even though it was only about 3 inches tall. It was on a roadside that had been mowed earlier, but even after being cut it still bloomed. I’ve seen other plants do the same. I had never seen an azalea blooming in October until I saw this yellow evergreen azalea doing just that. It had about a dozen flowers on it, and I wonder if it will have a dozen fewer in the spring. 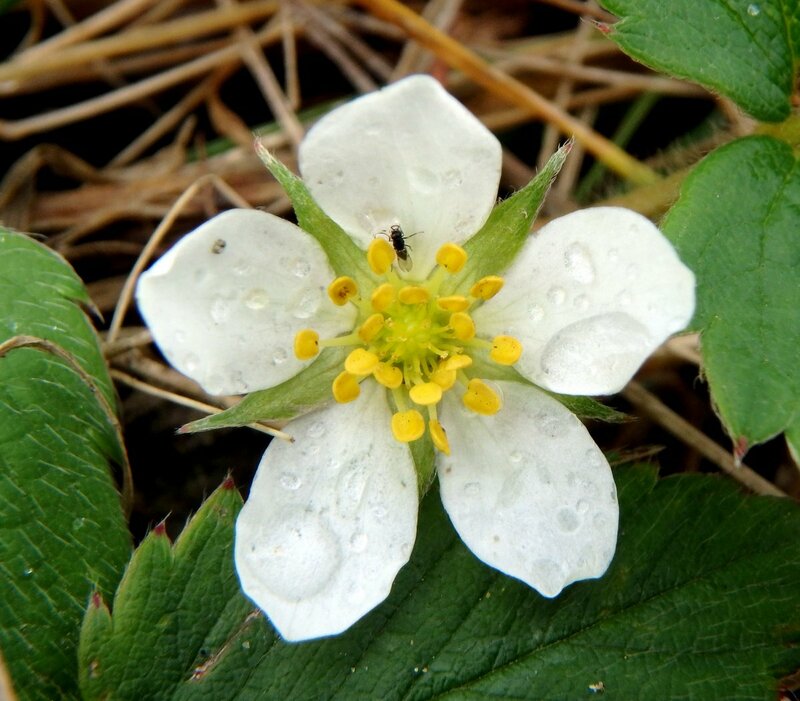 I wonder what Native Americans would have thought of seeing wild strawberry blossoms (Fragaria virginiana) in October. I think they would have been happy to see them, though probably a bit confused. Strawberries were an important food and were eaten raw or mixed with cornmeal and baked into strawberry bread. 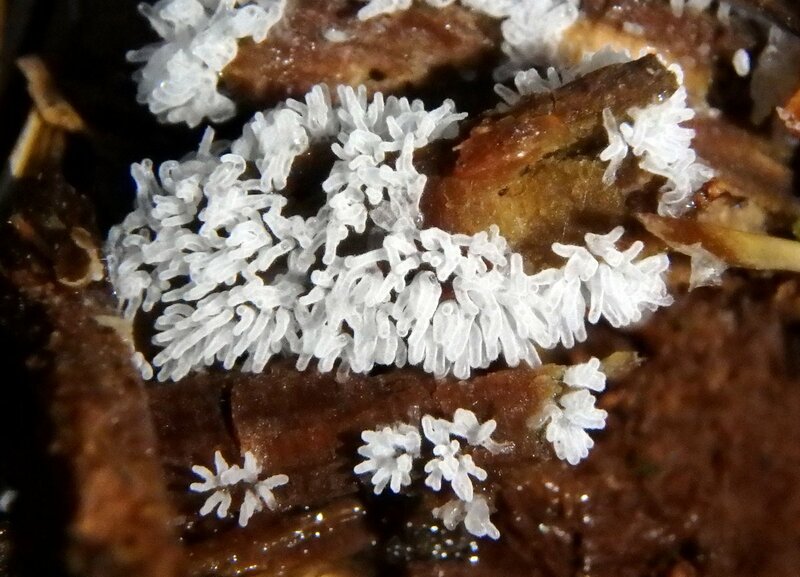 They were also dried and preserved for winter, often added to pemmican and soups. Natives also made a tea from the mashed berries, water and sassafras tea. It was called Moon tea in honor of the strawberry moon in June. A tea made from strawberry leaves was used to clean teeth and stimulate the appetite. A spaghetti squash grew in the compost pile where I work. 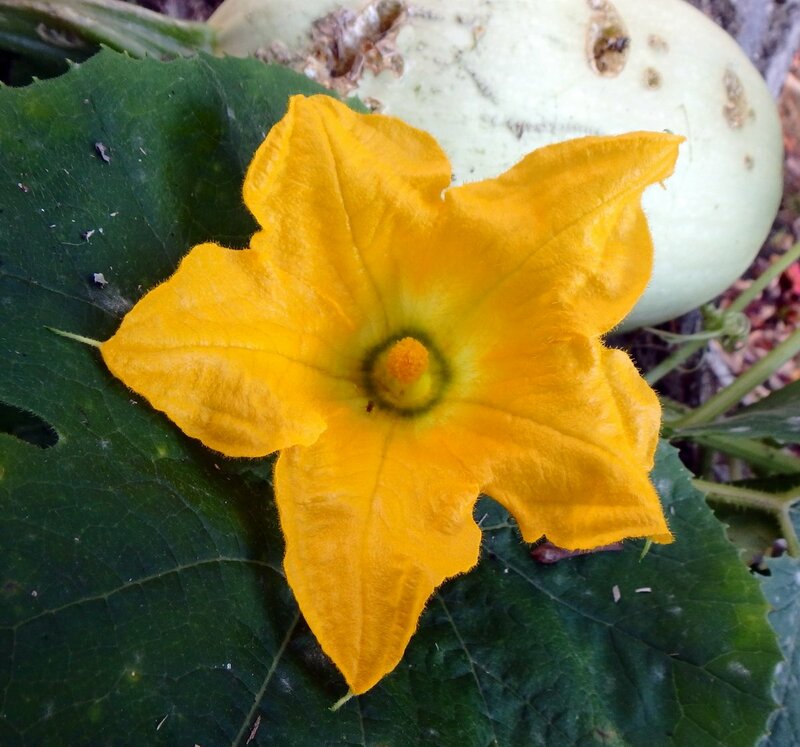 It’s late for squash plants to be blossoming but stranger than that is how nobody can remember a spaghetti squash ever having been cooked or eaten there. How the seeds got into the compost pile is a mystery. We picked one good squash but the one in the photo looks like it has slug or some other kind of damage, so it’ll probably stay in the compost pile. This bumblebee’s pollen bags were full of yellow pollen but I don’t know if it came from this globe thistle flower head (Echinops) or not. It was working the long tubular blossoms over furiously. 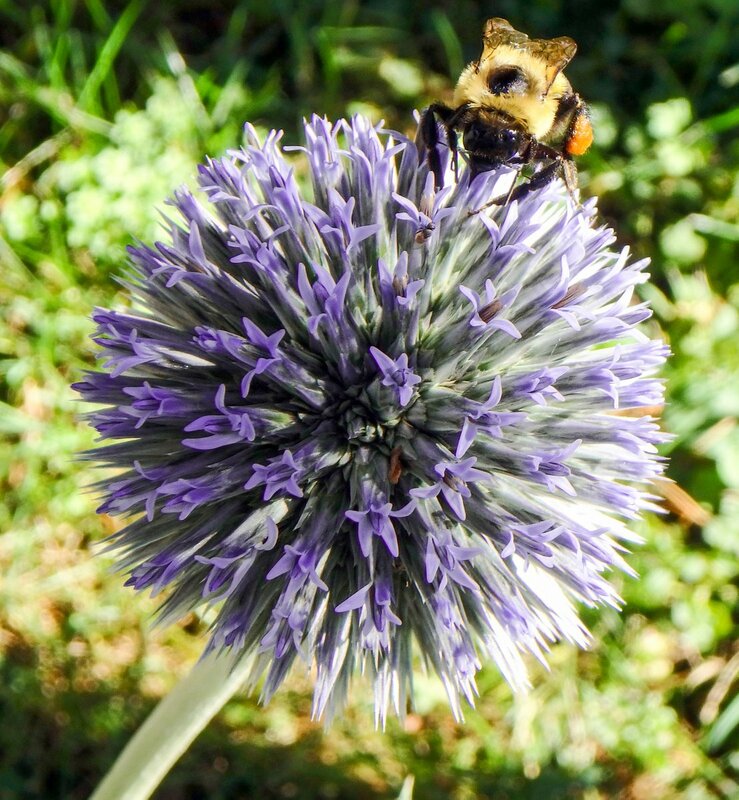 Even though globe thistle is originally from Europe and Asia our native bees love it. It should be done blooming by now but this plant had this blossom and three more buds on it. 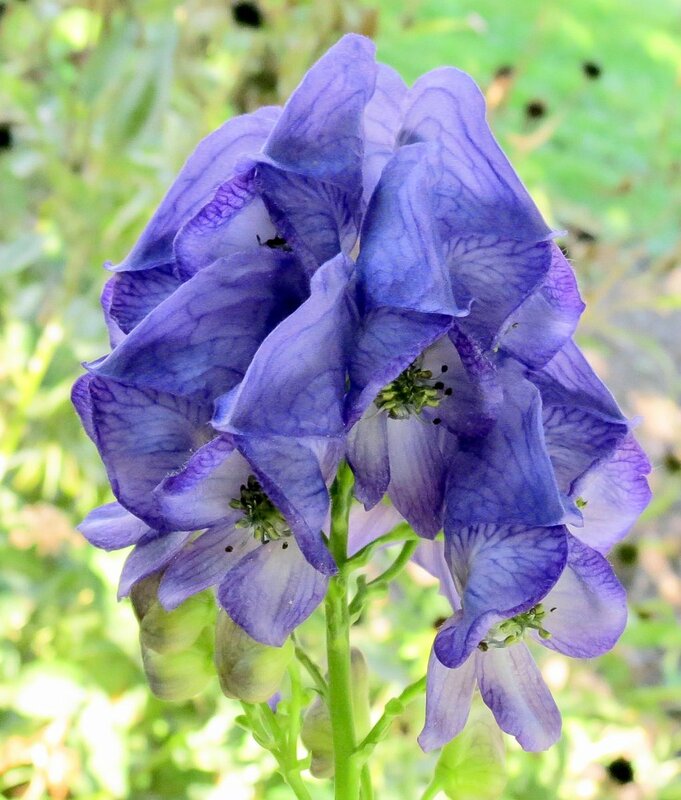 If you were found growing monkshood (Aconitum napellus) in ancient Rome there was a good chance that you’d be put to death, because the extremely toxic plant was added to the water of one’s enemies to eliminate them. It was used on spear and arrow tips in wars and in hunting parties. It is also called winter aconite and is so poisonous its aconitine toxins can be absorbed through the skin of some people. I’ve touched it many times with no ill effects but I wouldn’t pick it or rub the sap on my skin. People who have mistaken its roots for horseradish have died within 4-6 hours after eating them. Knowing all of this I shudder each time I see this plant, because it grows in a local children’s butterfly garden. 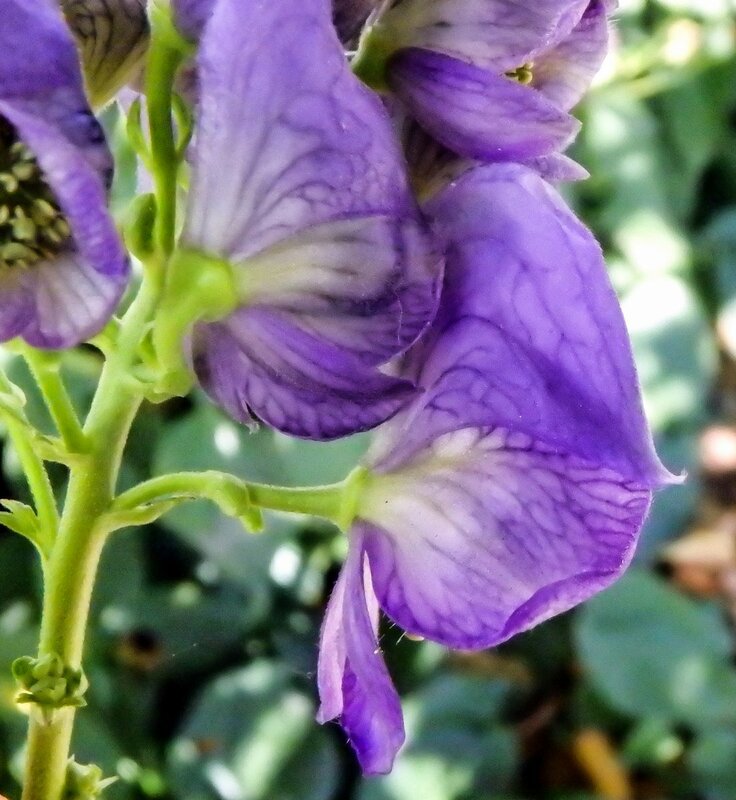 When the blossoms are seen from the side it’s easy to see why this plant is called monkshood. It is also called friar’s cap, leopard’s bane, wolf’s bane, devil’s helmet, and queen of poisons. In 2015 an experienced gardener in the U.K. died of multiple organ failure after weeding and hoeing near aconite plants. 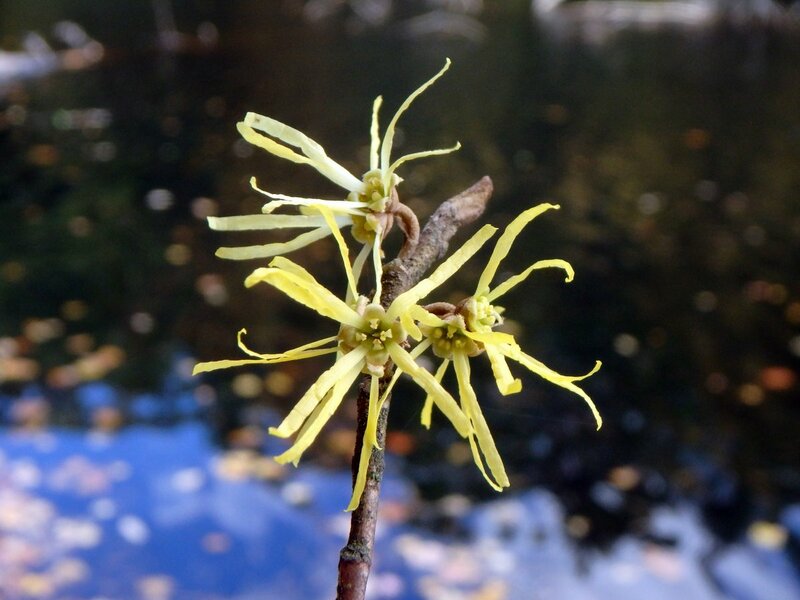 Though I’ve seen dandelions blooming in January witch hazel (Hamamelis virginiana) is considered our last flower of the season and they’ve just started blooming. The flowers are pollinated by owlet moths, which are active in winter and are called winter moths. The moths raise their body temperature by shivering, and can raise it by as much as 50 degrees F. This allows them to fly and search for food when it’s cold. There’s nothing more cheering on a cold fall day than coming upon a thicket of witch hazel in bloom. They might not look very showy but their fragrance makes up for that lack. 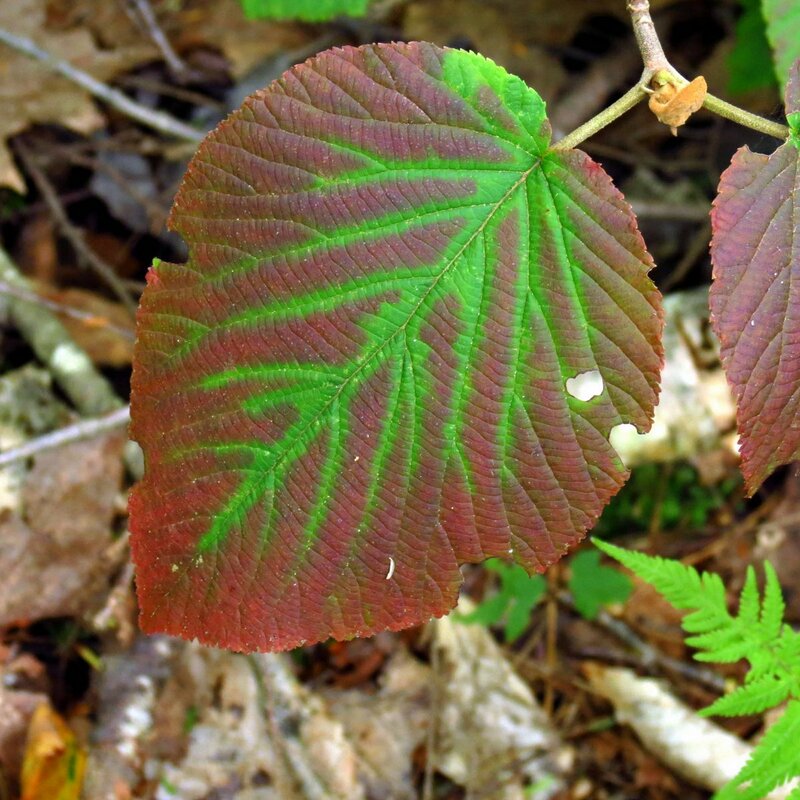 Tea made from witch hazel tightens muscles and stops bleeding, and it was used for that purpose by Native Americans. You can still buy witch hazel lotion. My father always had a bottle of it and used it on his hands. Chances are there will be flowers popping up here and there in future posts, but this will most likely be the last post devoted entirely to flowers this year. Now, though it is supposed to be sunny and 70 degrees today, we wait for spring. Though this pond side view looks like we still have plenty of flowers blooming here in New Hampshire, they are getting harder to find now that we’ve gone into fall. 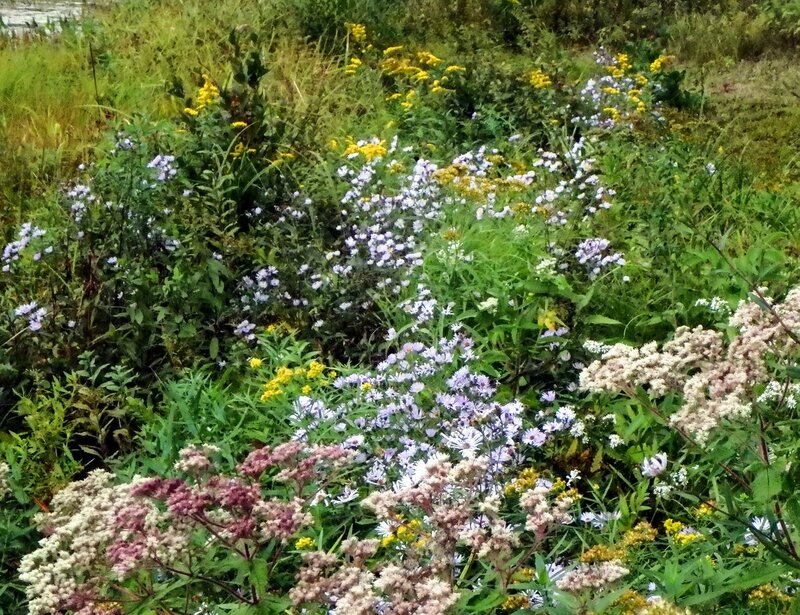 In this view the off white flowers are boneset, nearly gone by, so the only flowers truly blooming are purple asters and goldenrod. There are still other flowers still blooming out there but at this time of year you have to search to find them. At about a half inch across the flowers on the small white American aster aren’t as small as some of the other white asters. 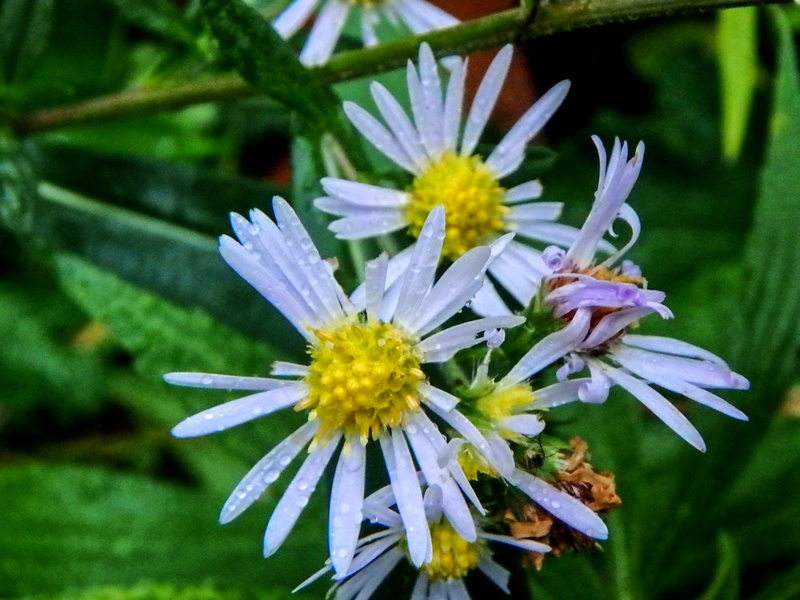 For an aster the petals are arranged very symmetrically. 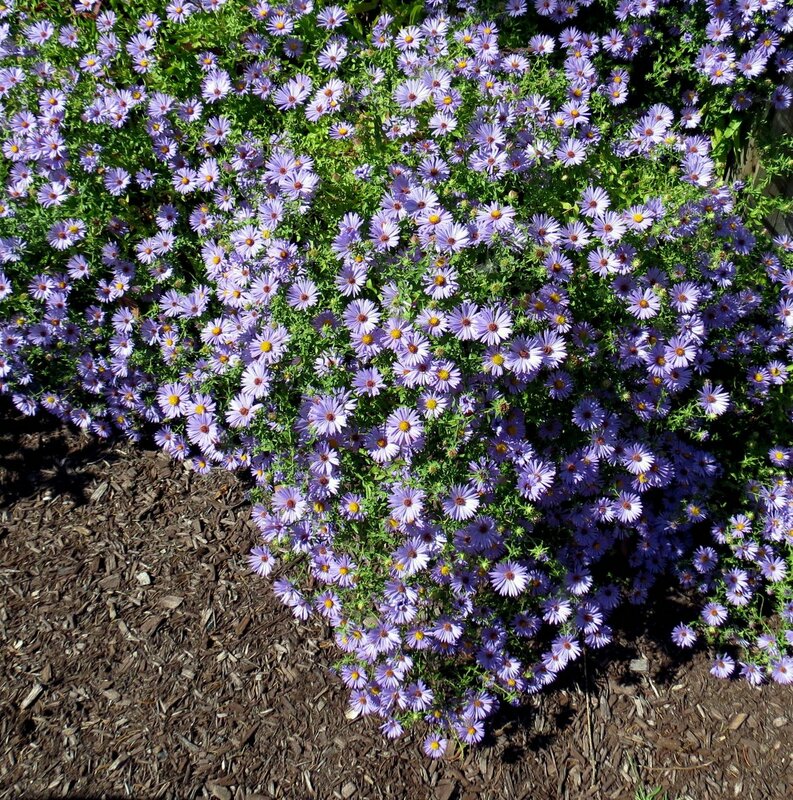 There is a similar aster called bushy American aster that has blue flowers. 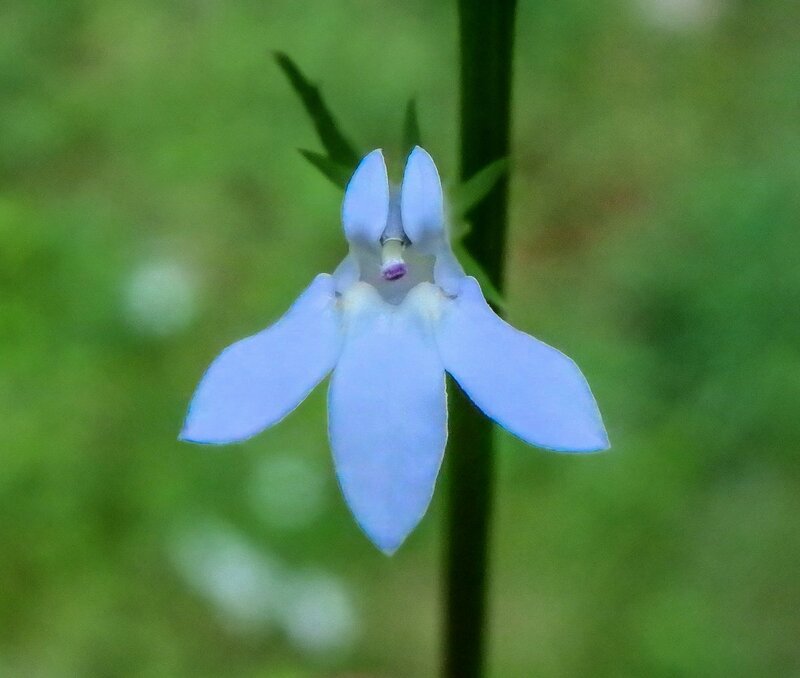 Pretty little blue toadflax (Nuttallanthus canadensis) must be one of the longest blooming wildflowers we have here. It usually starts blooming in May and I’m still seeing it in quite large numbers here in what is almost October. You can’t ask more from a flower than that. I love the shade of blue that it wears. Another of my favorite shades of blue is found on bottle gentians (Gentiana linearis.) My color finding software sees both blue and purple in these blooms but colorblindness turns them all blue for me. I walked along the Ashuelot River to the spot where they grow and, though I thought they were finished for this year, there were one or two still holding onto their color. When they start to go by they turn very dark blue and then a kind of purple. 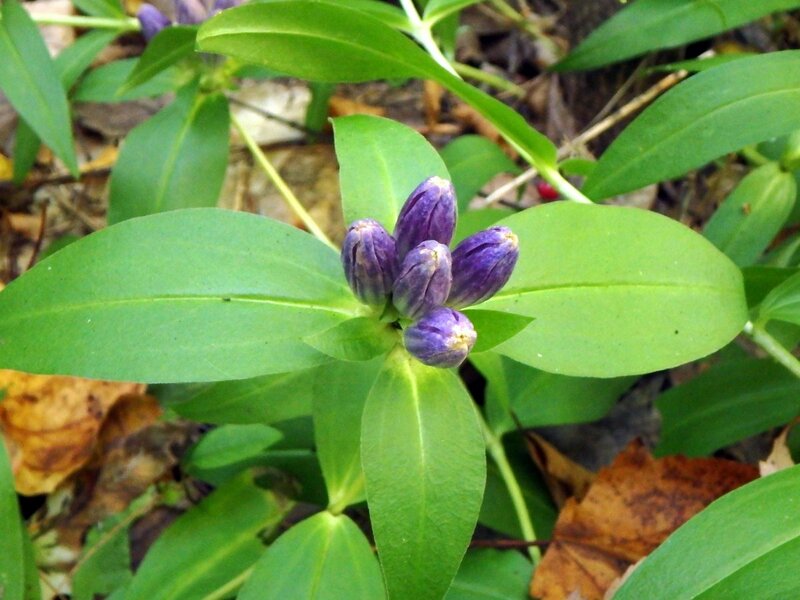 I took this photo of a bottle gentian so those of you who have never seen one would know what to look for. 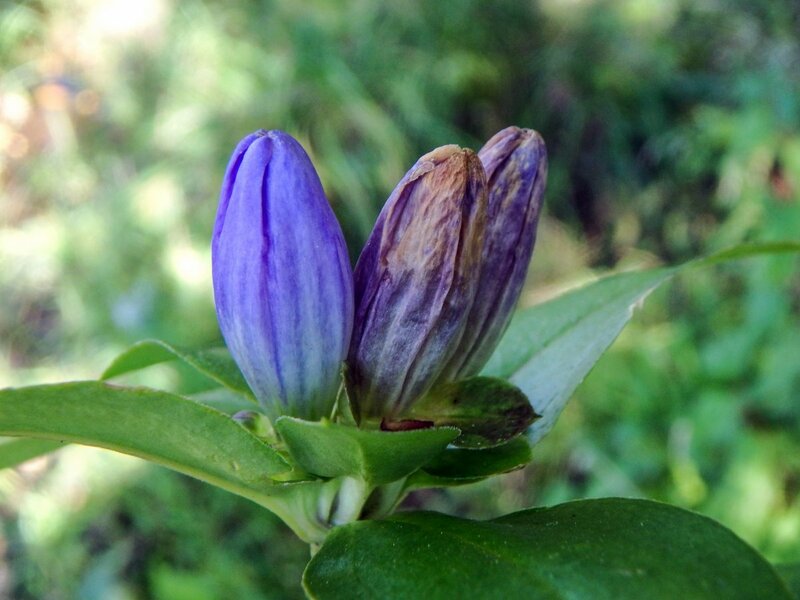 The flowers and growth habit look much like those on a narrow leaved gentian (Gentiana andrewsii) but that plant has narrower leaves. 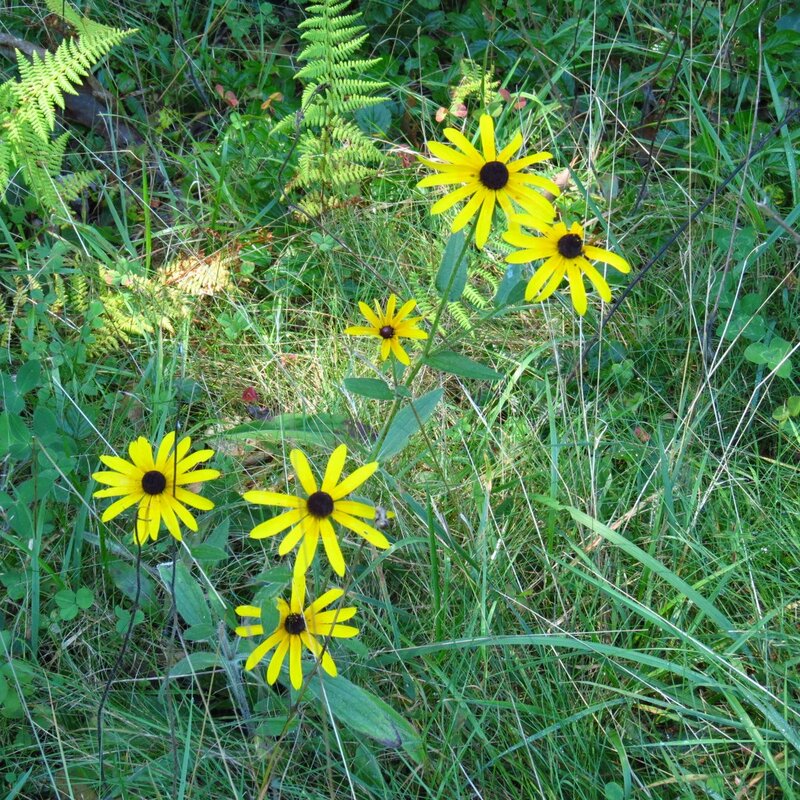 Black eyed Susans are another flower with a long bloom time but they’re getting sparse now and you have to search to find them in this area. Though they start blooming in June I always think of them as a fall flower, so when I see them in June I always have to ask them do you have to remind me so soon? Summer just started! I forgive them for trying to make time pass so quickly though because they’re so cheery, even in June. Tansy (Tanacetum vulgare) is a European native that has been cultivated for centuries. The flat flower heads are made up of many button like disc flowers; almost like a daisy without the white ray flowers that we call petals. Tansy is a natural insect repellent and was used as such in colonial times. Dried tansy added to the straw in mattresses was said to keep bedbugs away. 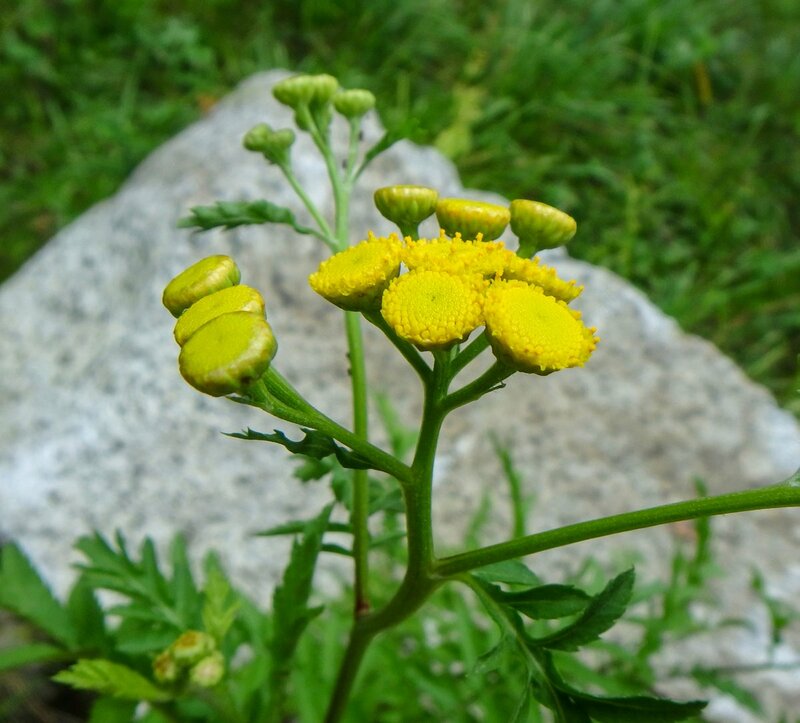 Most tansy plants are seen in gardens but it had naturalized itself in New England by 1785 and can still be occasionally found growing along roadsides. It’s a good plant to use in vegetable gardens for pest control. The ancient Greeks grew tansy for medicinal use but modern science has found it to be toxic. 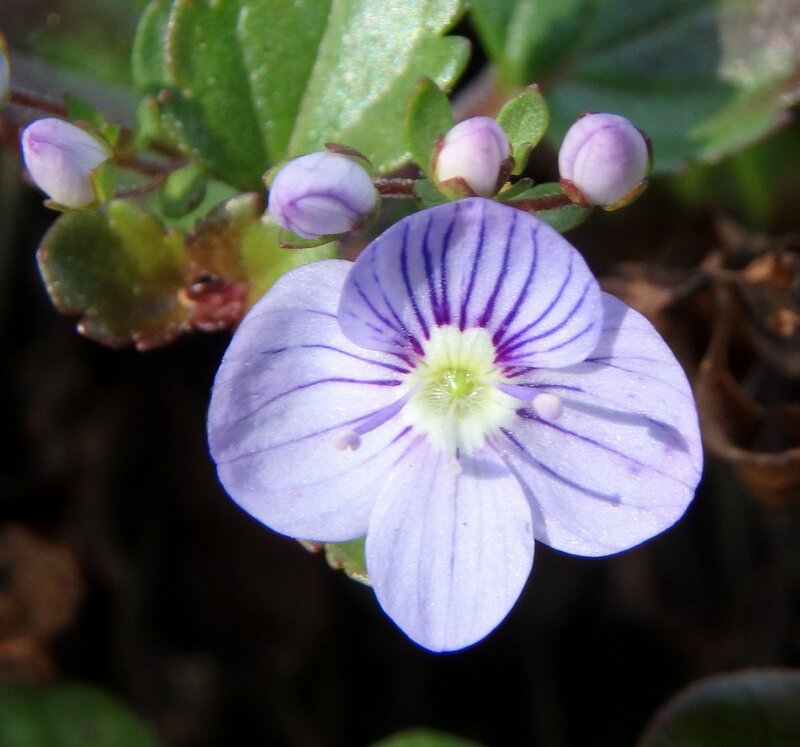 Johnny jump up (Viola tricolor) is still blooming. 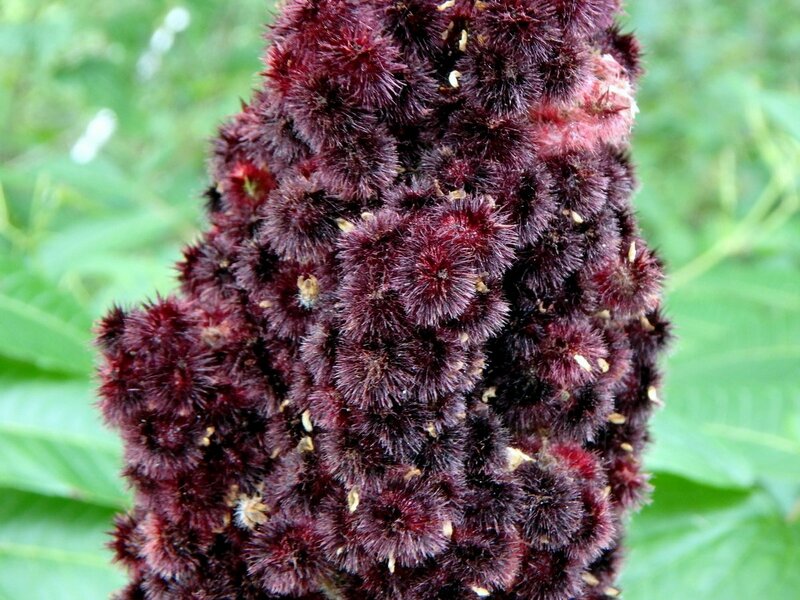 It is plant that has been known for a very long time and goes by many common names. It’s said to have 60 names in English and 200 more in other languages. 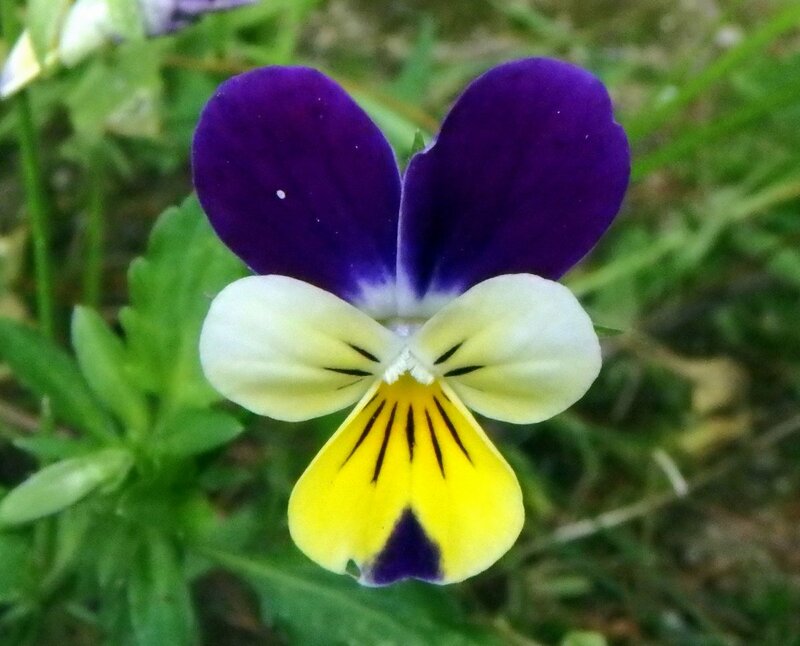 In medieval times it was called heartsease and was used in love potions. Viola tricolor is believed to be the original wild form of all the modern varieties of pansy. I’m lucky enough to have them popping up at the edge of my lawn. I always make sure I miss them with the lawn mower. I saw this pretty bi-color phlox in a friend’s garden. Many phlox blossoms are very fragrant but I forgot to smell this one. 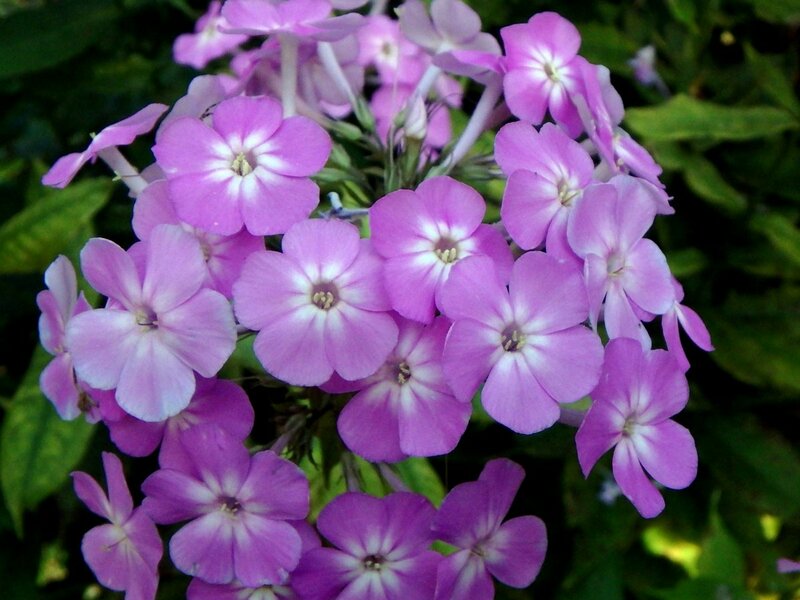 What would a fall garden be without a phlox or two? They’re so beautiful, it’s hard not to love them. 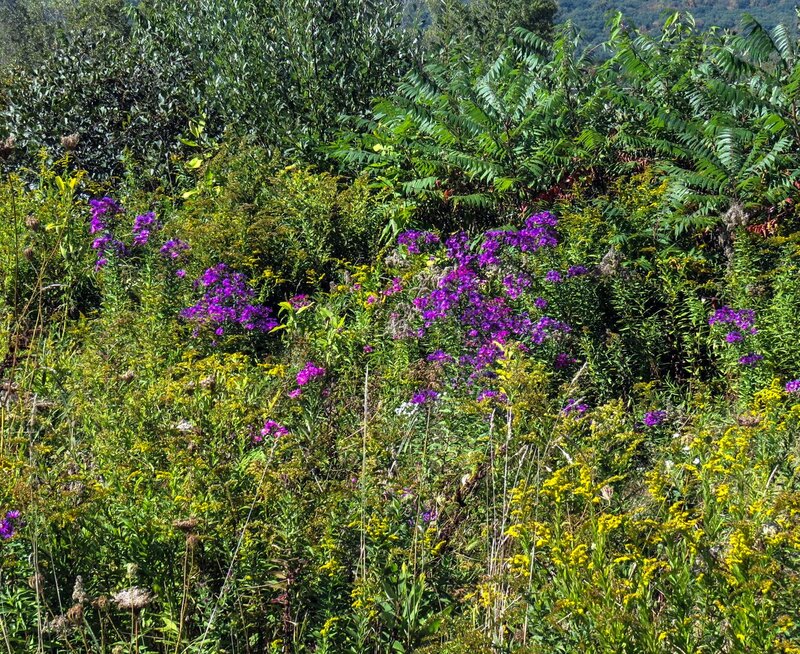 I saw this view of deep purple New England asters (Symphyotrichum novae-angliae) and goldenrods along a roadside recently. In the past I’ve complained that there weren’t enough of these dark purple asters but this year I’m seeing them everywhere I go. I’ve noticed that bees seem to prefer the lighter colored ones but these still had hundreds of bees all over them. In fact every aster plant I’ve seen this year has been just swarming with bees of all kinds. This is a close up of the same flowers that are in the previous photo, but the bright sunshine lightened their color. 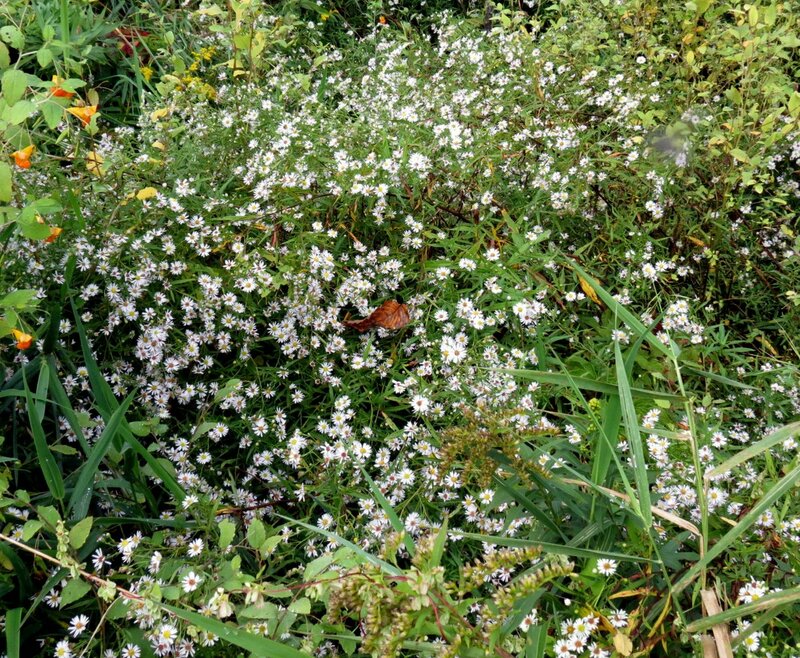 I’ve never seen an aster with so many blooms on it. 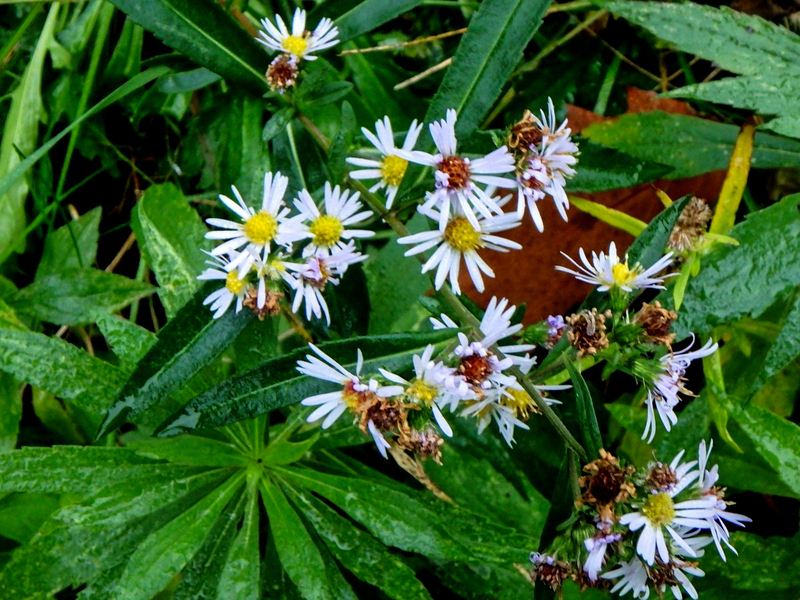 I don’t know its name but this is a cultivated aster that grows in a local park. It’s a very beautiful thing, and quite big. 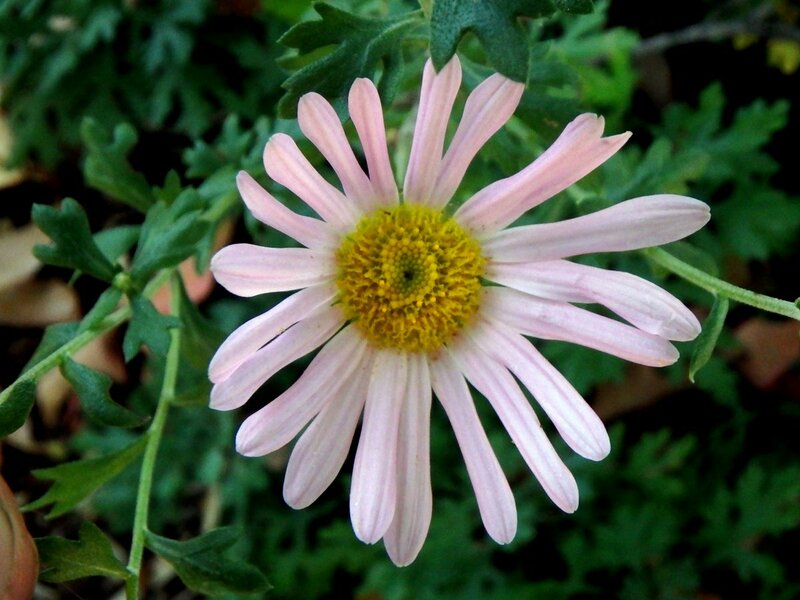 At a glance this might look like an aster but it’s actually a chrysanthemum blossom. Mums are big business here and at this time of year nurseries sell them as fast as they get them. 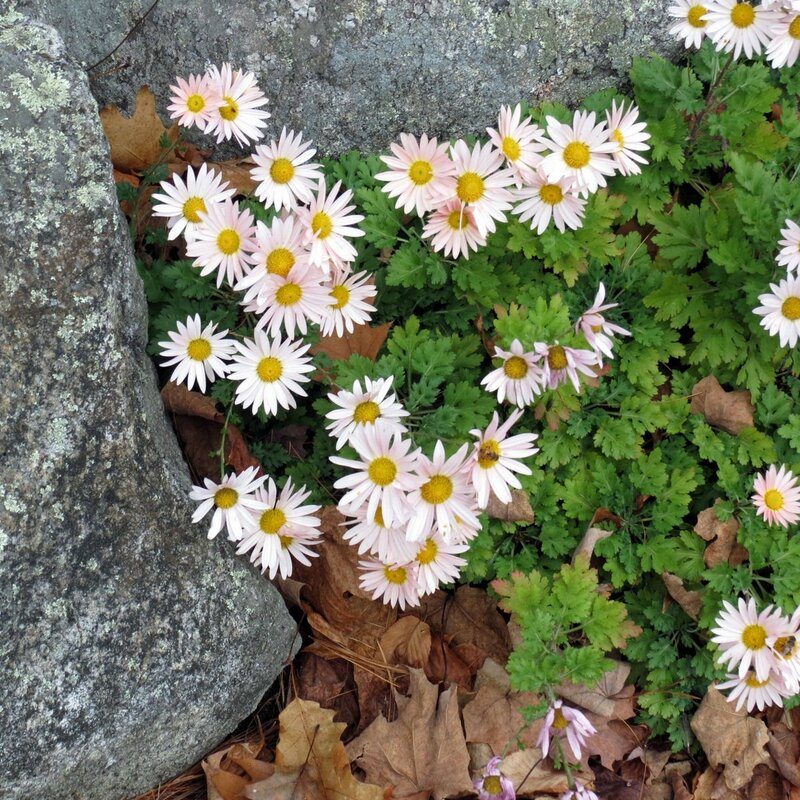 Though they are called “hardy mums” there are few that can really make it through a New Hampshire winter. I have a purple one that has come up for years and many of the white ones will survive. I used to work at a nursery that grew mums from cuttings; ten thousand of them each year, and I’ll never forget having to water them. It took all day, and I had to do it every day that it didn’t rain. I was very happy when they sold. 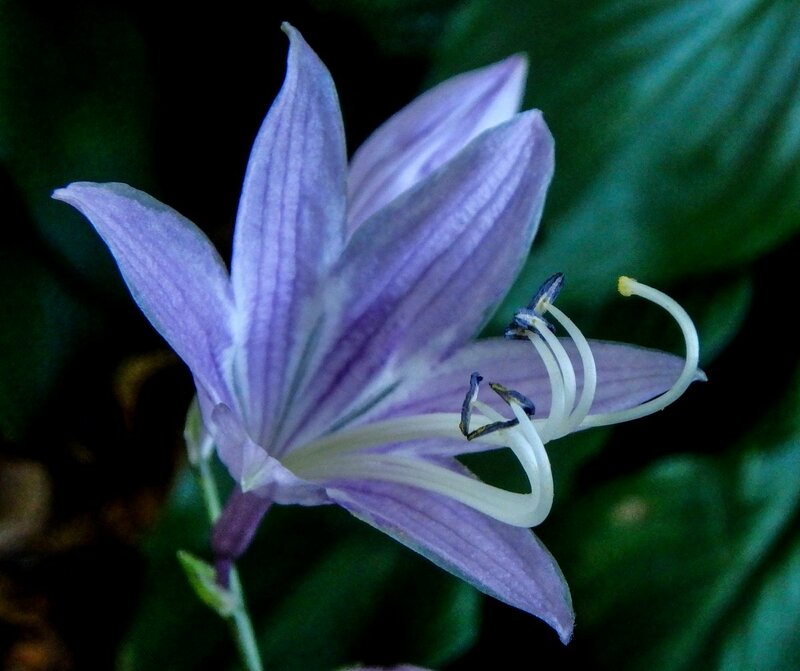 You might think I had found a blue lily but no, this is a hosta blossom. They’re very pretty things but hostas are grown more for their foliage than the flowers. This plant was in a local park and had hundreds of blossoms on it. Sweet everlasting (Pseudognaphalium obtusifolium) won’t be finished blooming until we have a freeze but it doesn’t start blooming as early as black eyed Susans and others do. If you crush a few blossoms and smell them they smell like maple syrup, and that helps identify the plant. Its common name comes from the way it lasts for years after being cut and dried. Usually the plant has many buds rather than open flowers, as this example shows. An odd name for it is rabbit tobacco, given to it by Native Americans because they noticed that rabbits liked to gather where these plants grew. Because of these gatherings they thought that rabbits must smoke the plant as a way to communicate with the Creator. They apparently decided to try smoking it too because it was and still is used in smoking mixtures by some Native people. I’ve never seen a rabbit near it. 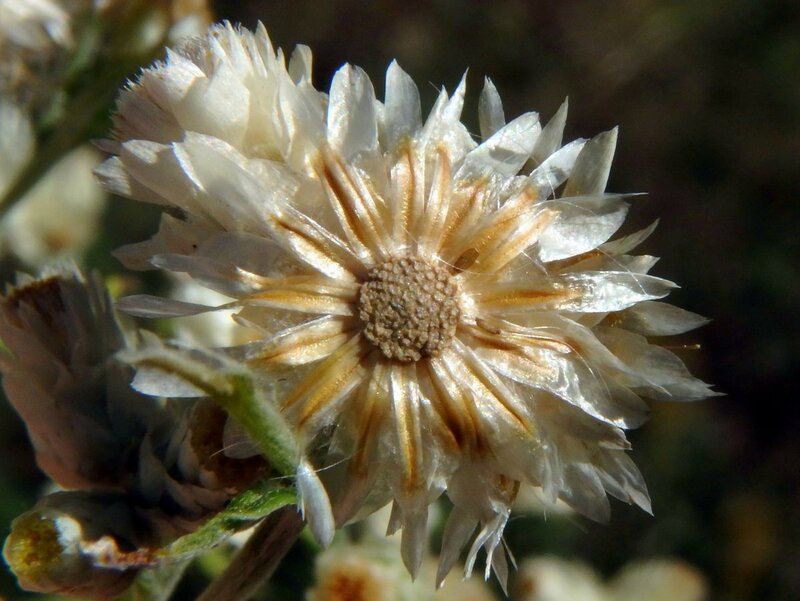 It’s hard to tell when a sweet everlasting blossom is actually fully open, but this is what the seed pods look like after the seeds have been released. It’s as pretty as a flower. 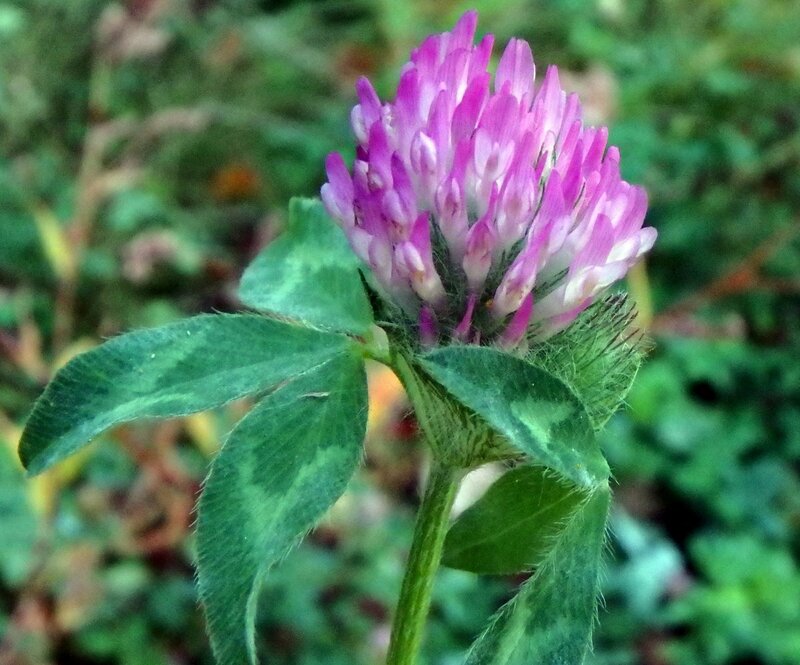 Red clover (Trifolium pretense) is originally from Europe and was brought to this country by English colonials, who used it medicinally and agriculturally. It is a very beautiful thing that often glows with its own inner light, and I have to stop and admire it every now and then. Had I been an early settler I surely would have had a few of its seeds in my pocket. There are a lot of clover plants by the Ashuelot River in Swanzey and in the evening the cottontails come out to eat them. I’ve noticed that when they’re done eating the non-native red clover they go and hide in a thicket of another non-native plant-barberry. Neither man nor beast will follow them into that thicket, and they know it. There are something like 70 species of Helianthus and it’s hard to know which one you’re looking at sometimes. I know this one isn’t the woodland sunflower but that’s about all I know. I like seeing them just the same, whether I can name them or not. 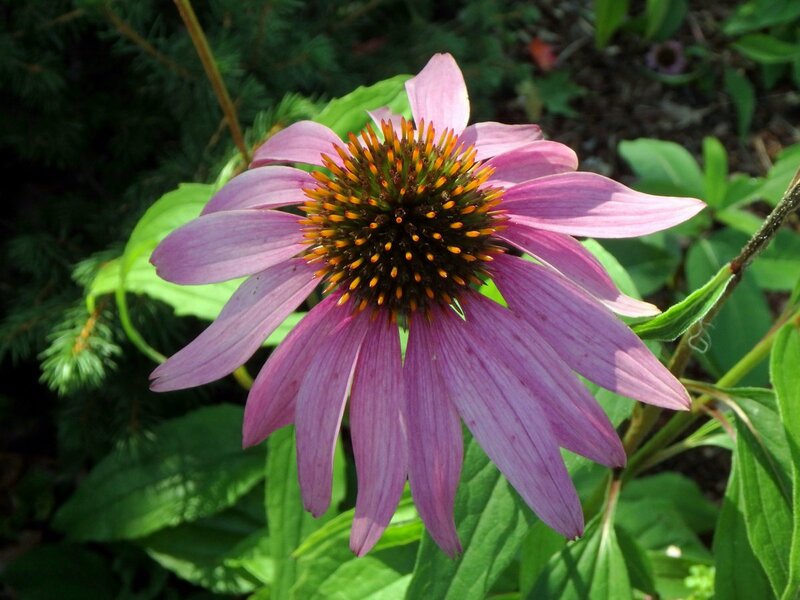 Our native purple coneflowers (Echinacea purpurea) are still blooming but they’ve slowed down quite a lot and are busier making seeds than new flowers. 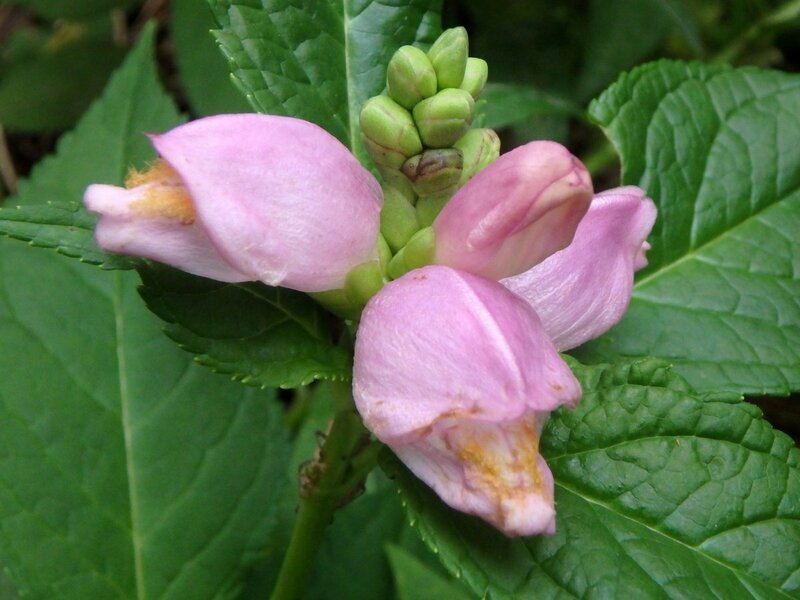 This plant is well known for its medicinal qualities as well as its beauty. According to the USDA the plant was used by many Native American tribes throughout North America to treat a variety of ailments. 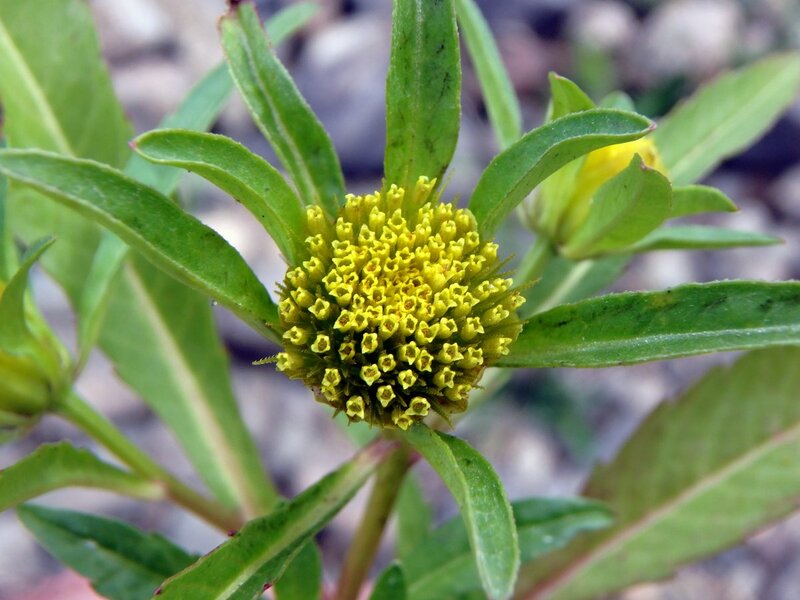 It was used as a pain reliever, anti-inflammatory, as a treatment for toothaches, coughs, colds, and sore throats. It was also used as an antidote for various forms of poisonings, including snake bite. Portions of it were also used to dress wounds and treat infections. Modern medicine has found it useful to combat bacterial and viral infections and as an immune system booster. I grow it because butterflies and bees like its nectar, birds like the seeds, and I like to admire its beauty. Imagine; a sunflower turning its back to the sun. 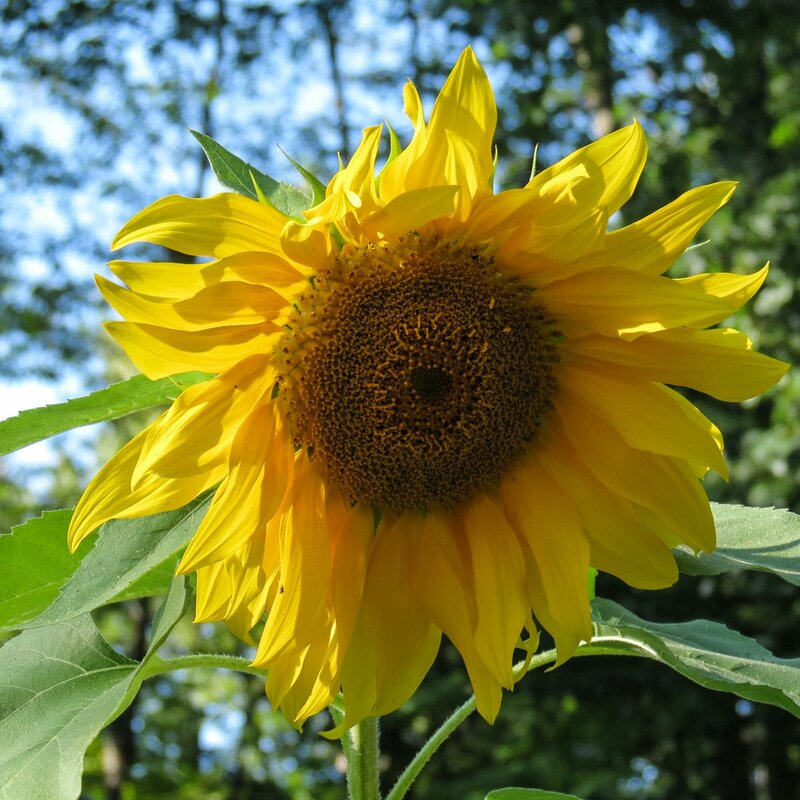 But according to an article on National Public Radio this is normal; scientists have found that once sunflowers mature like the one shown they stop following the sun and face east. When young they greet the sunrise in the east and then as the day progresses they follow it to the west until it sets. During the night time they slowly turn back to the east to again to wait for the next sunrise. They do this through a process called heliotropism, which scientists say can be explained by circadian rhythms, a 24 hour internal clock that humans also have. The plant actually turns itself by having different sides of its stem elongate at different times. Growth rates on the east side of the stem are high during the day and low at night. On the west side of the stem the growth rate is high at night and low during the day, and the differing growth rates turn the plant. I decided to take a walk through my neighborhood recently. I do this now and then when I don’t feel like driving anywhere, but also because it’s a good way to learn about everything that grows in my area. As I’ve said before if someone knocked on my door and asked where to find any one of a hundred different plants, there’s a good chance that I could lead them right to it. That’s when you know that you know a place well. 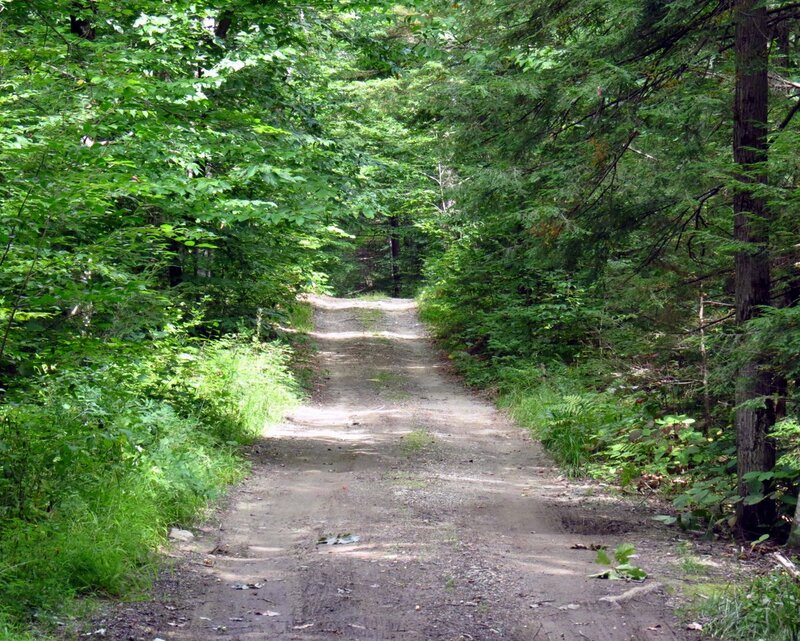 The old road in the above photo cuts through a mixed hard and softwood forest of the kind that is so common here. It makes a pleasant place to walk and look. 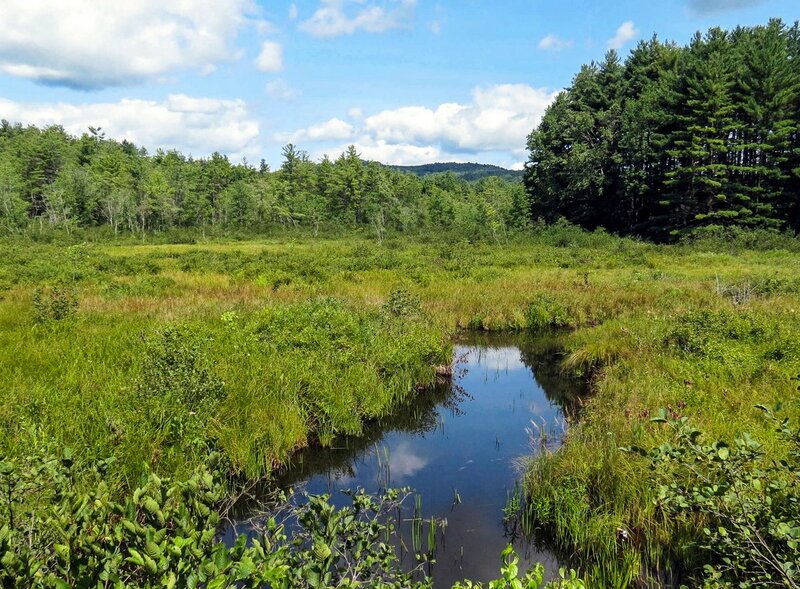 There is a small pond nearby which over the years has gotten smaller and smaller due to the rampant growth of American burr reed (Sparganium americanum.) The plant has now cut the pond in half and I expect the far half to be completely filled in a few more years. I’ve seen many ducks, geese, and great blue heron here in the past but they don’t seem to come very often anymore. I’ve also seen this small pond grow to 3 or 4 times its size after a heavy rain, so full that it overran its banks. That can get a little scary, because that means the one road in and out of the neighborhood can be under water. There is a small grove of gray birch (Betula populifolia) near the pond and I often search their branches to see if any new lichens have moved in. 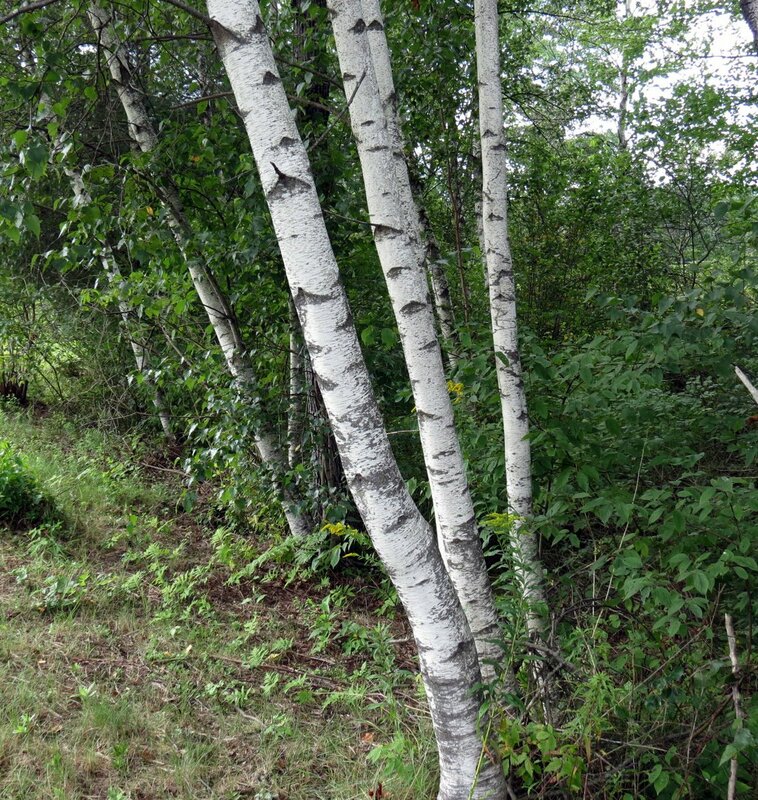 Gray birch doesn’t have the same bright white bark that paper birches do, but lichens seem to love growing on their limbs. 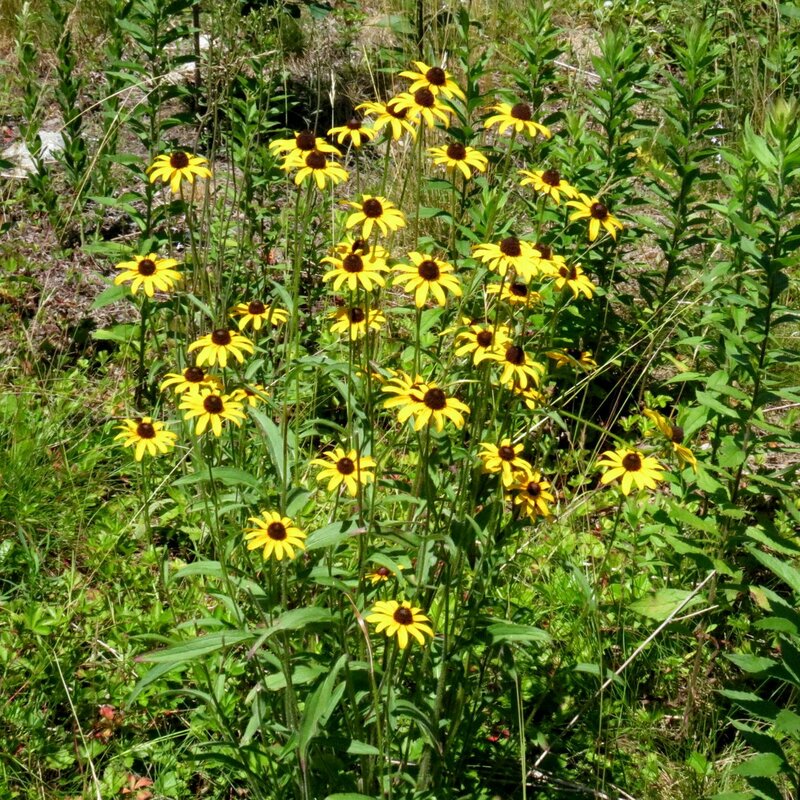 Black eyed Susans (Rudbeckia hirta) bloomed near the pond. This is one of our longest blooming wildflowers. It usually blooms from June right up until a hard October frost. Flat topped white aster (Doellingeria umbellata) also bloomed near the pond. 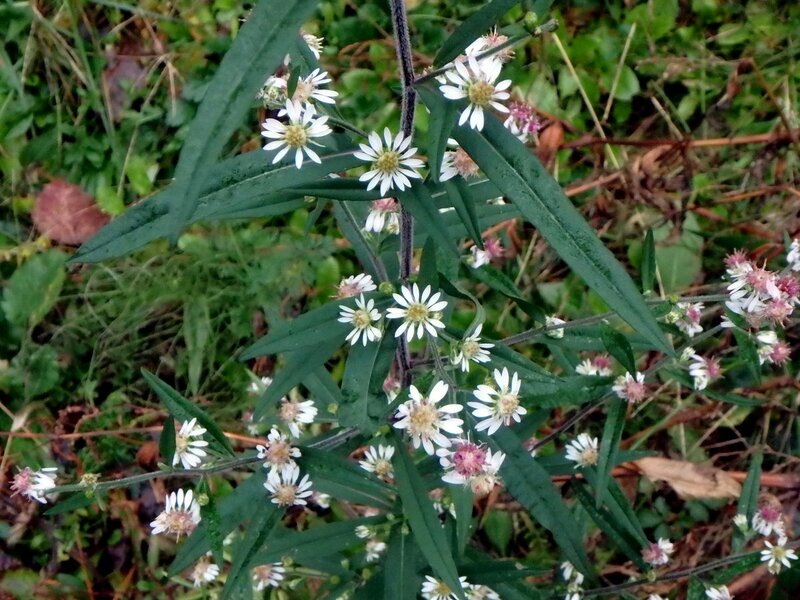 This aster can get 5 feet tall and has smallish white flowers. 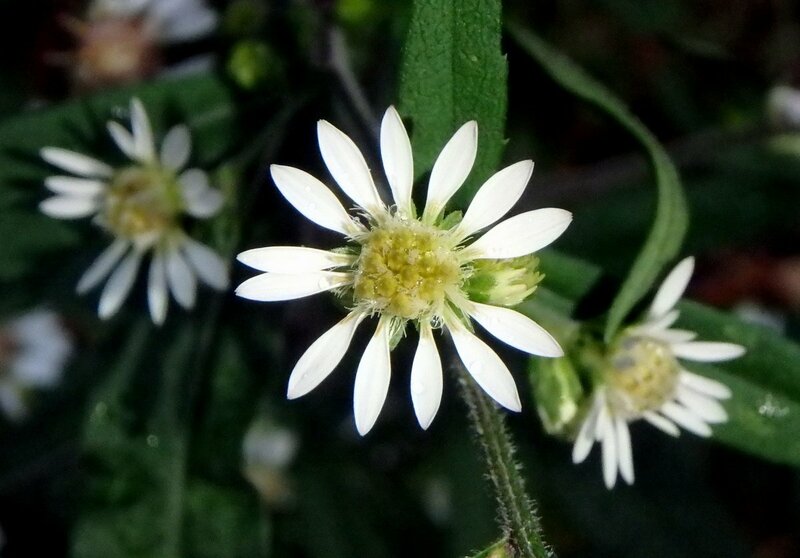 Its common name comes from the large, flat flower heads. Butterflies and other pollinators love it and I often wander down to where it blooms to see if there are any butterflies on it. It likes moist, sandy soil and plenty of sun, and it often droops under its own weight as it did here. Hedge bindweed (Calystegia sepium) winds itself among the tall stems of the flat topped white asters. 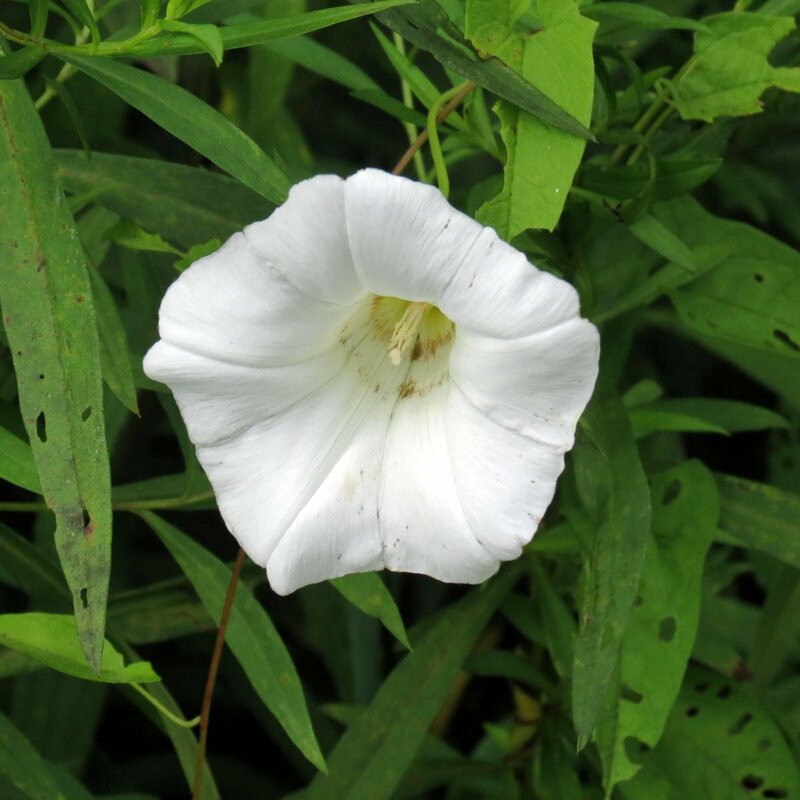 It is said that bindweed purifies and cleanses the body and calms the mind. Native Americans used the plant medicinally for several ailments, including as an antidote to spider bites. 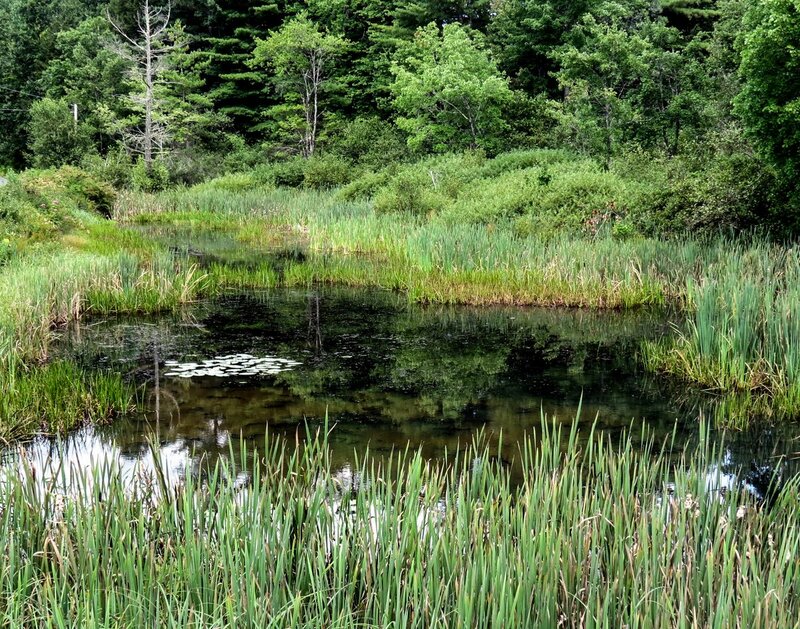 The small pond that I showed a photo of previously eventually empties into a large swamp, which is called a wetland these days. I’m guessing that beavers and muskrats keep the water way open through it; it has been this way for as long as I’ve lived in the area. I’ve seen two odd things on staghorn sumac (Rhus typhina) this year that I’ve never seen before. First, when the berries were ripening they went from green to pinkish purple to red instead of from green to red, and now they are a dark purple, which from a distance looks black. I wonder what is going on with these plants. I’ve never seen this before. 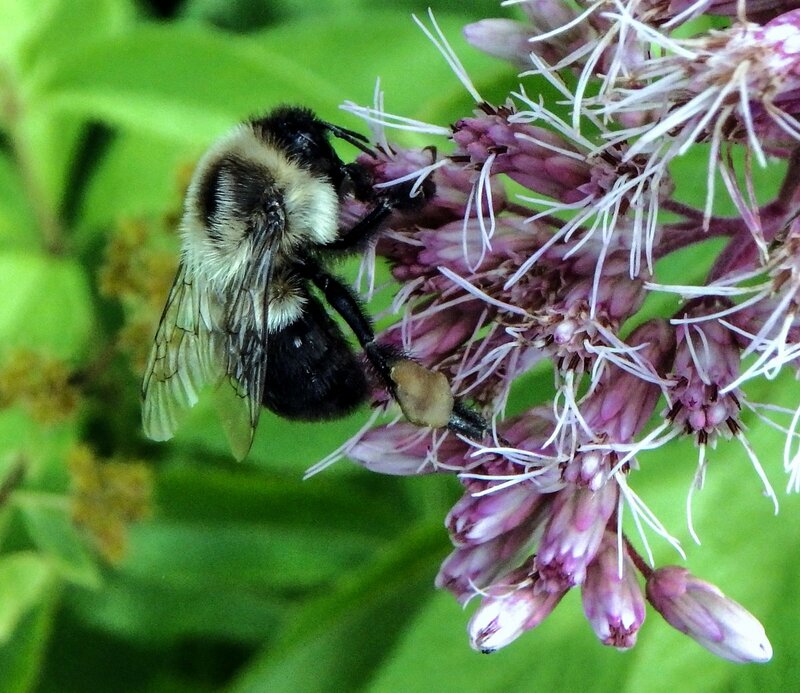 A bumblebee worked hard on Joe Pye weed blossoms. Soon the cooler nights will mean that bumblebees will be found sleeping in flowers in the morning. Native rough hawkweed (Hieracium scabrum) is one of the last of our many hawkweeds to bloom. 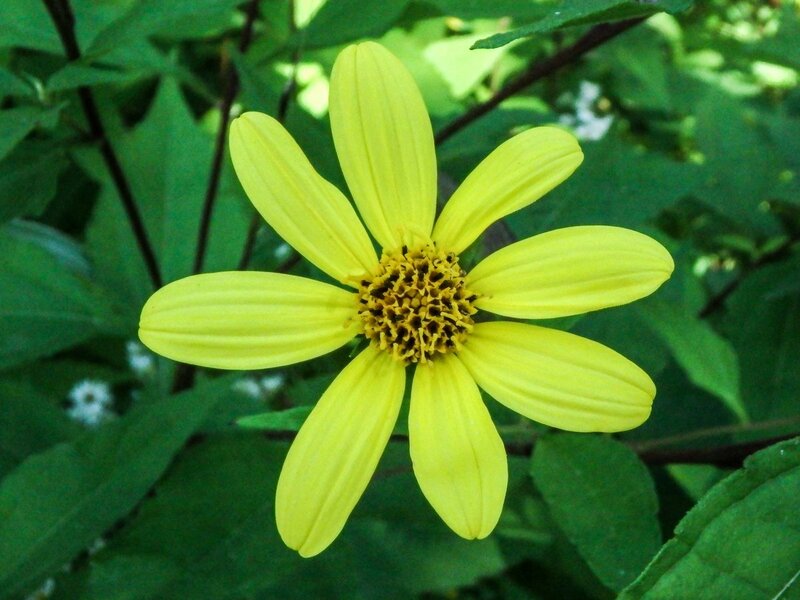 An unbranched single stem rises about knee high before ending in a terminal cluster of small yellow flowers. 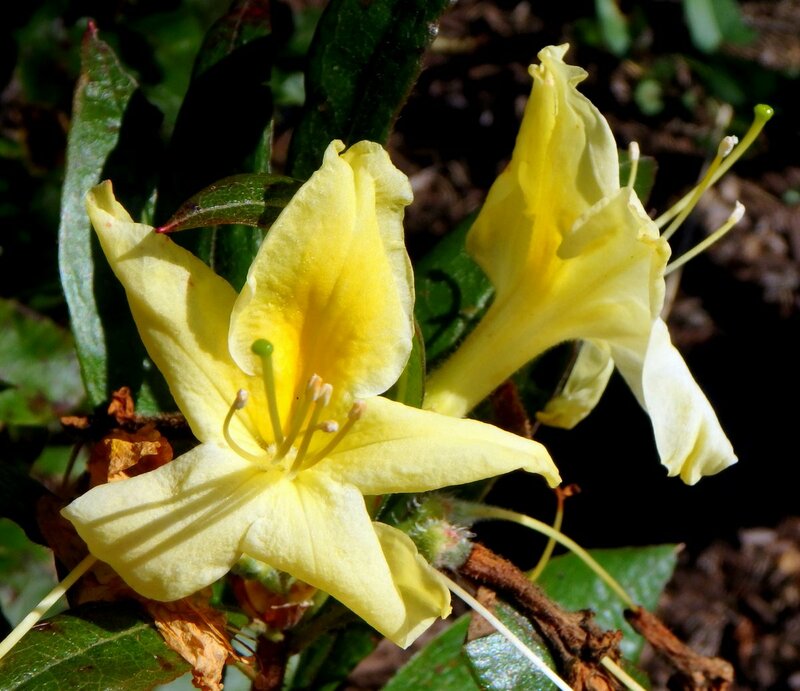 The plant blooms in full sun in late summer into early fall for about 3-4 weeks. 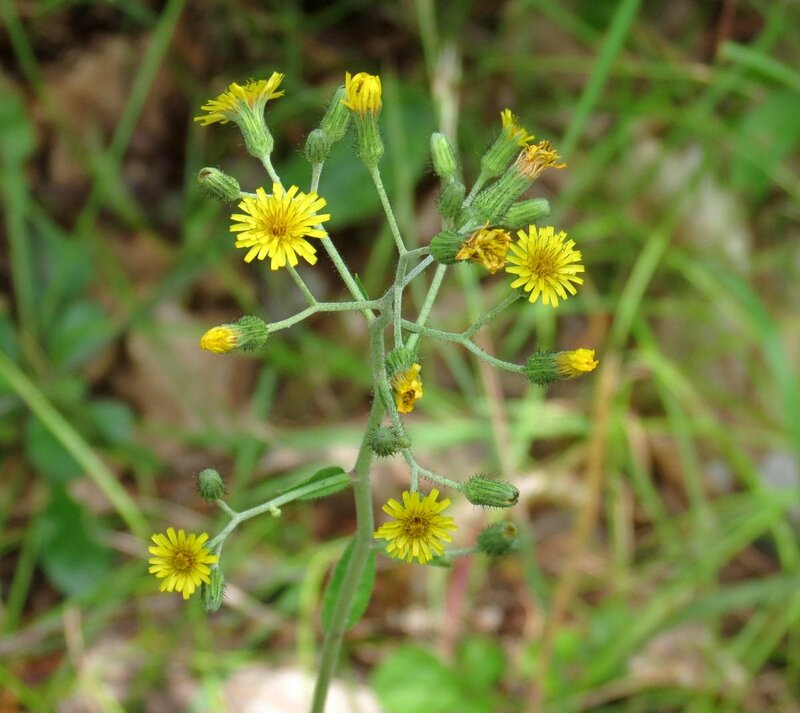 Many species of hawkweed, both native and introduced, grow in the United States and I’d guess that we must have at least a dozen here in New Hampshire. Some of our native hawkweeds bleed a bitter white latex sap and Native Americans used to use it for chewing gum. I’m guessing that they had a way to remove the bitterness and probably found ways to flavor it too. 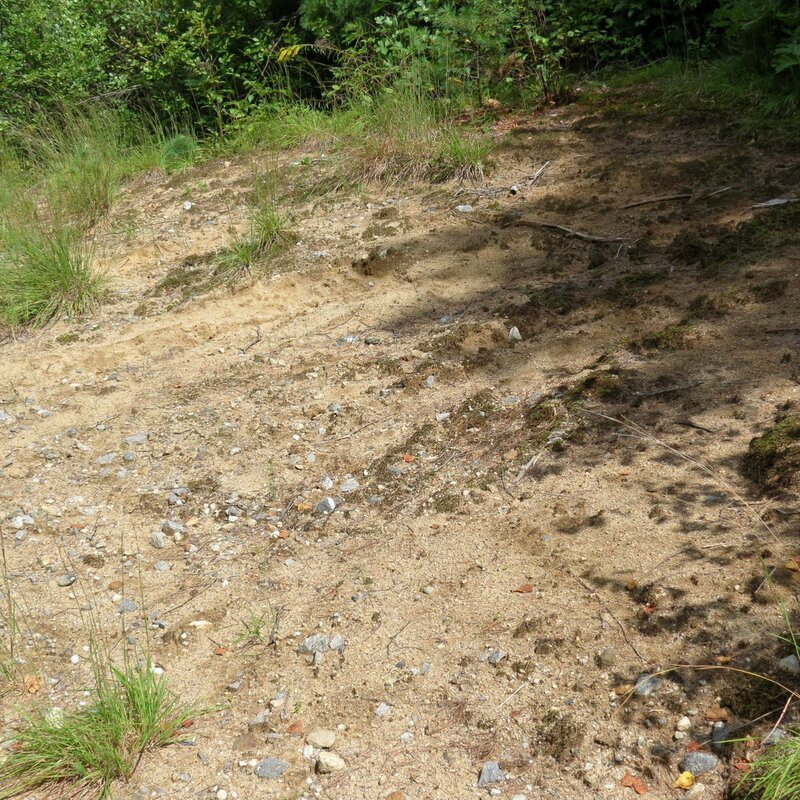 There is a lot of sand in this area and it is one of only two places that I know of where sand jointweed (Polygonum articulatum) grows. I didn’t see any of the tiny white flowers on this walk but I did see the plants. They should be blooming any time now and will appear in a future flower post. 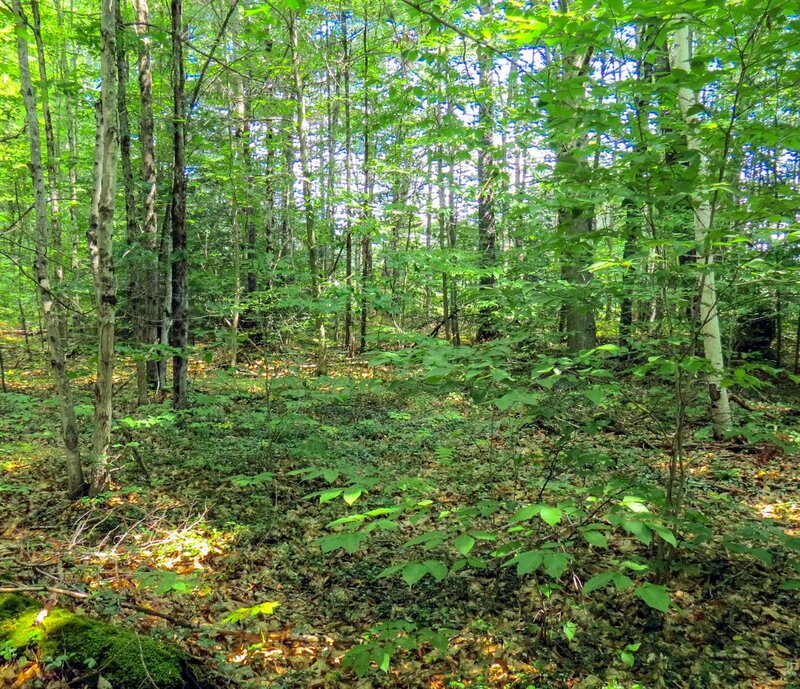 I’ve found that it is close to impossible to get a photo of a forest while you’re in it. I’ve tried many times but it never seems to work. There’s just too much going on. 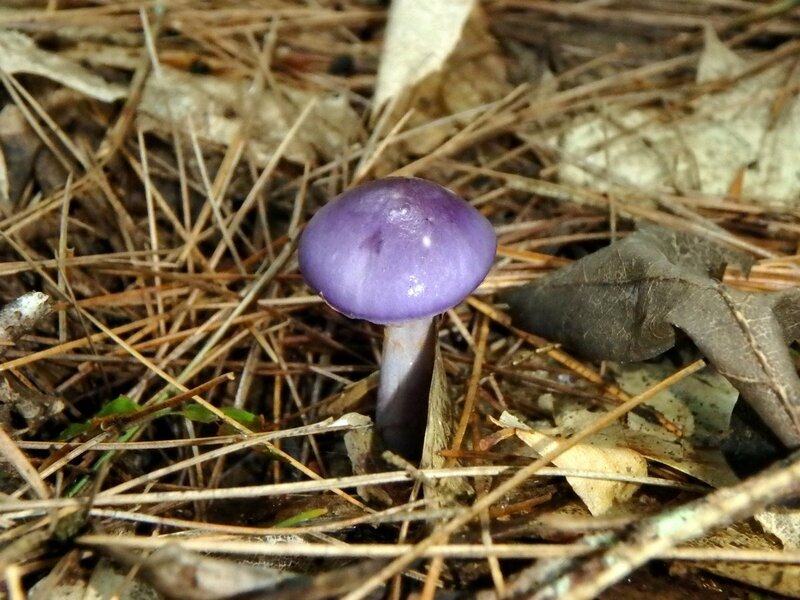 So since I can’t get a good photo of the forest itself instead I take photos of the things that live there, like this purple cort mushroom (Cortinarius iodeoides.) Purple corts are having an extended fruiting time which is now in its fourth week, I think. I’ve never seen so many and I’ve never seen them fruiting over such a long period of time. 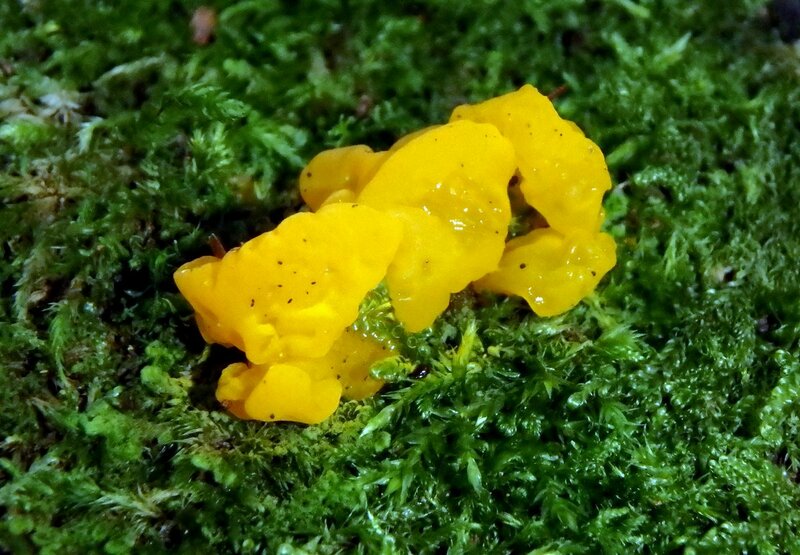 Something else that’s is strange in the fungi kingdom this year is how jelly fungi like this witch’s butter (Tremella mesenterica) has fruited all summer long. I usually only see it in early spring, late fall and winter when it is colder. It could be because of all the rain I suppose; jelly fungi are almost all water. I almost always find them on stumps and logs; often on oak. After a rain is always the best time to look for them because they’re at their best when well hydrated. We’ve had at least a day of rain each week all summer but it’s been on the dry side over the past couple weeks, so I was surprised to see this white finger slime mold (Ceratiomyxa fruticulosa, variety fruticulosa) growing on a log. The log was very rotten and held water like a sponge, so maybe that’s why. There is a small glade of lady ferns (Athyrium filix-femina) out here and I like to stop and admire the lacy patterns they produce and how they wave in the breeze like they were on this day. Bracken ferns (Pteridium aquilinum) are starting to show some fall color. 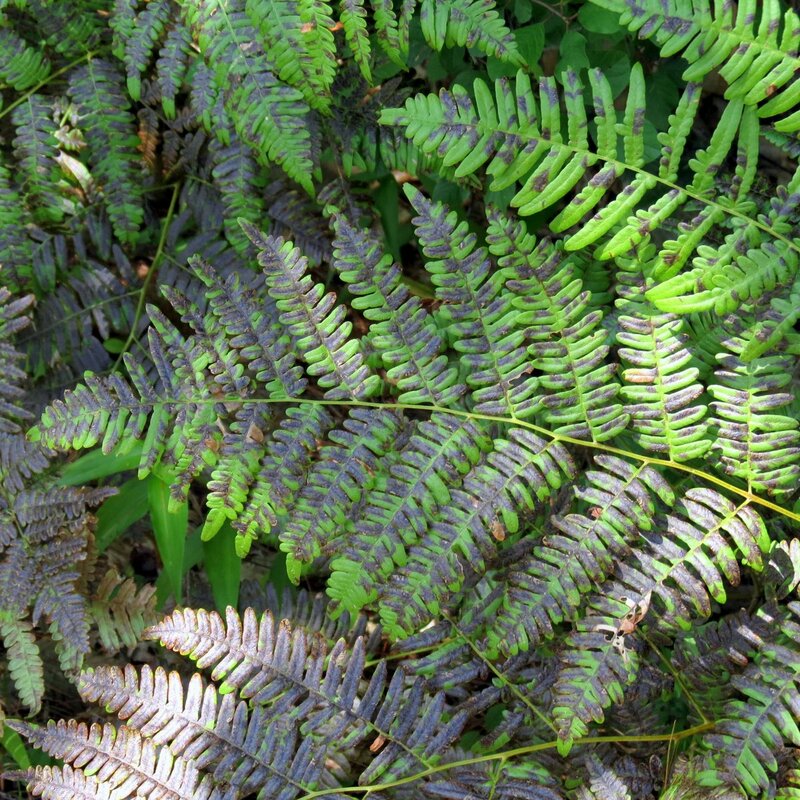 Bracken is one of the oldest ferns; fossils date it to over 55 million years old. 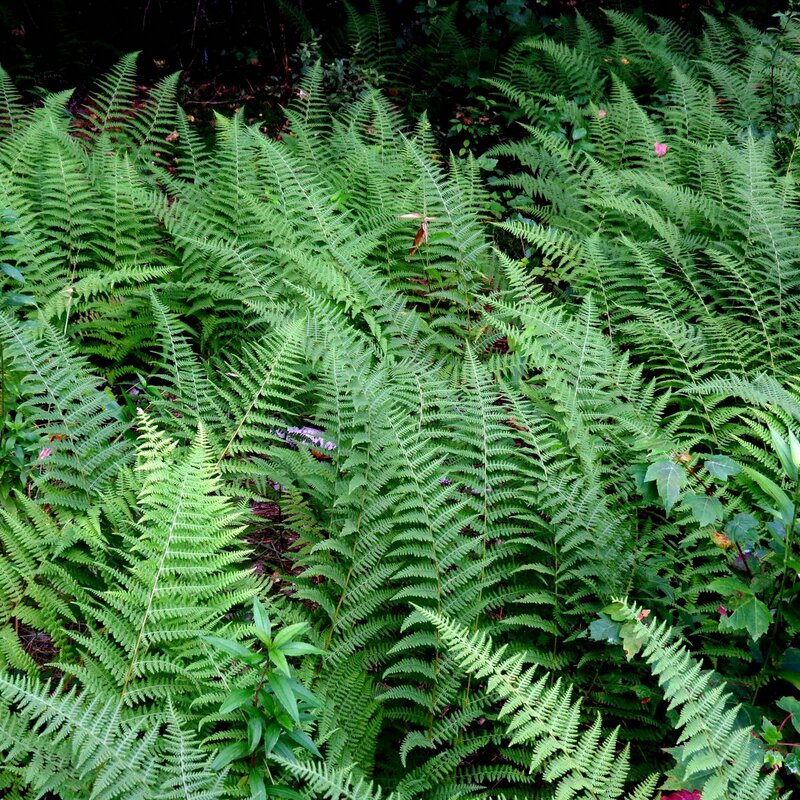 The plant releases chemicals which inhibit the growth of other plants and that is why large colonies of nothing but bracken fern are found. Some Native American tribes cooked and peeled the roots of bracken fern to use as food but modern science has found that all parts of the plant contain carcinogens. Wild sarsaparilla (Aralia nudicaulis) is also starting to turn. These plants sometimes turn a deep purplish maroon in fall but more often than not they go to yellow. 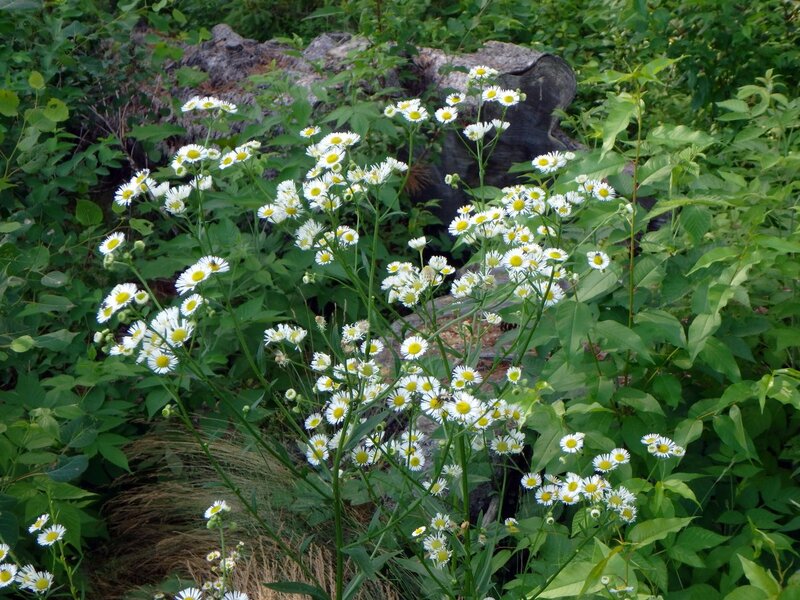 Native Americans used the root of this plant as emergency food and it was also once used to make root beer. 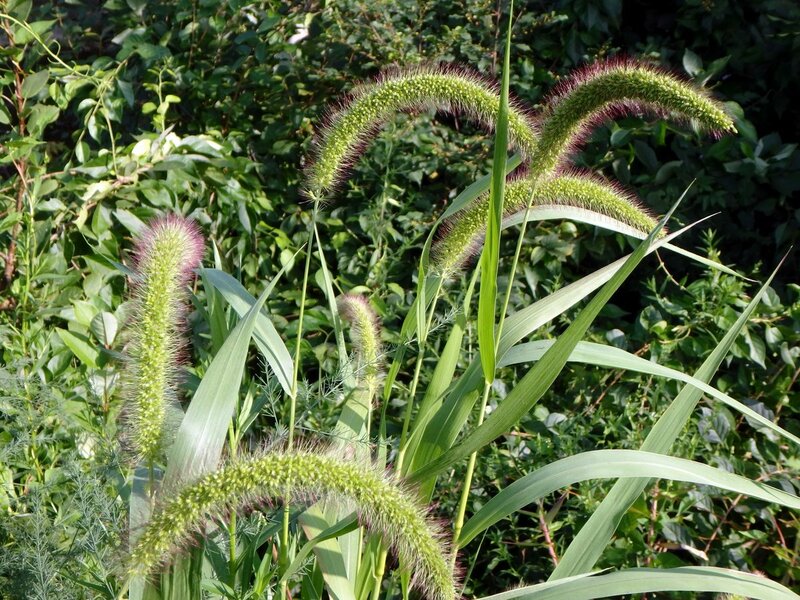 Giant foxtail grass (Setaria faberi) grew in a sunny spot at the edge of the forest. This is a big annual grass that can form large colonies. Its nodding, bristly, spike like flower heads (panicles) and wide leaves make it easy to identify. 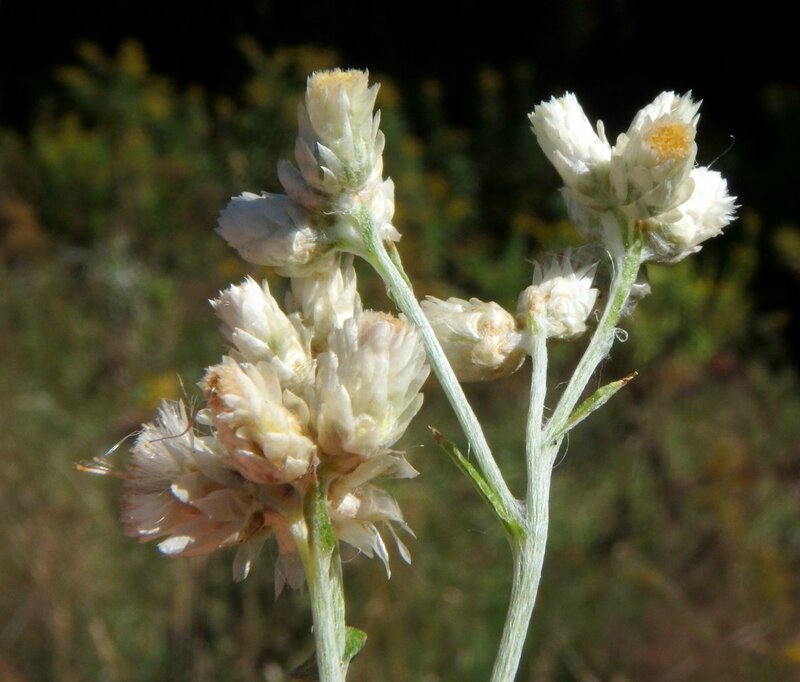 The flower heads go from light green to straw colored as they age. This walk ends in a meadow full of little bluestem grass (Schizachyrium scoparium,) which is one of my favorite grasses. I hoped to show you its flowers but it was a little early for it to be blooming. 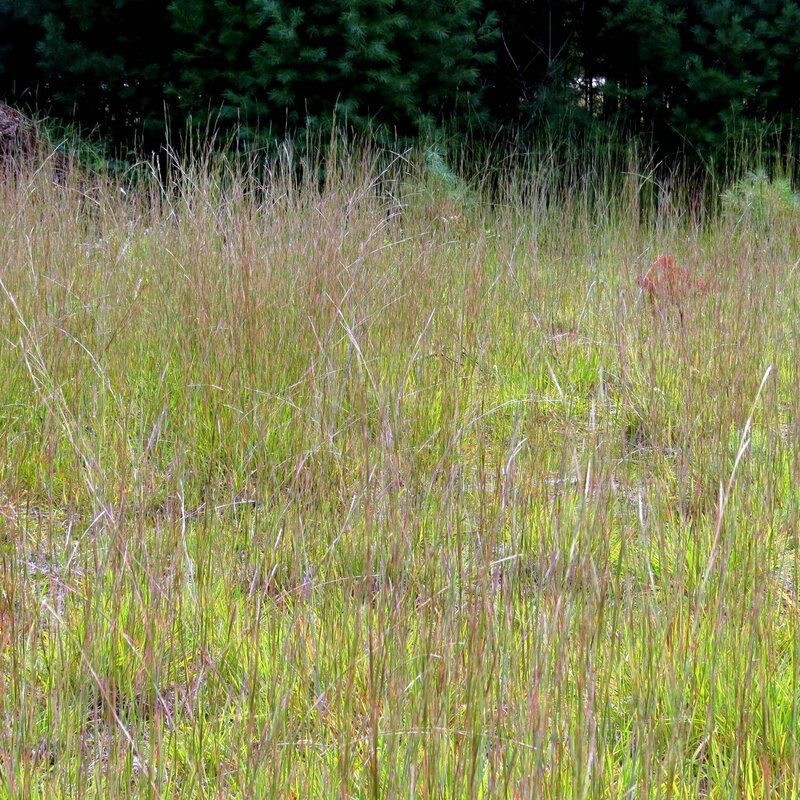 Little bluestem is a pretty native grass that is grown in gardens throughout the country. It’s very easy to grow and is drought resistant. Purplish-bronze flowers appear usually in August but they’re a little late this year here.